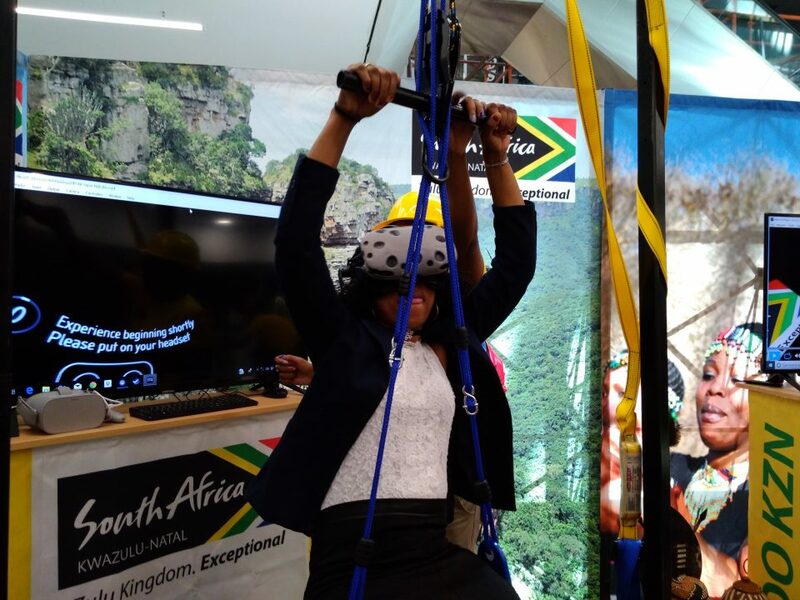 Virtual Reality in the Tourism industry! 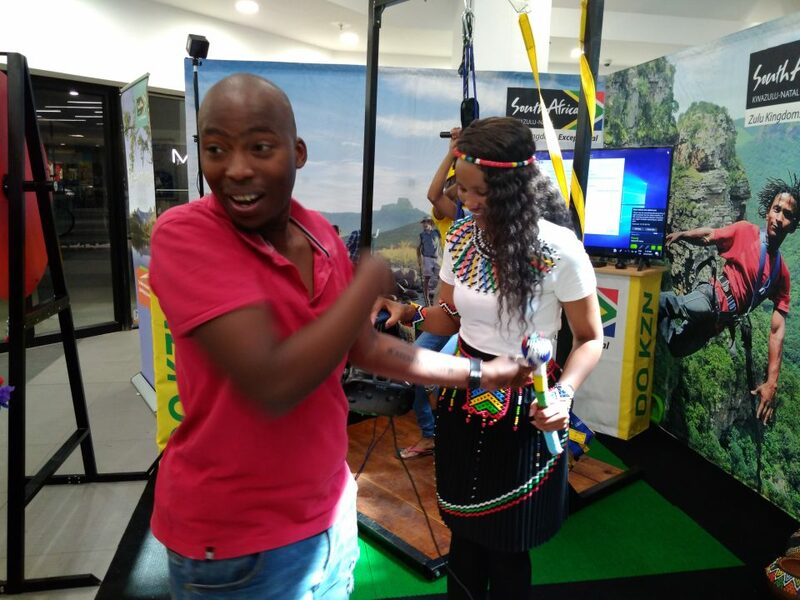 We literally had people experiencing three of the best KwaZulu Natal Tourism Activities in Bloemfontein in the Mall, without them leaving the mall! 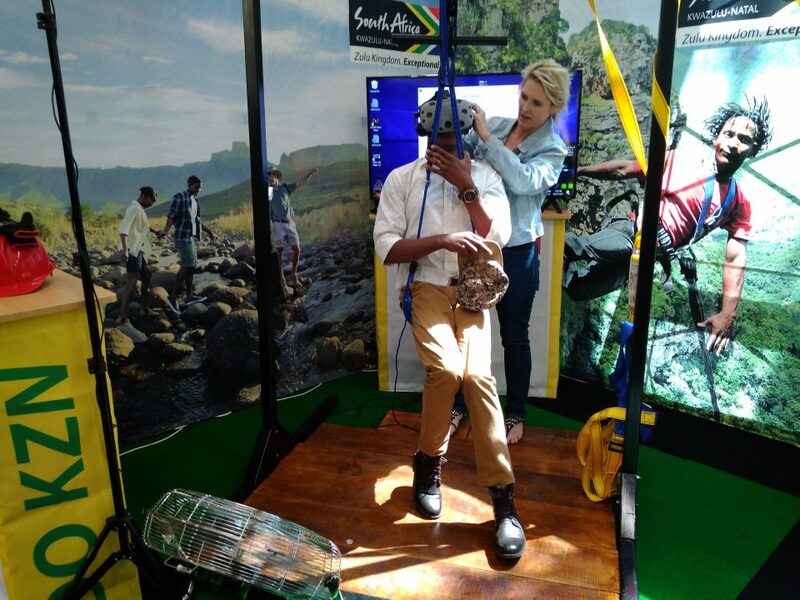 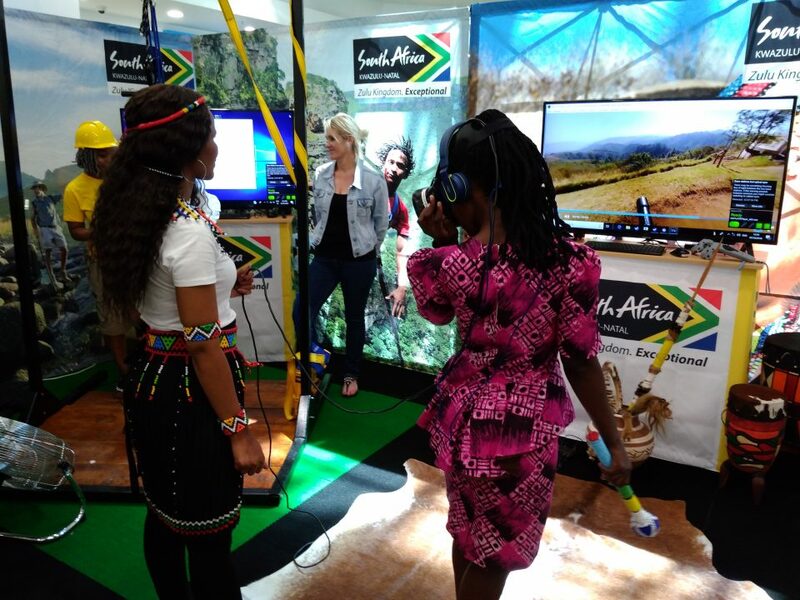 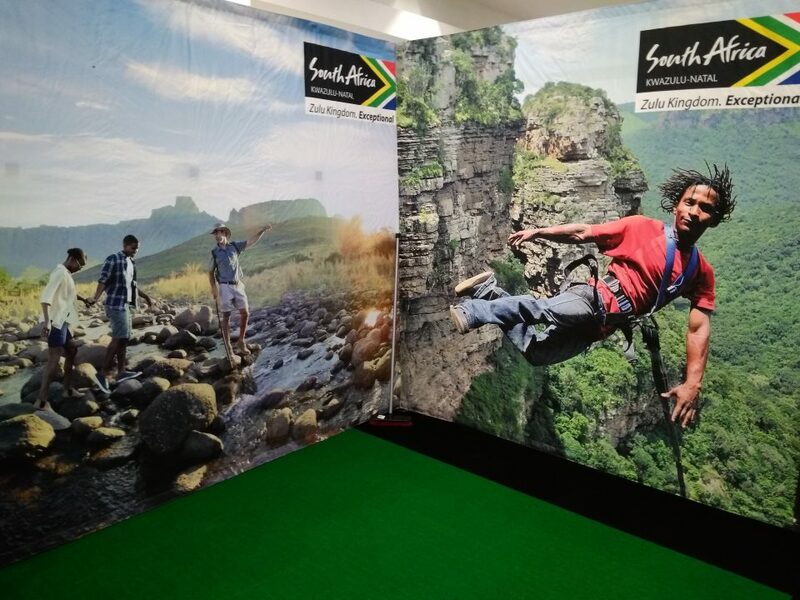 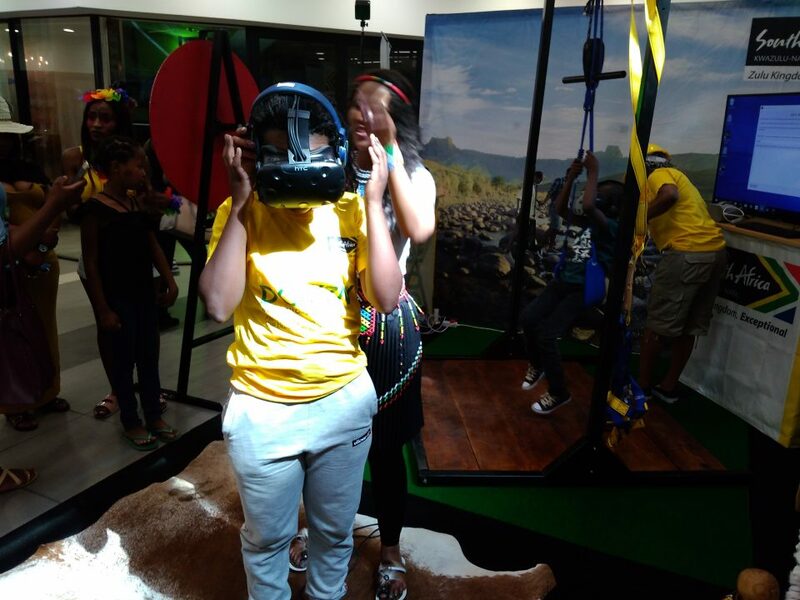 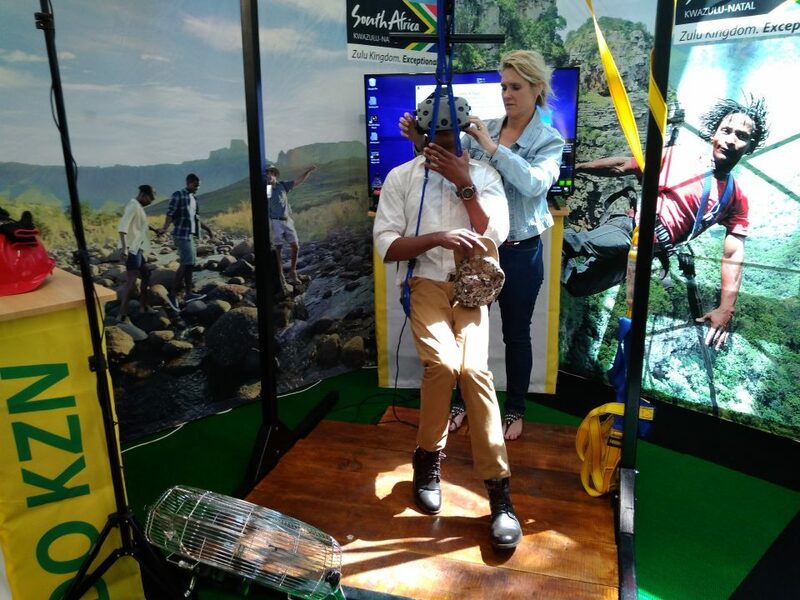 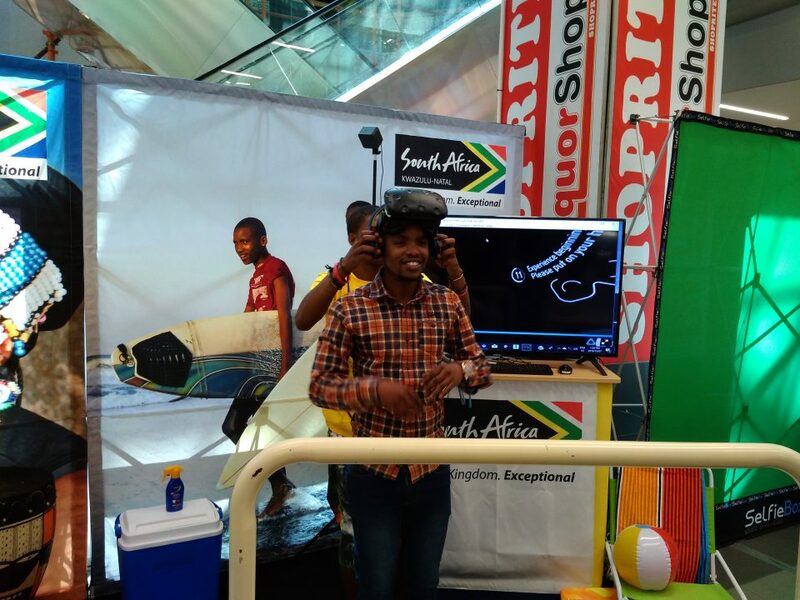 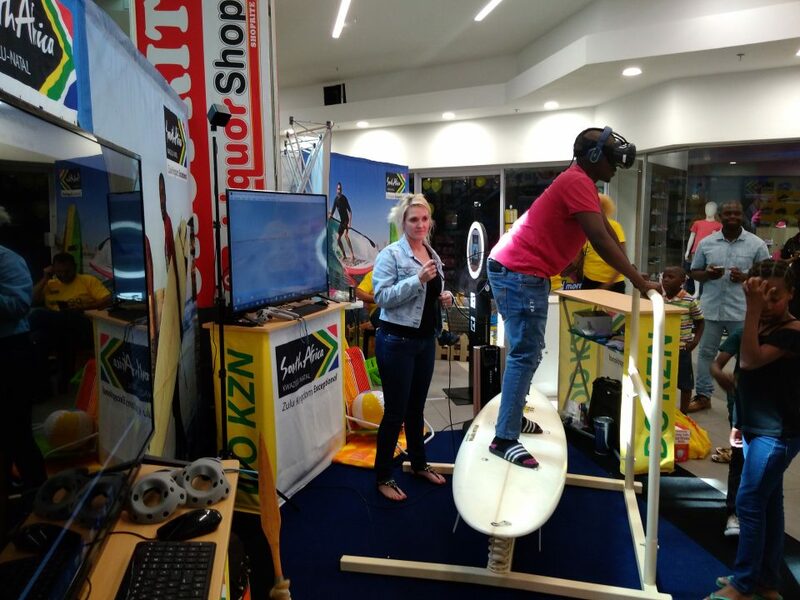 We recently assisted Splendid Marketing with a virtual reality event for KwaZulu-Natal tourism. 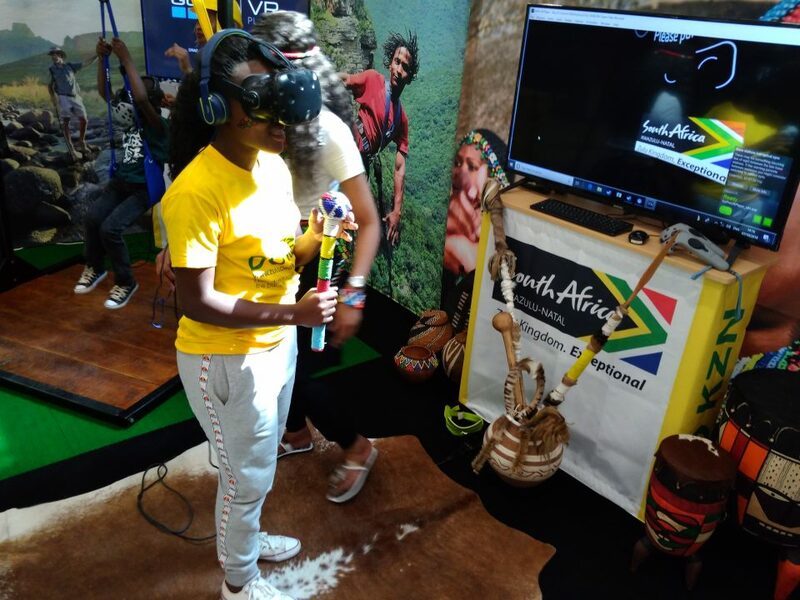 This Virtual Reality activation took place in Bloemfontein Free State during the Macufe Festival 2018. 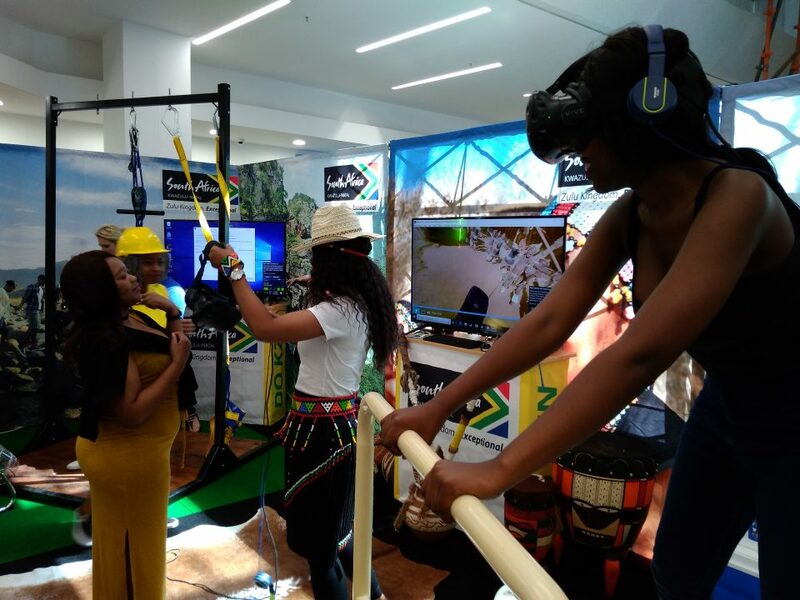 We were responsible for the stand design, the virtual reality activations and the design of the physical props for the event. 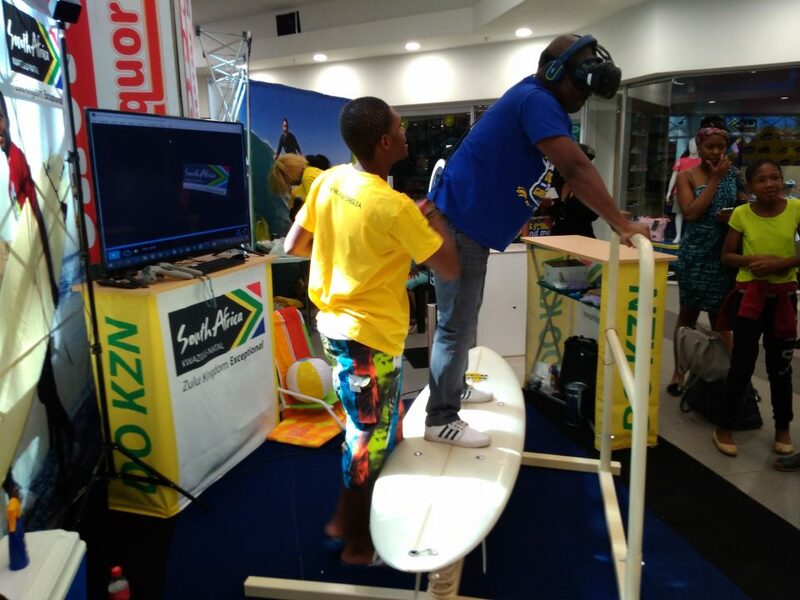 This was one of the first virtual reality activations where we were responsible for the stand build itself. 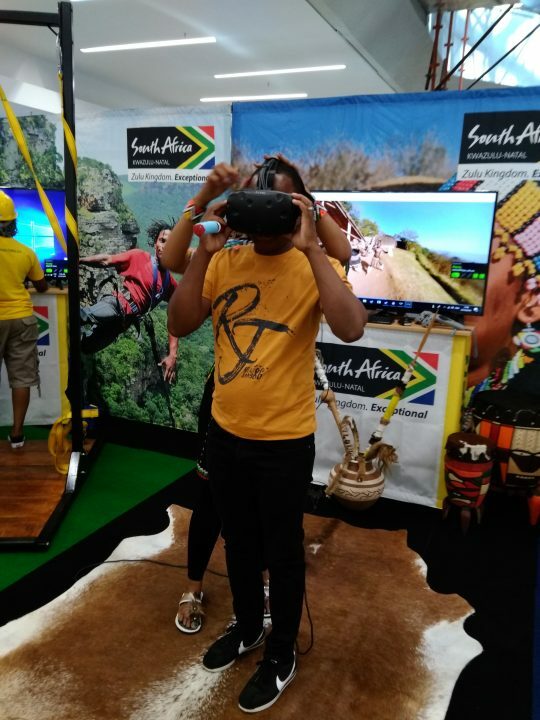 During the pitch for the event we made use of virtual reality to design the stand in a virtual reality environment and showcased it to the client. 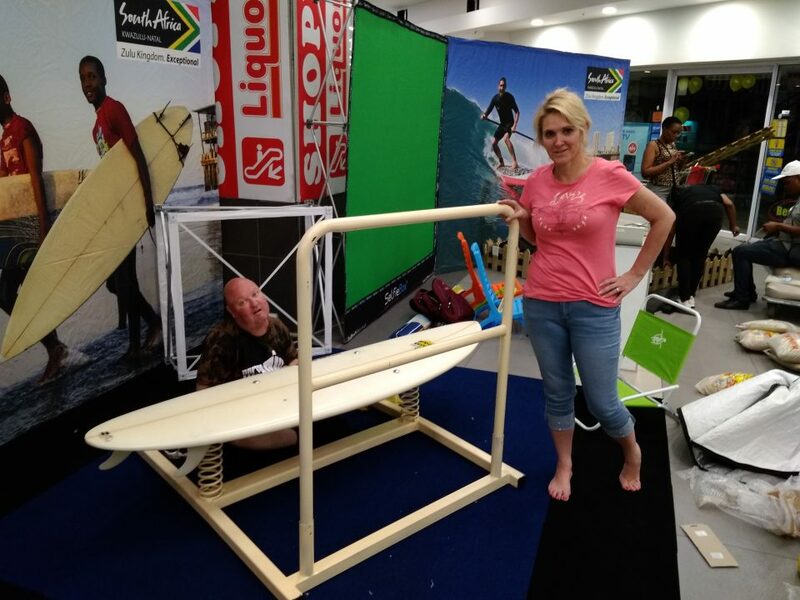 This gave the client a clear view of what the stand was going to look like and helped us in designing and developing the surfboard and zip line props. 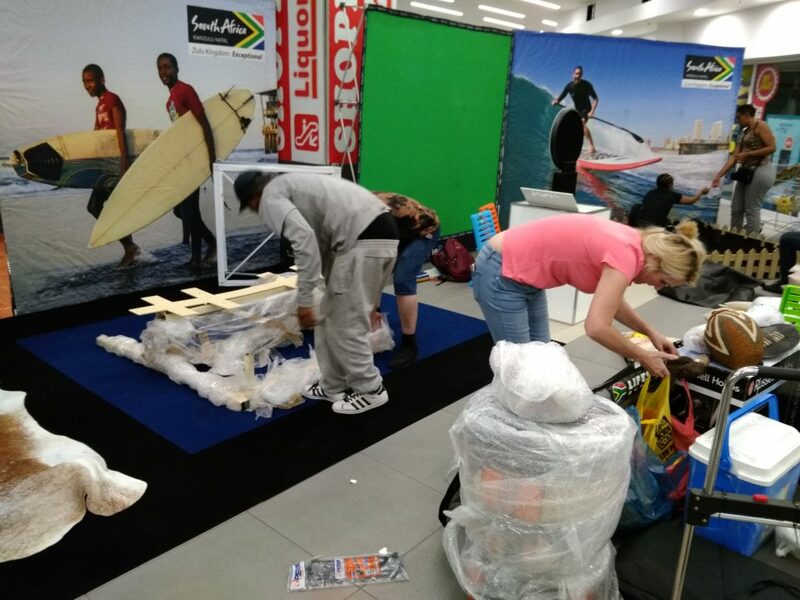 It also helped us to improve the overall stand layout and optimal use of the space available. 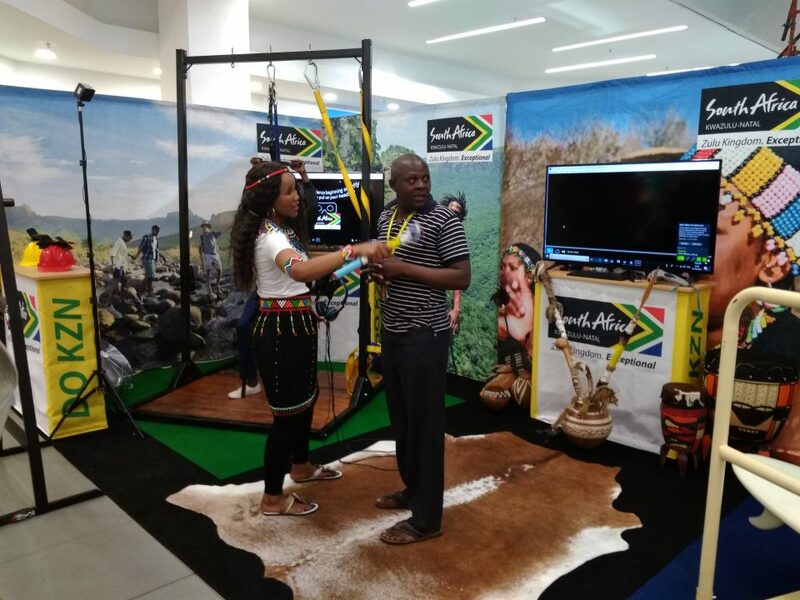 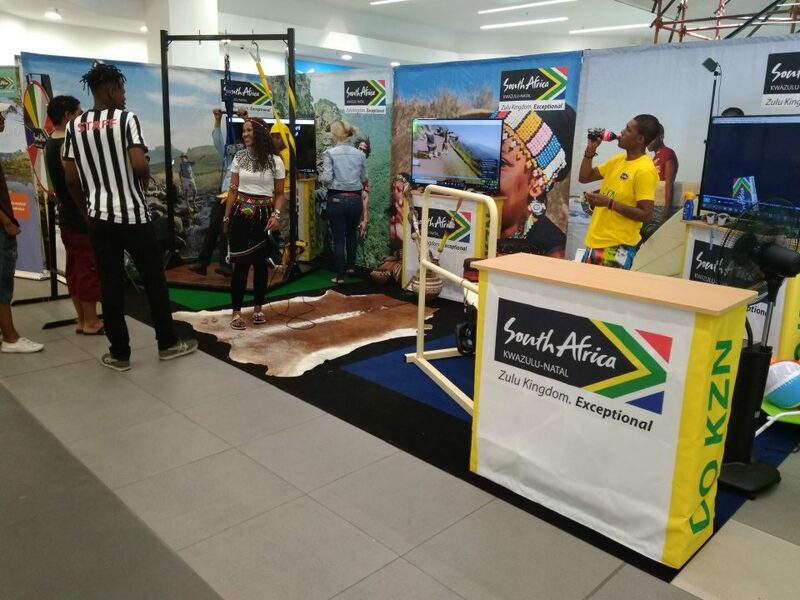 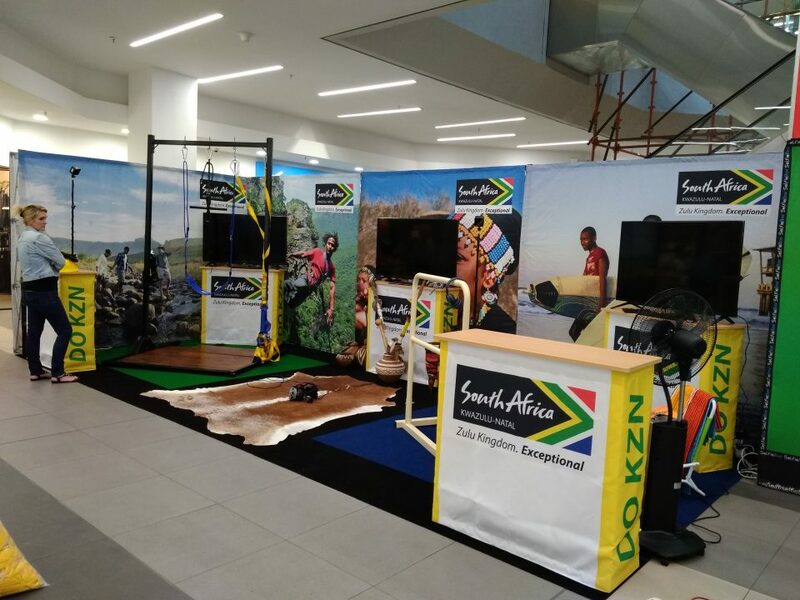 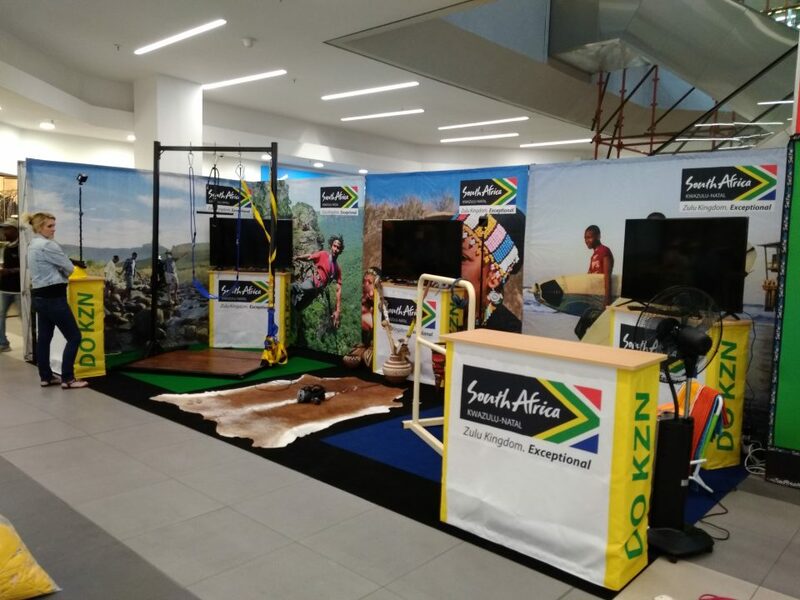 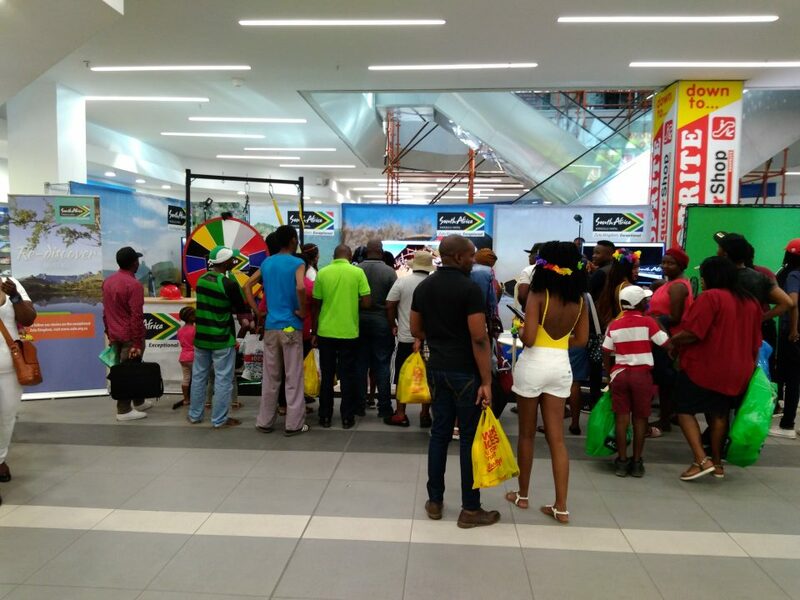 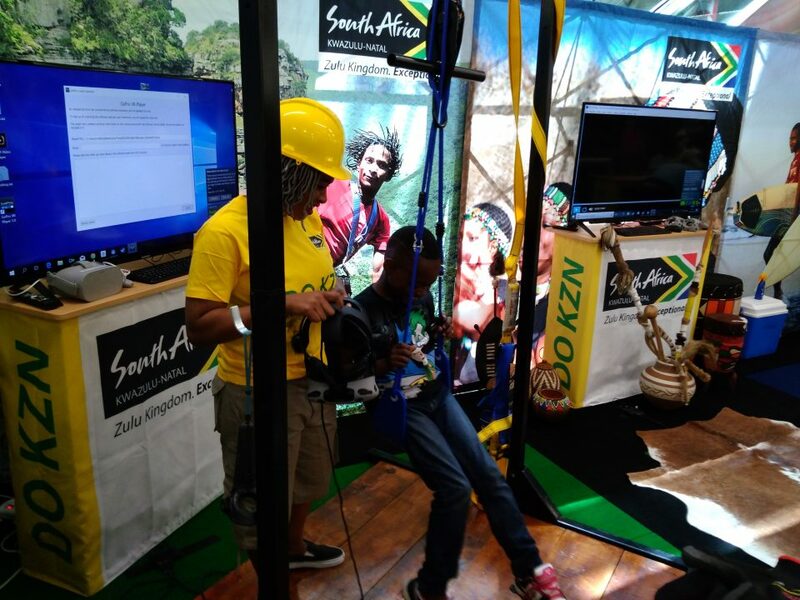 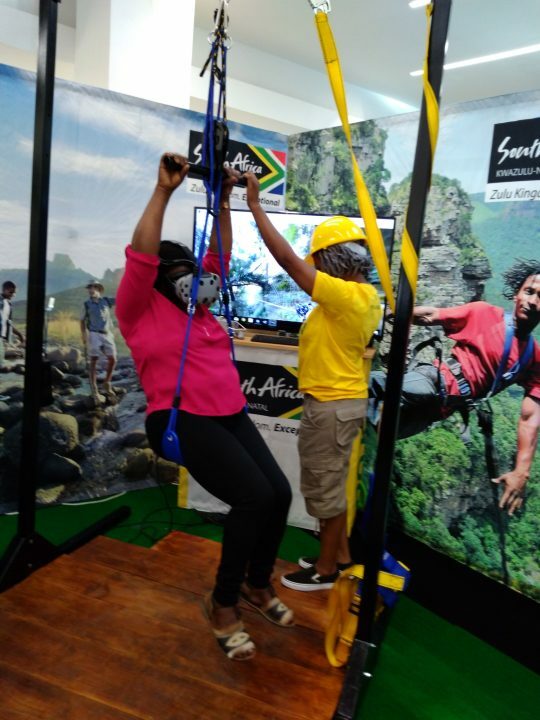 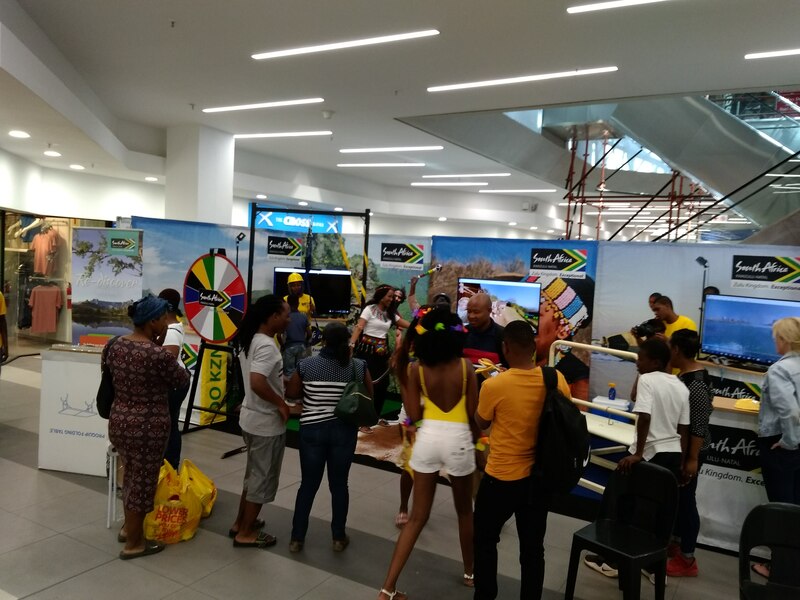 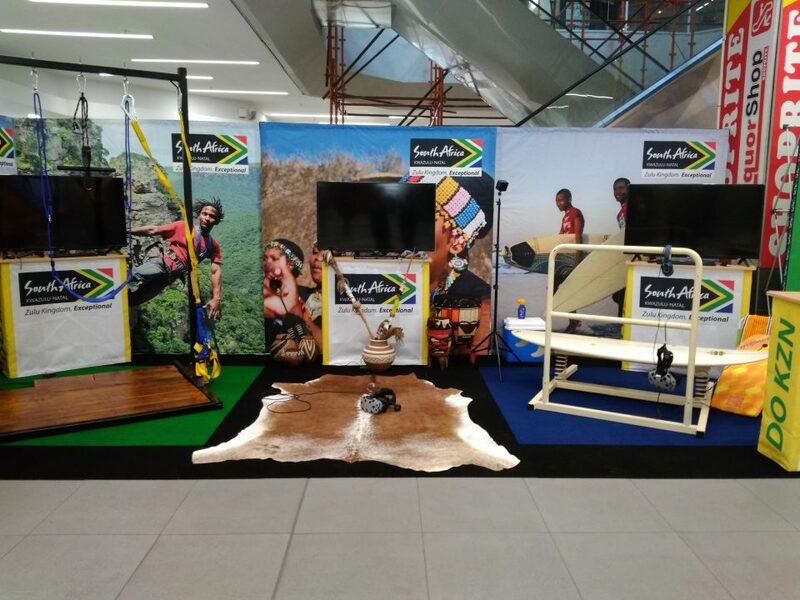 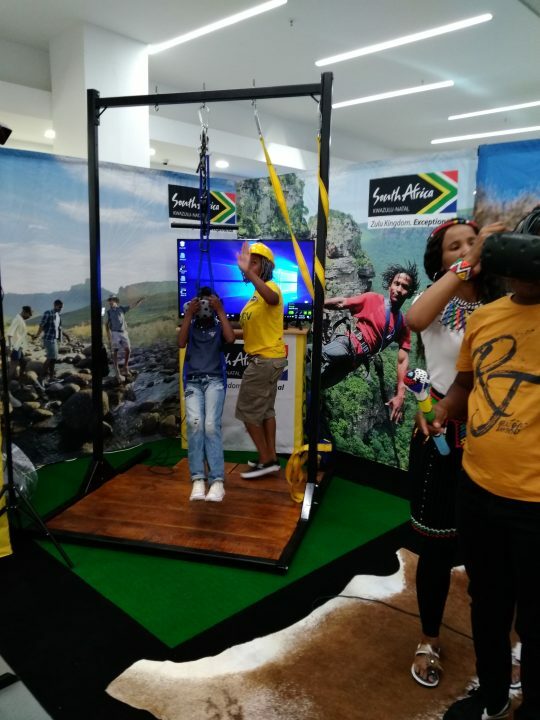 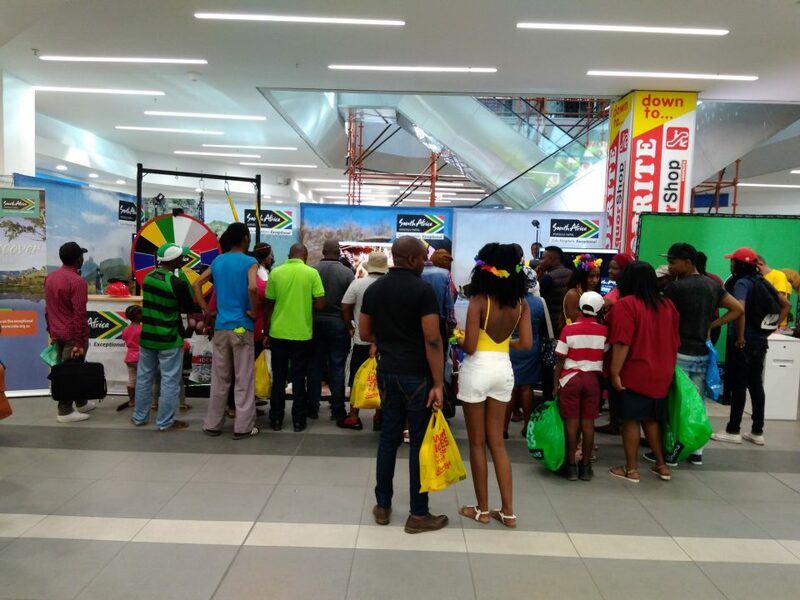 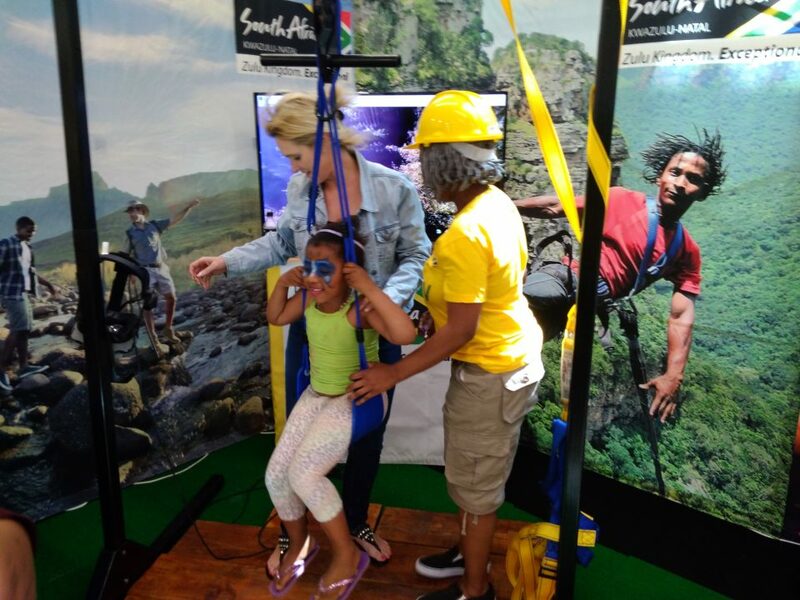 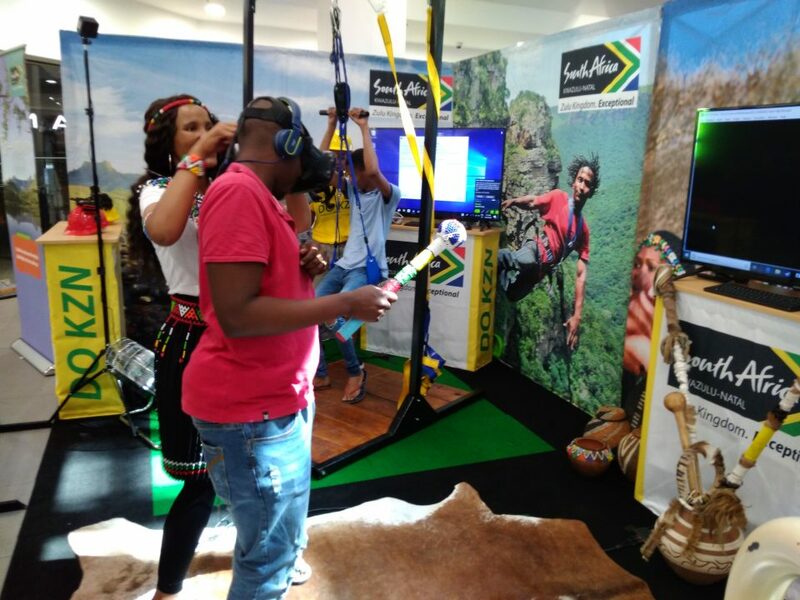 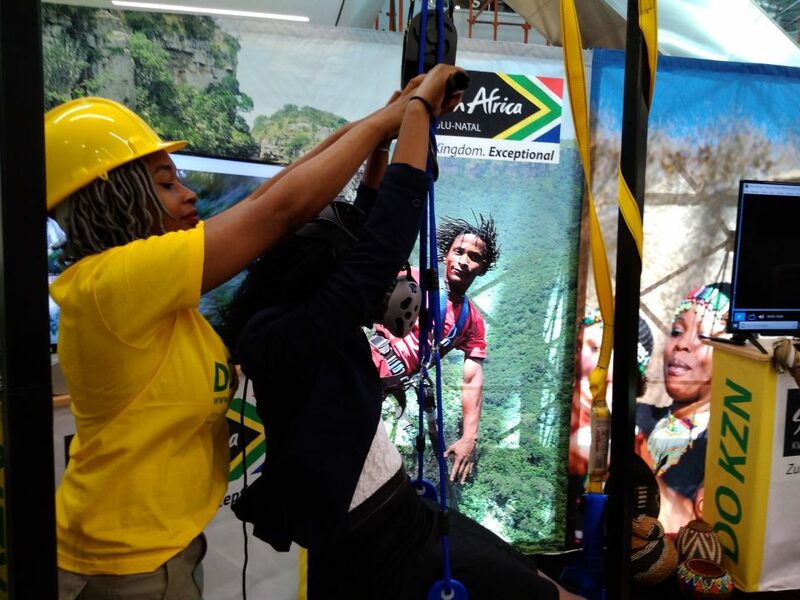 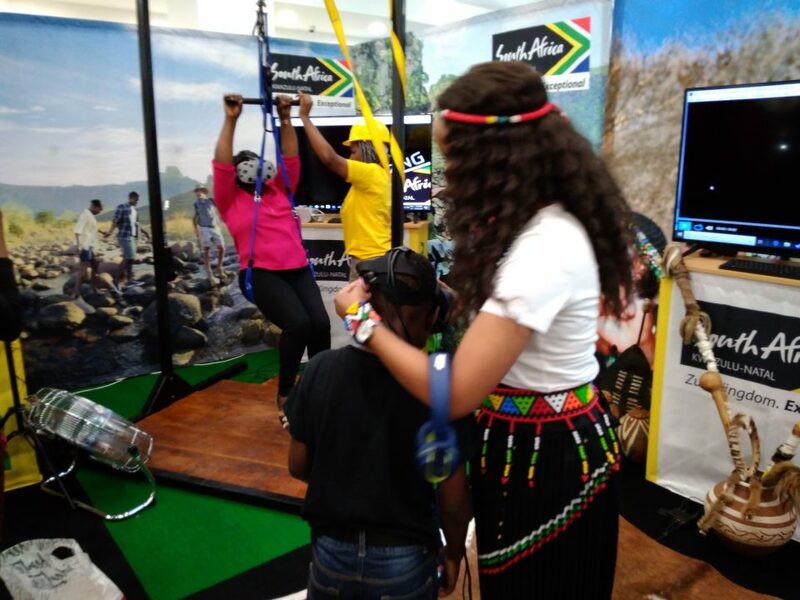 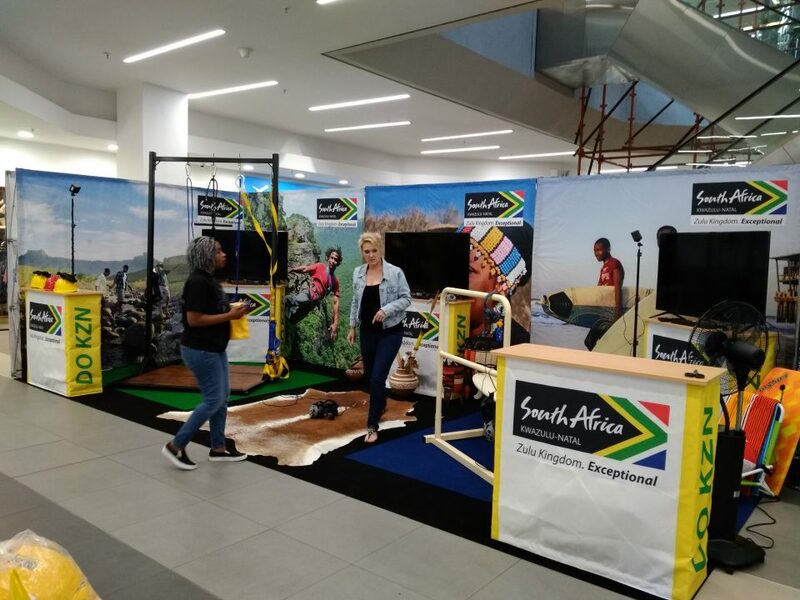 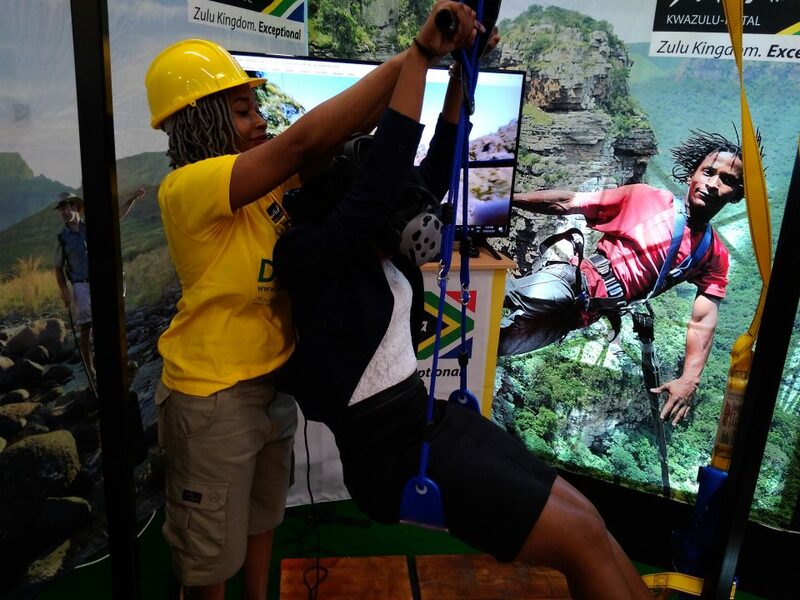 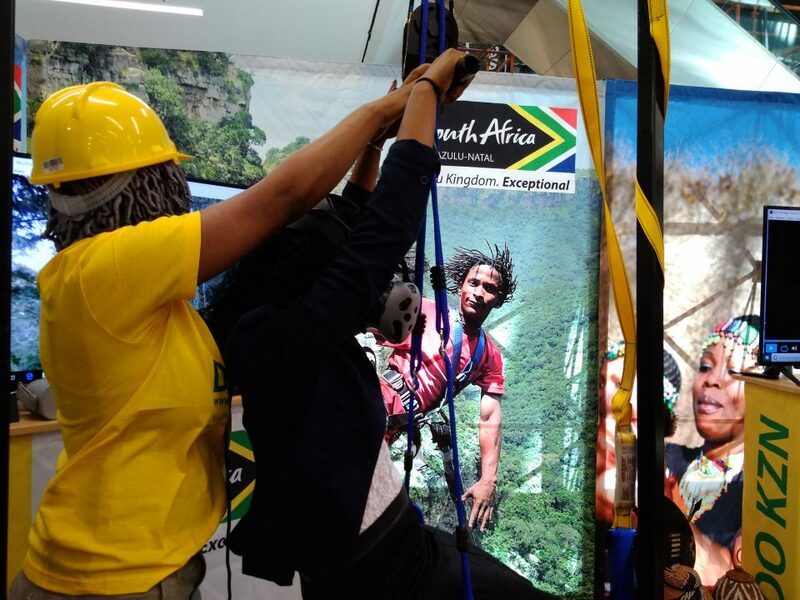 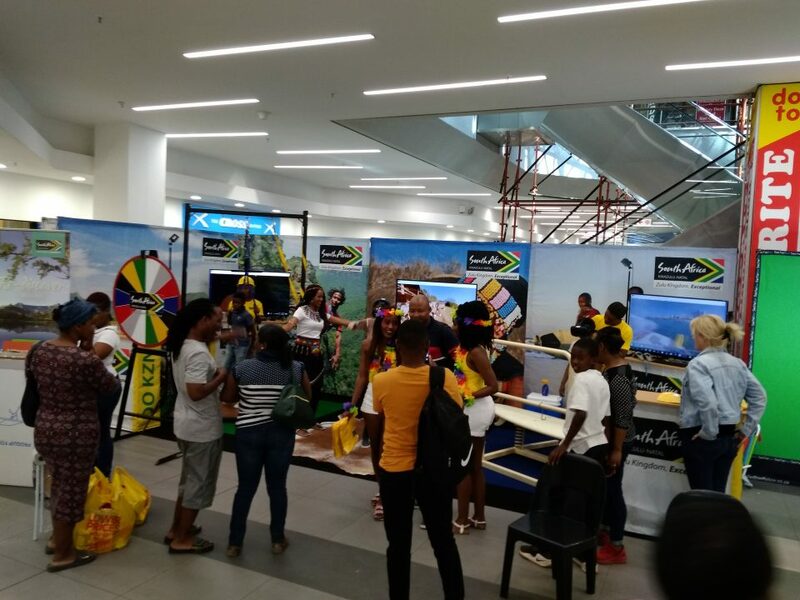 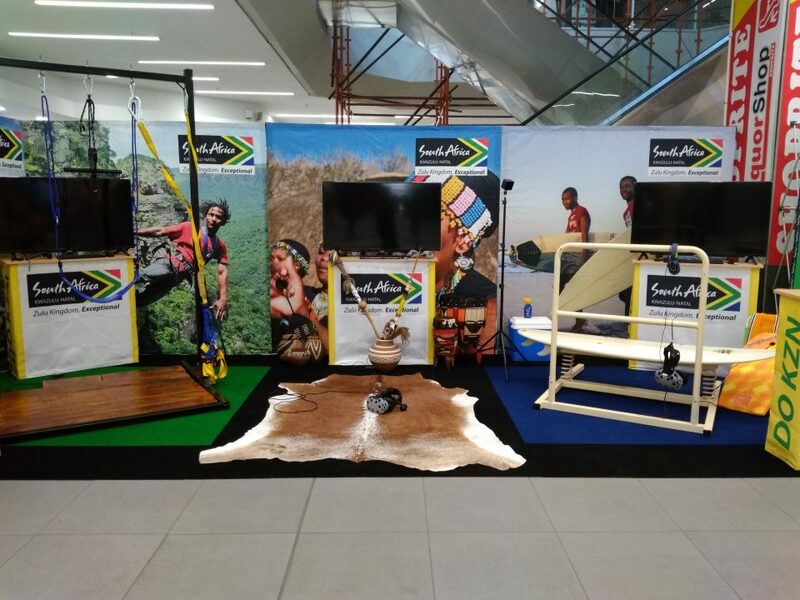 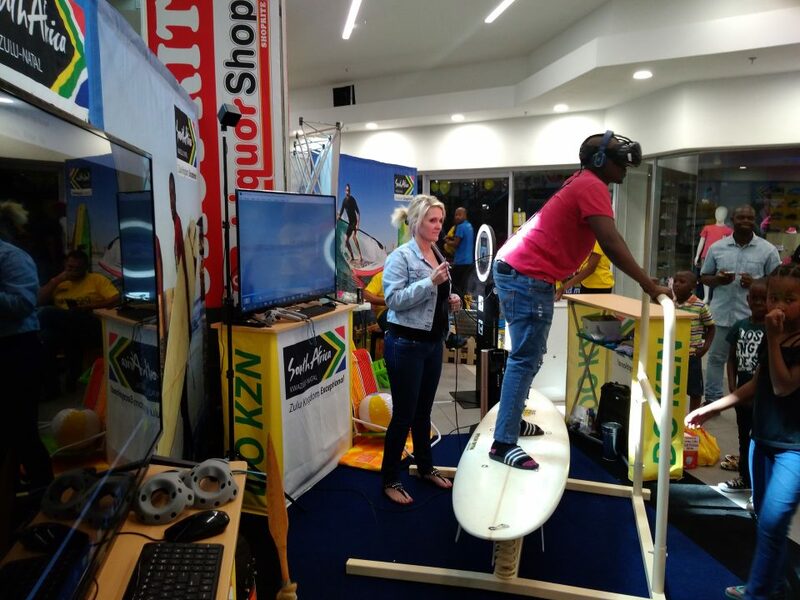 The activation was held in the Bloemfontein City mall and attracted thousands of people who queued to experience the Zip Line, the Zulu Dancing and the Surfboard experience. 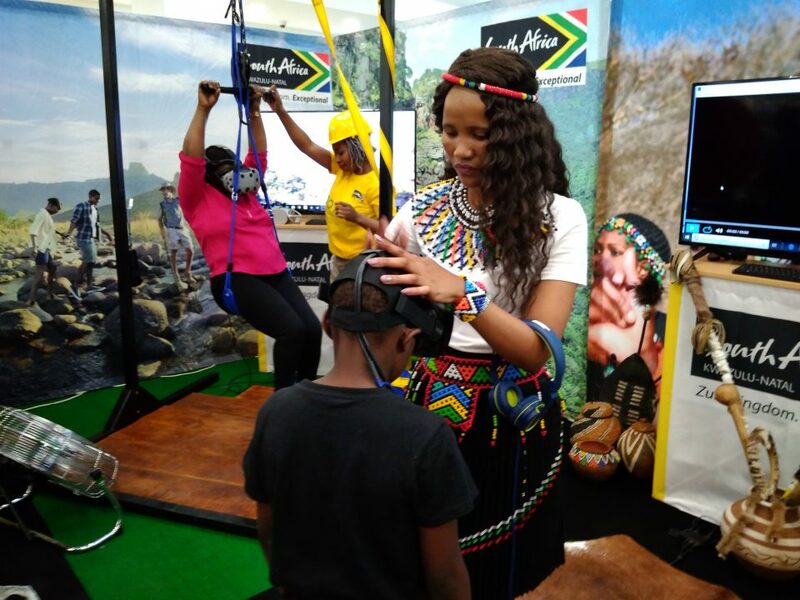 This allowed the marketing people the opportunity to tell people more about KwaZulu Natal and why they should consider it for their next holiday experience. 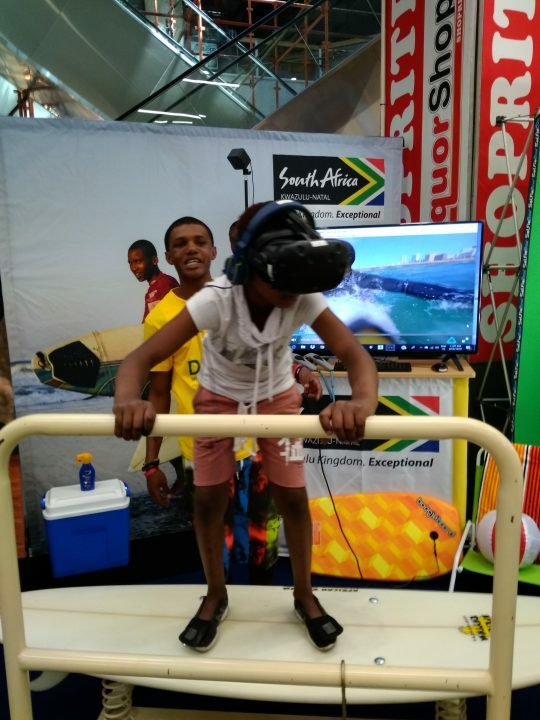 People loved the experience and we had very positive feedback from everyone whom participated in the virtual reality experiences. 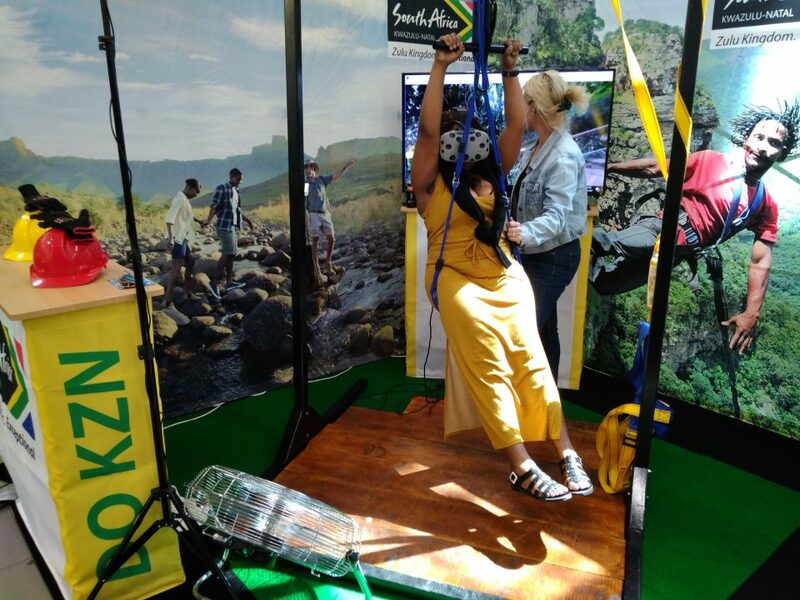 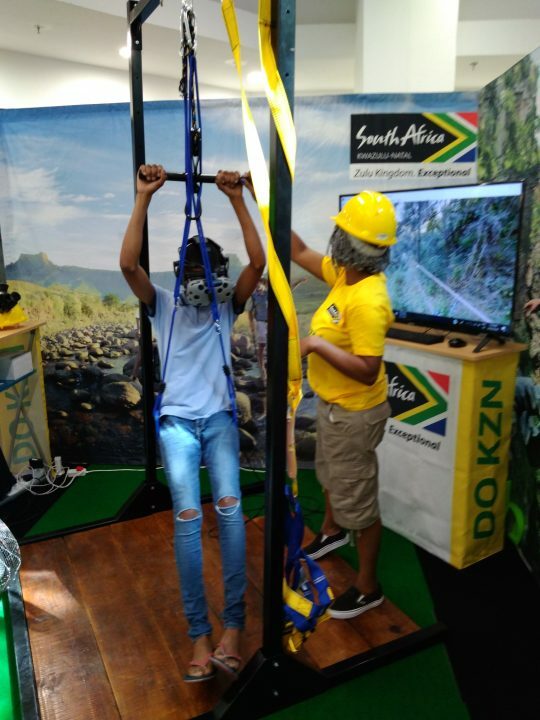 We designed a prop for the Zip-line experience, allowing potential tourists to be suspended in the air and feel what it is like to zip-line in the Drakensberg. 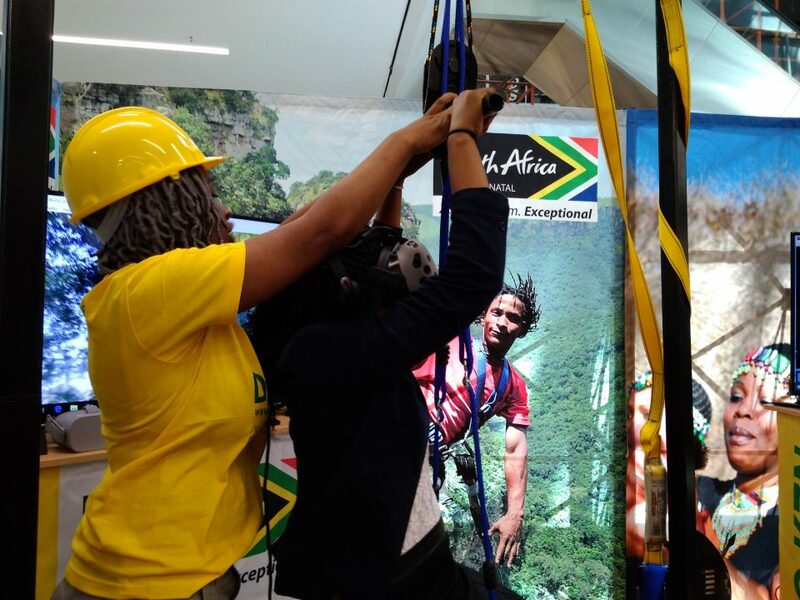 People had to get into a zip-line harness and then got suspended in the air. 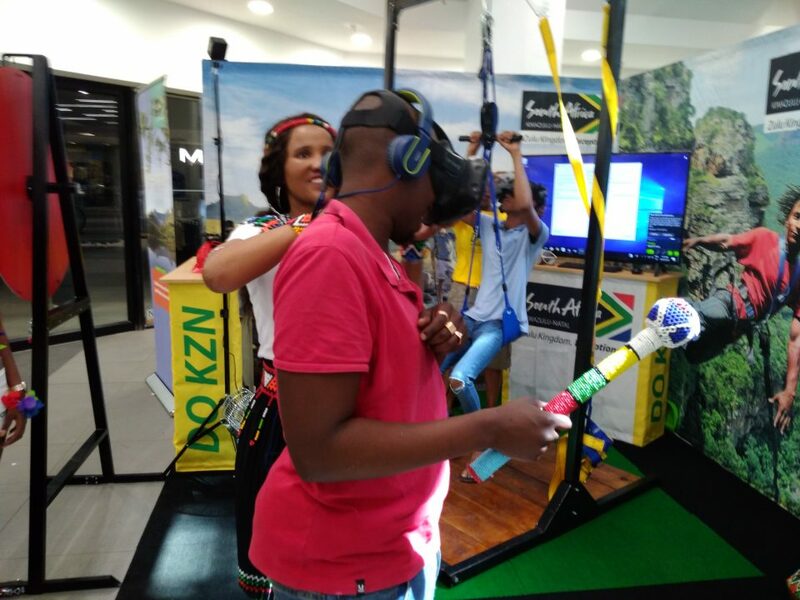 We also had a fan turning on and off to give people a 4D virtual reality experience where they felt the air blowing on them as they zip line. 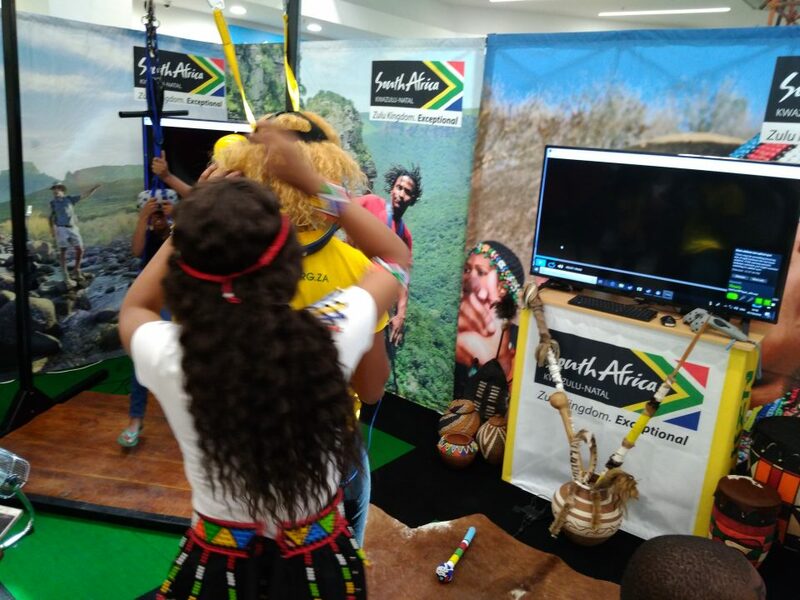 The Zulu dancing experience teleport people into the Drakensberg where they experienced a traditional Zulu dance and could participate in the dance themselves. 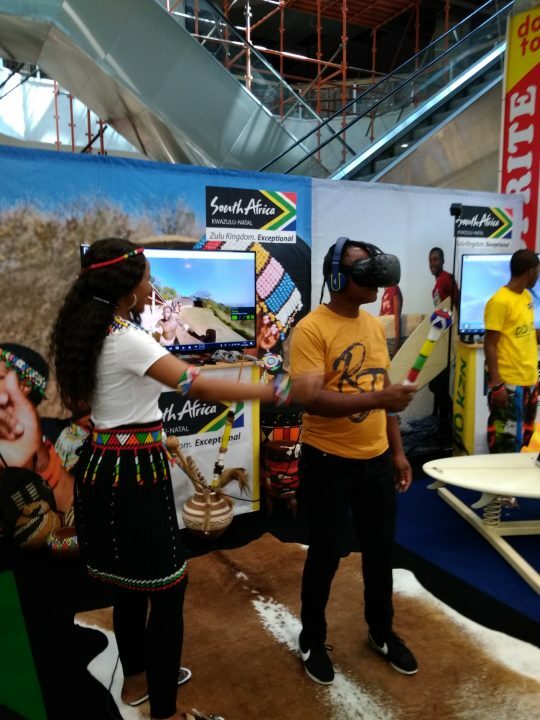 For this we purchased Zulu props, Zulu Traditional clothing a Nguni Rug, Zulu Shield, Zulu Spear and Zulu pots to make the experience more authentic. 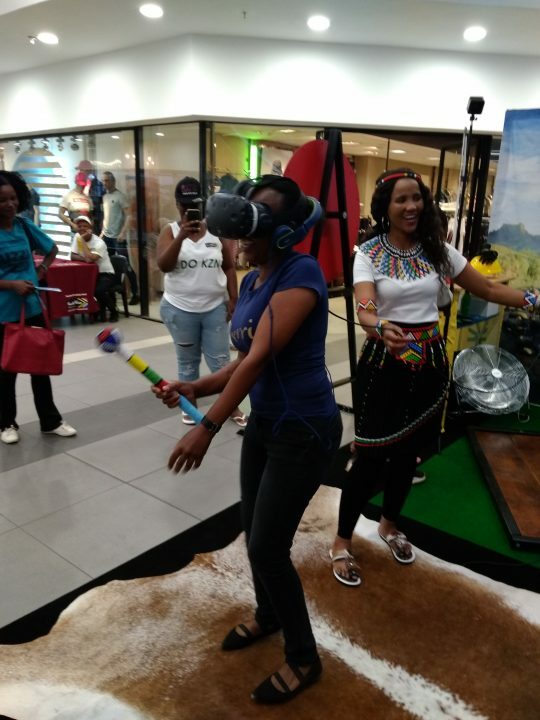 The Zulu Dancing virtual reality experience was awesome, and people really got into the dance and from the response people loved the traditional Zulu dancing virtual reality experience. 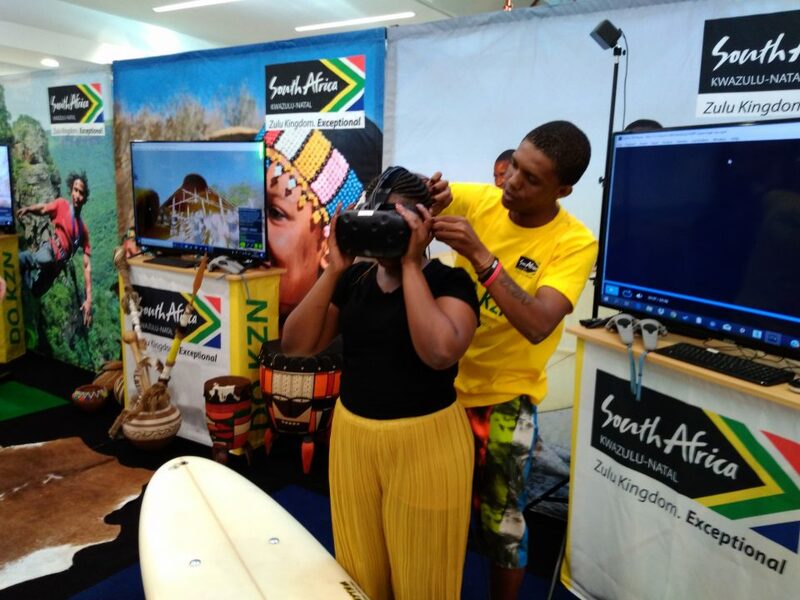 One of the top tourist destinations in KwaZulu-Natal is Durban. 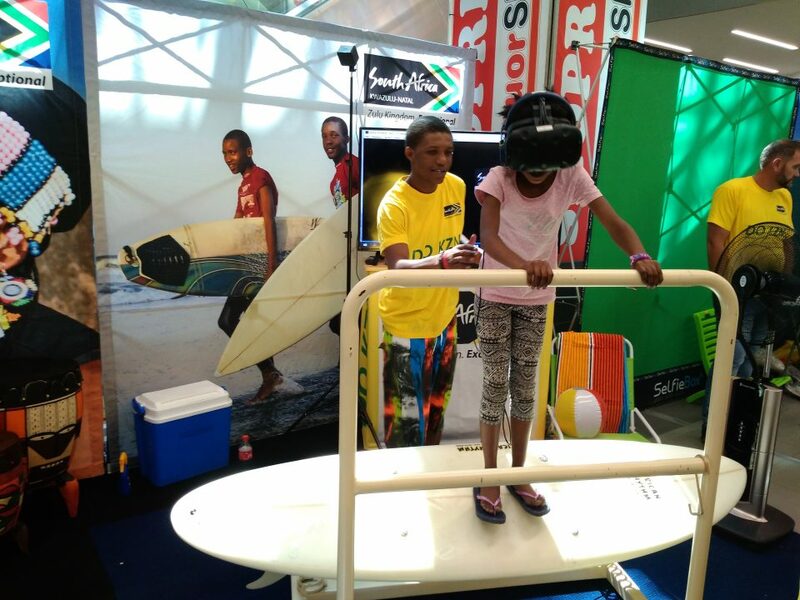 Durban is known for its world class beach fronts, swimming and surfing. 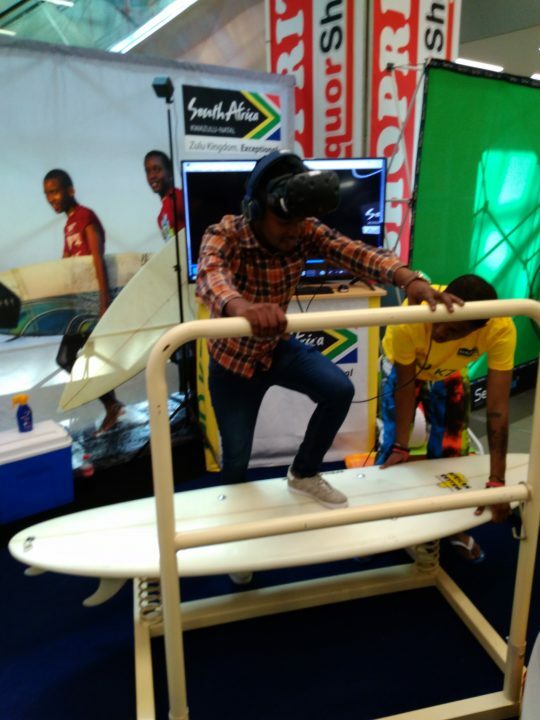 The Surfing experience allowed people to experience the thrill of surfing. 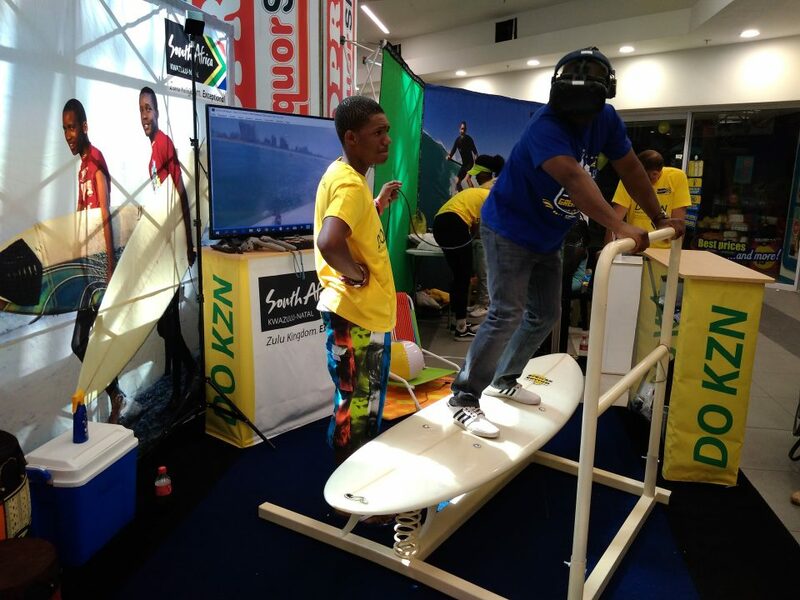 As part of the activation we created a surfboard prop on which people could stand and feel like they are surfing. 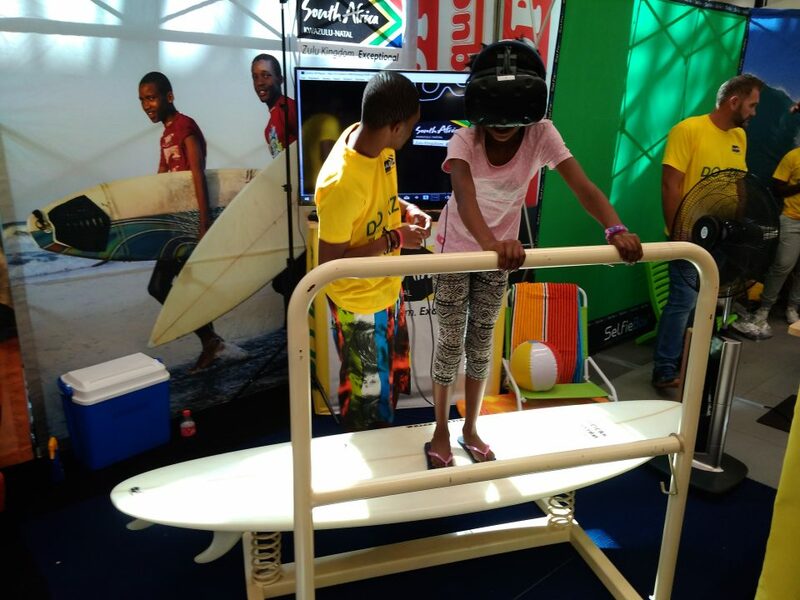 The surfboard was spring loaded allowing people to move left or right and even jump on the surfboard to get the real surfing experience. 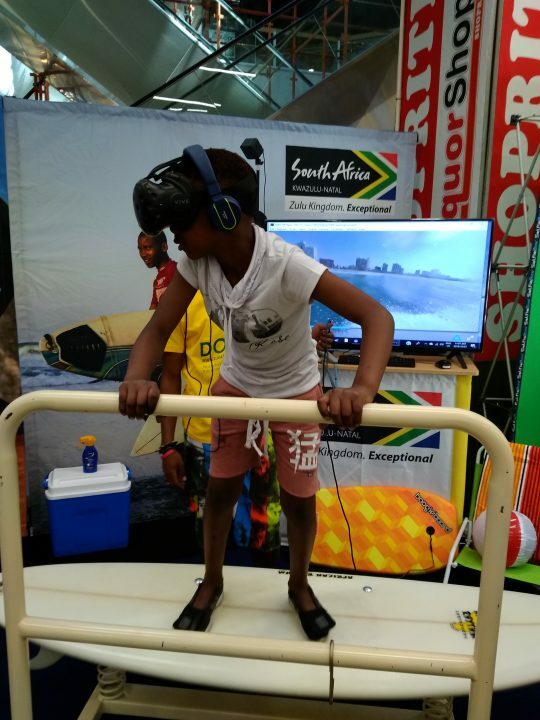 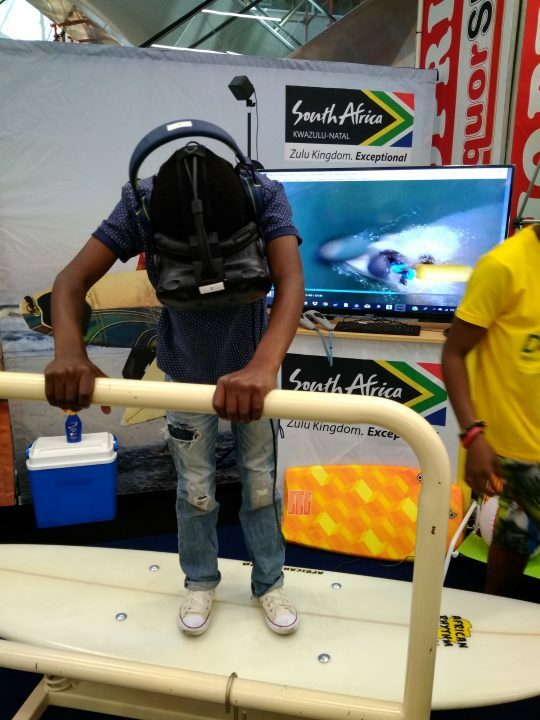 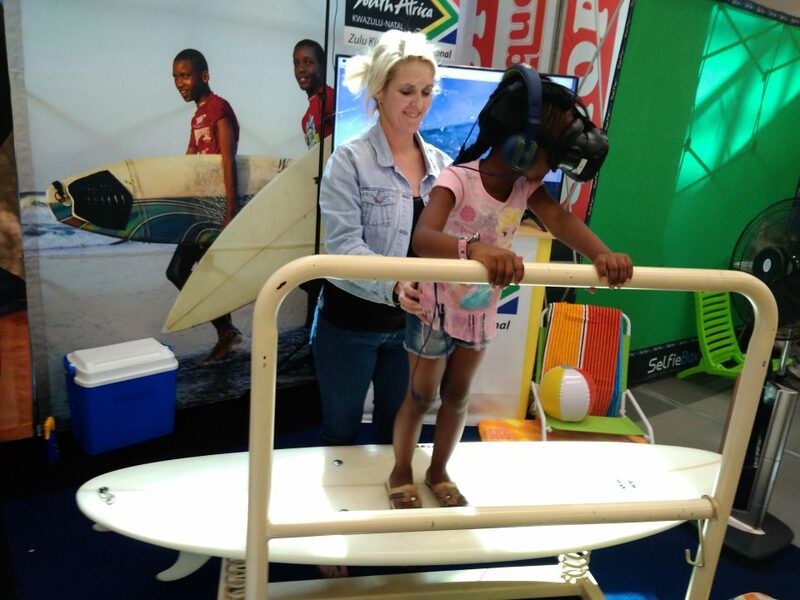 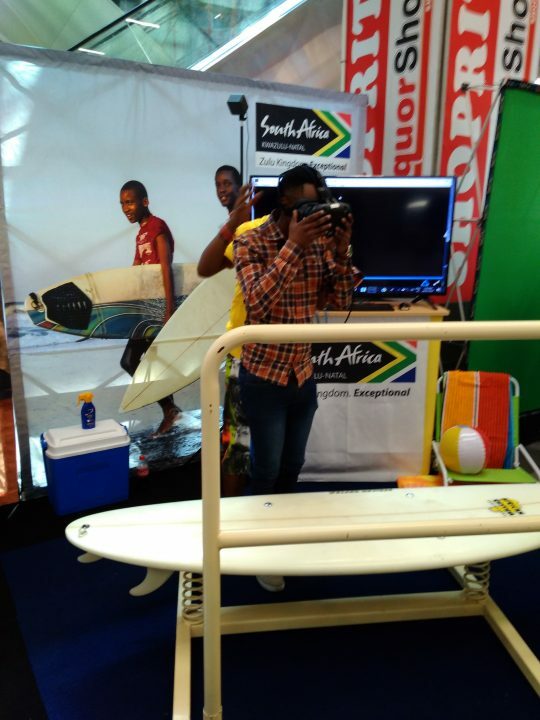 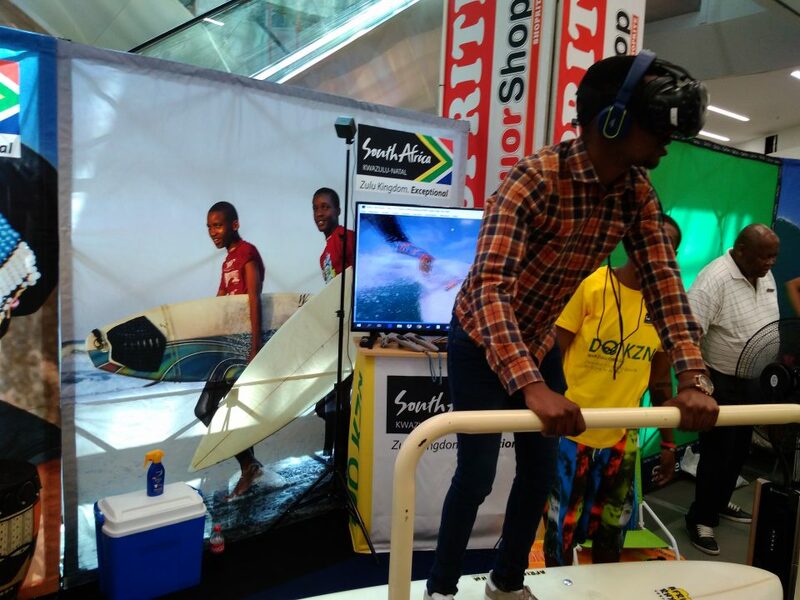 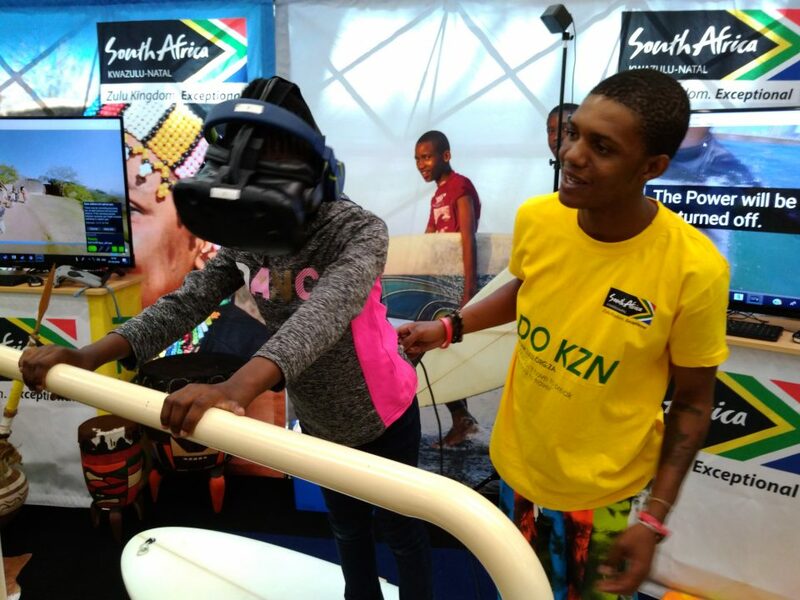 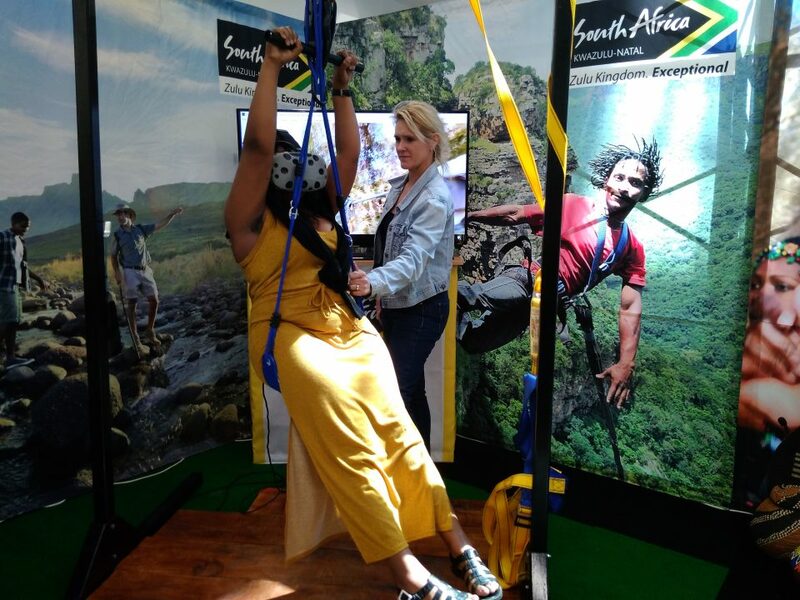 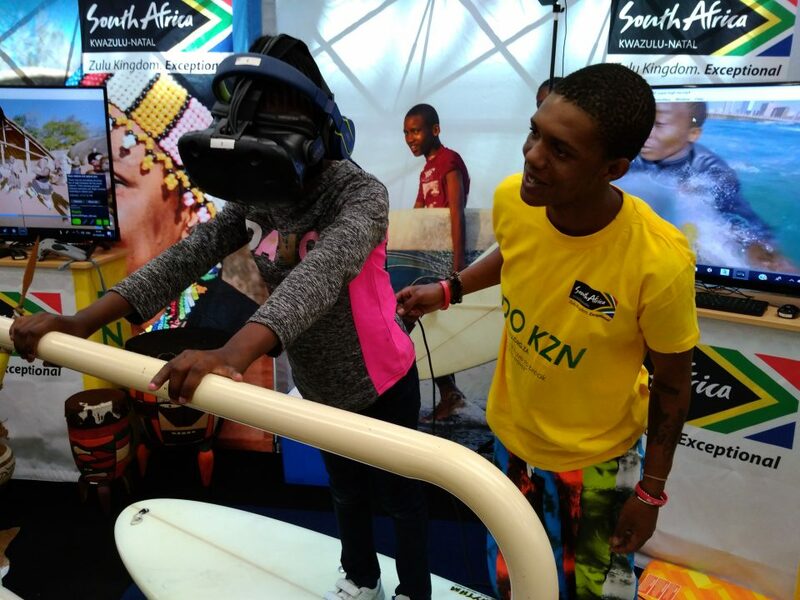 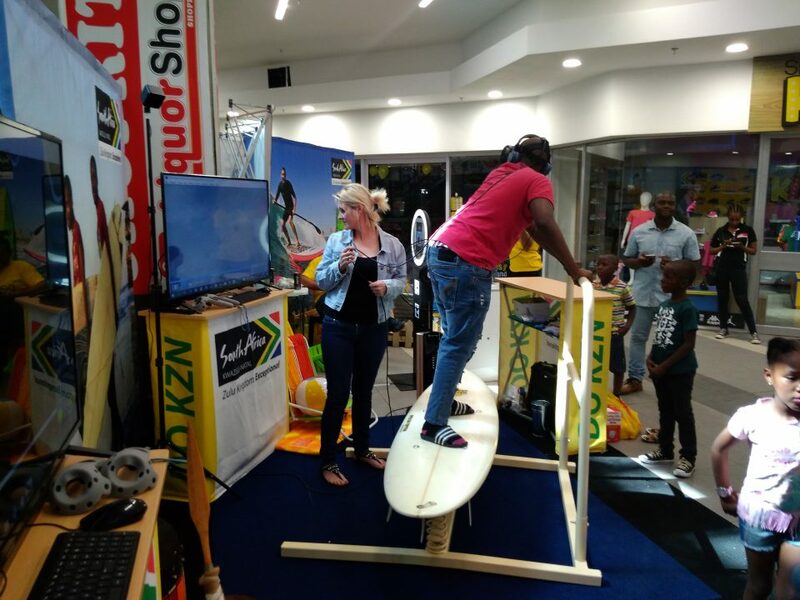 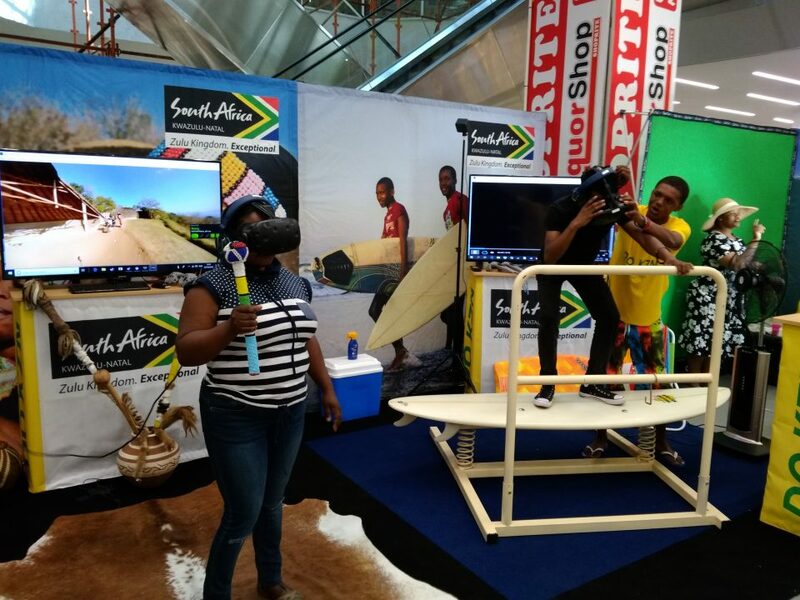 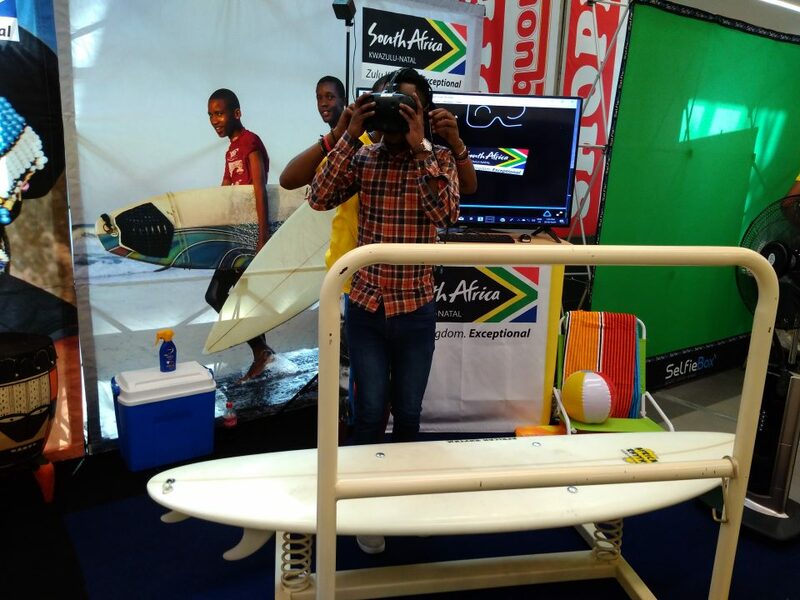 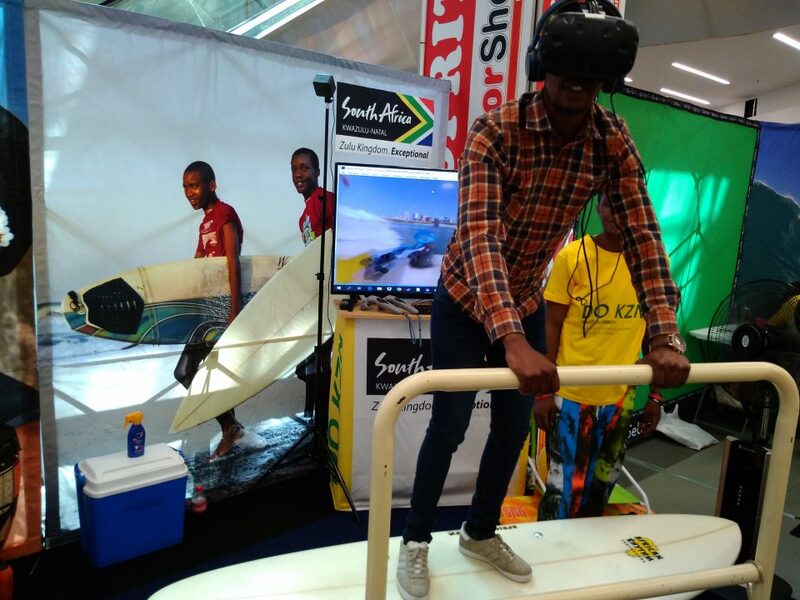 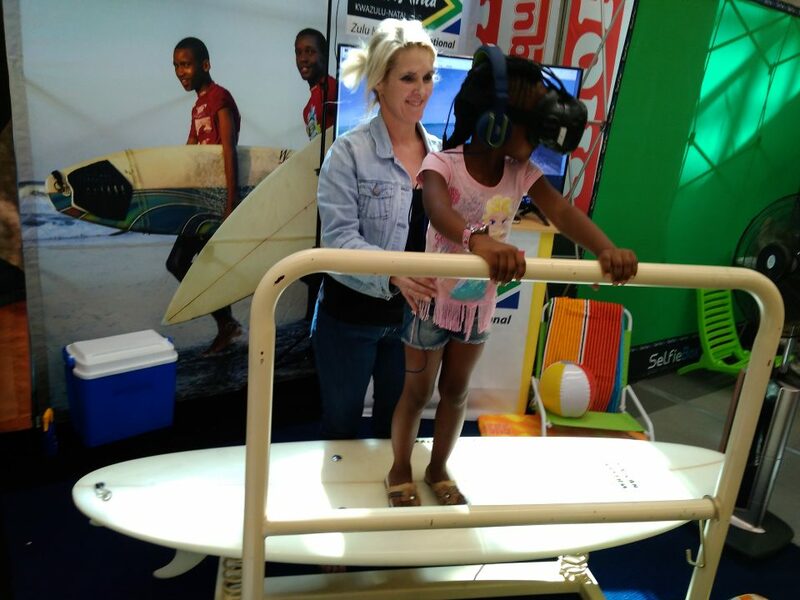 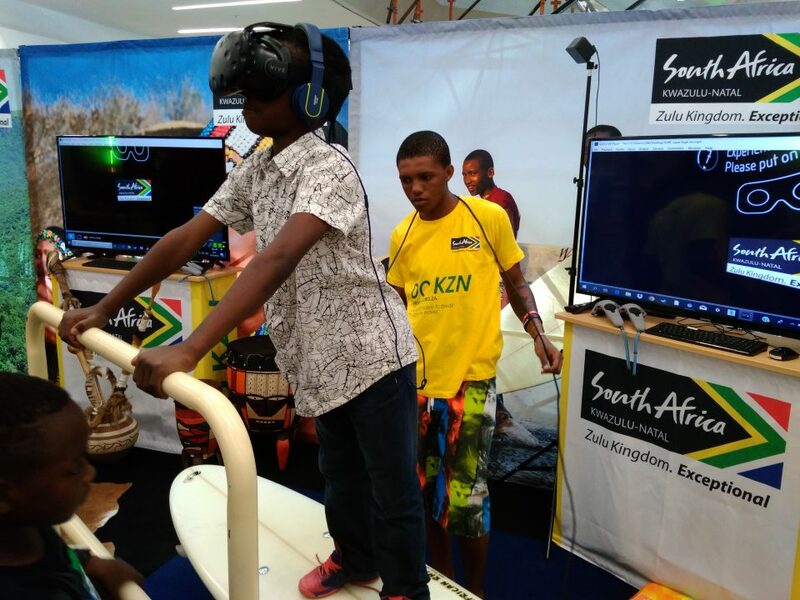 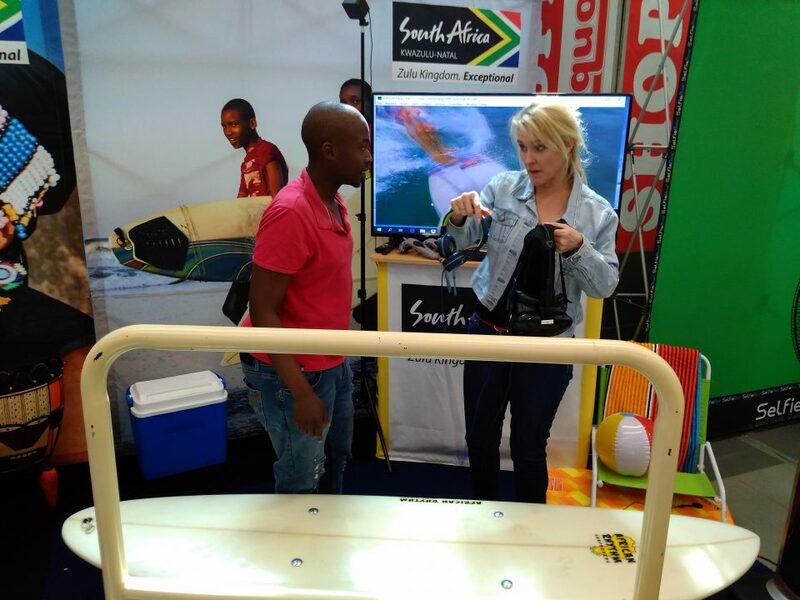 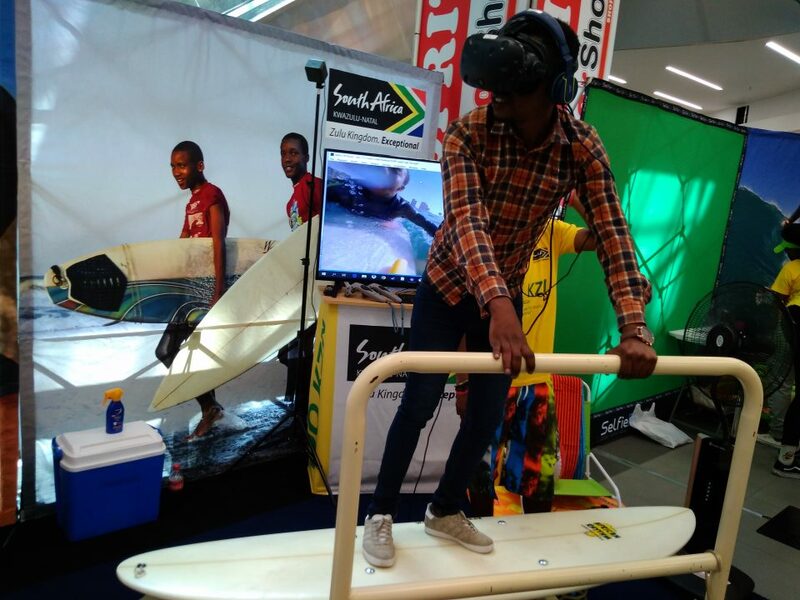 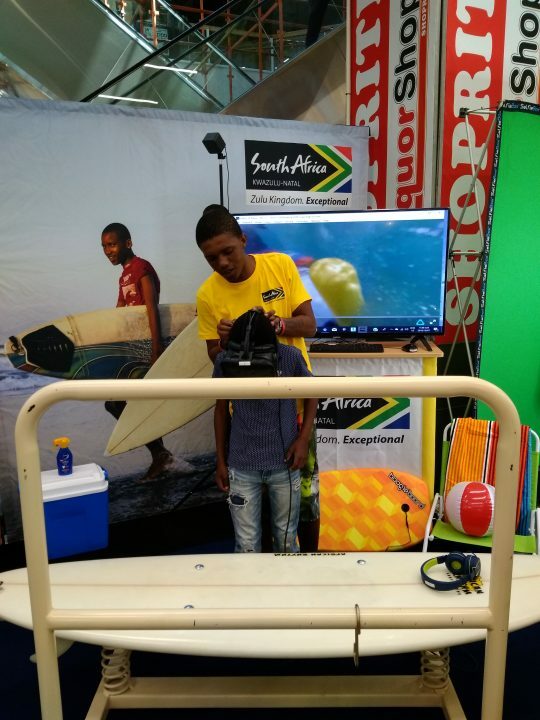 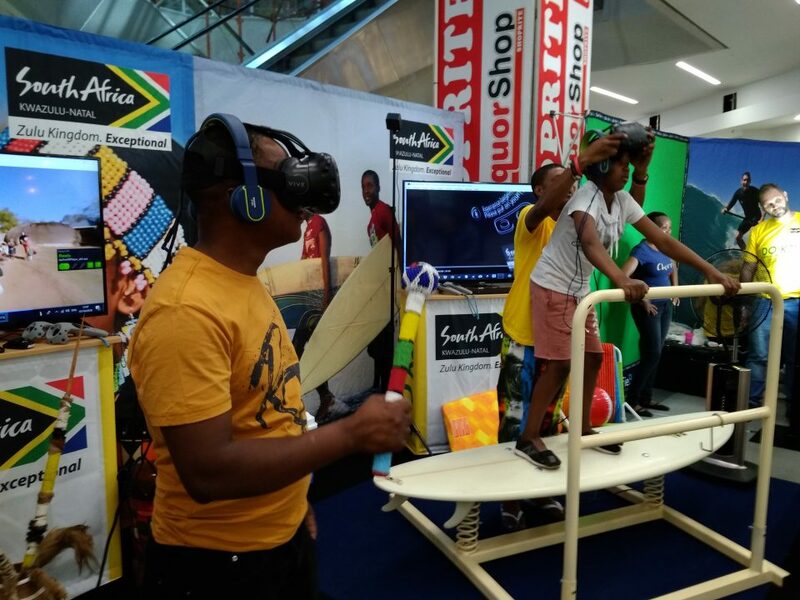 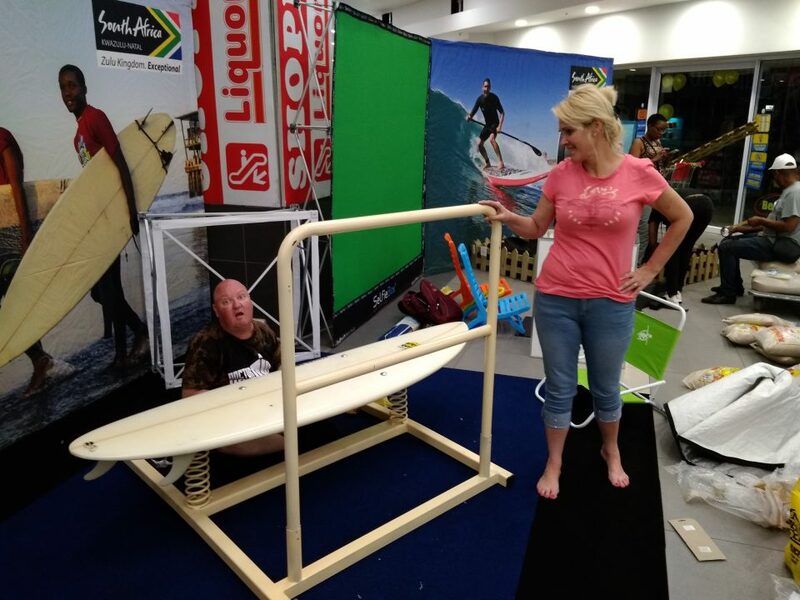 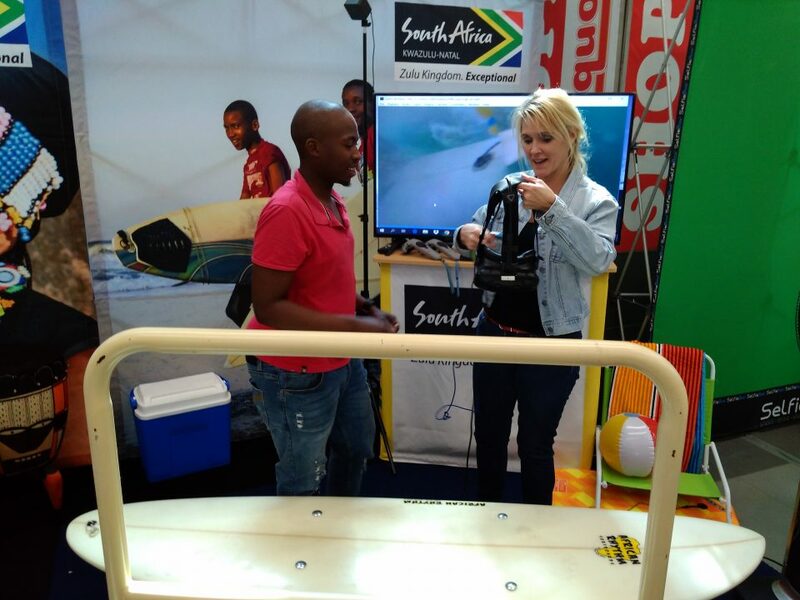 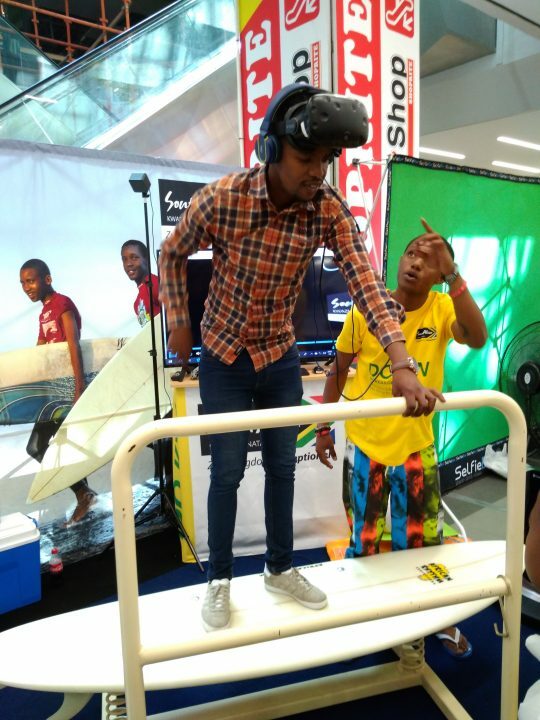 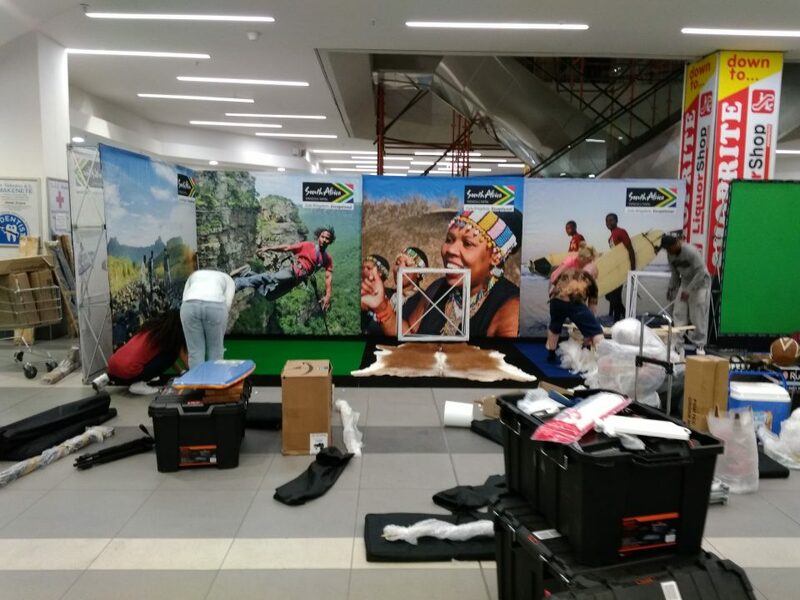 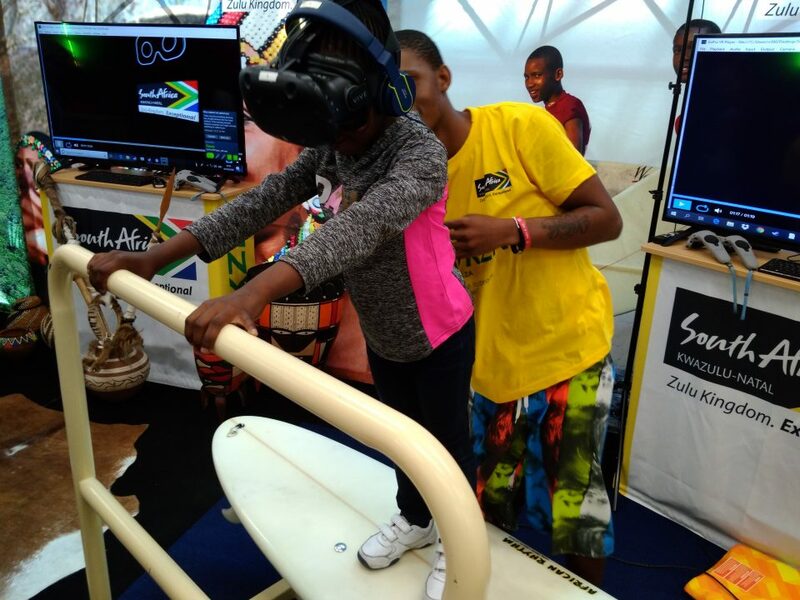 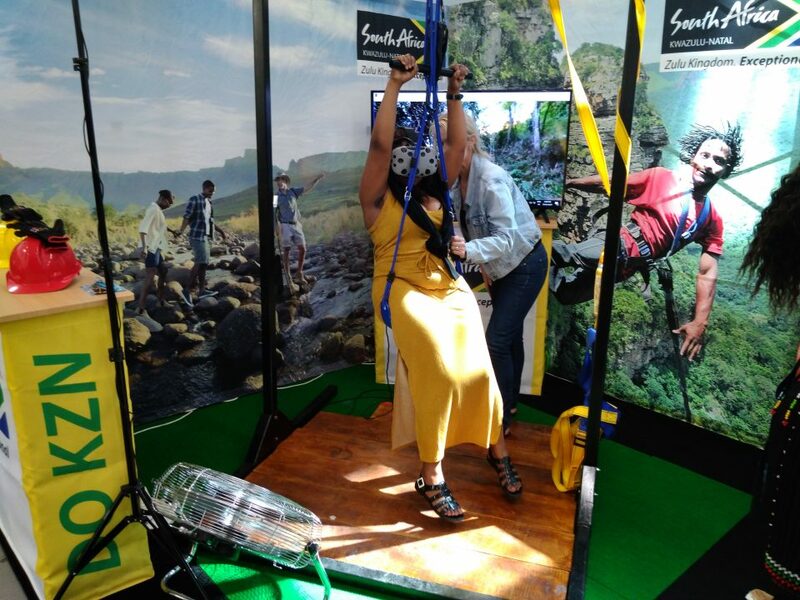 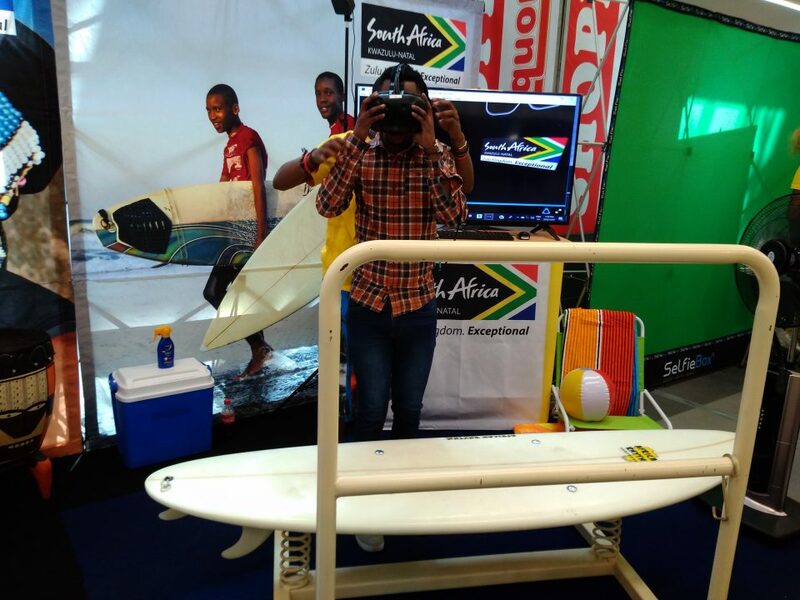 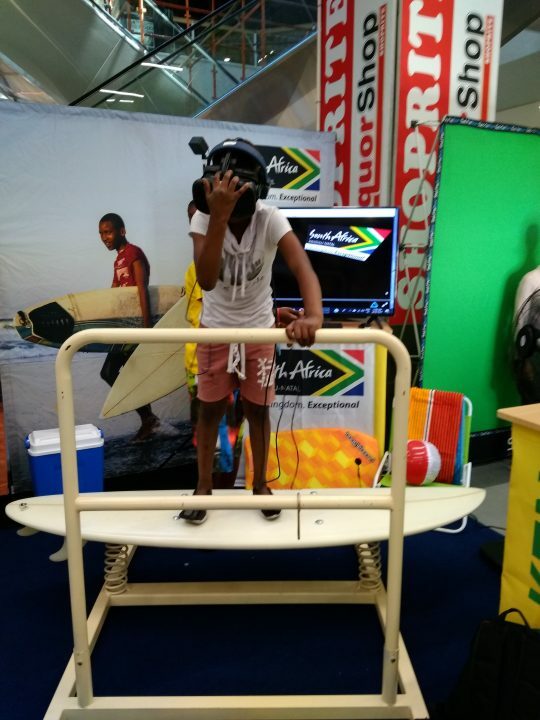 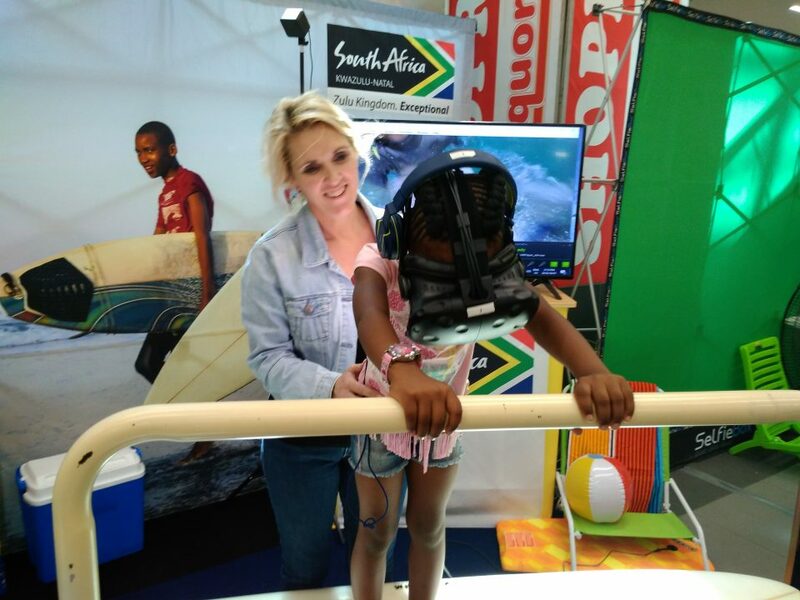 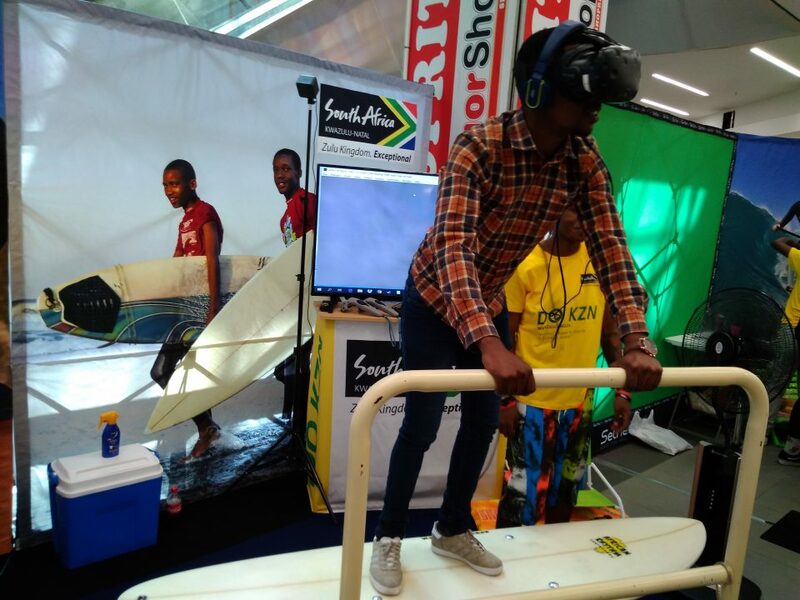 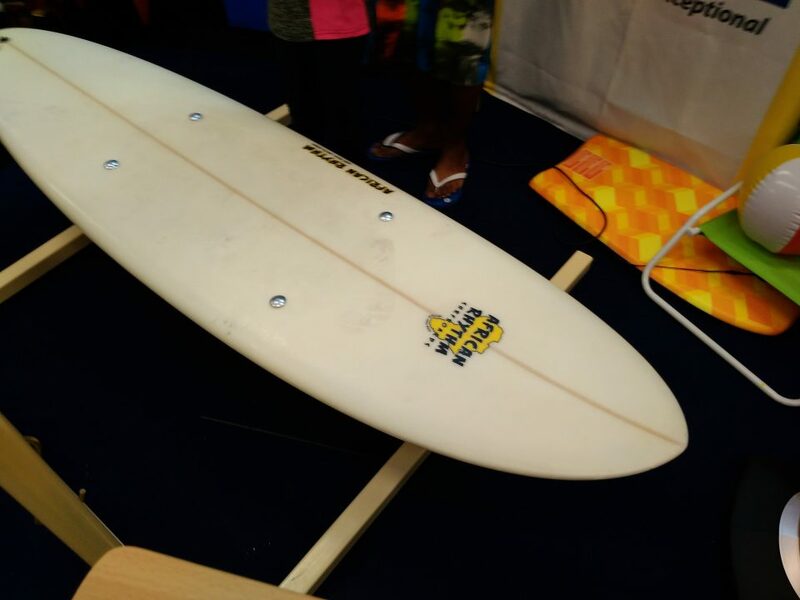 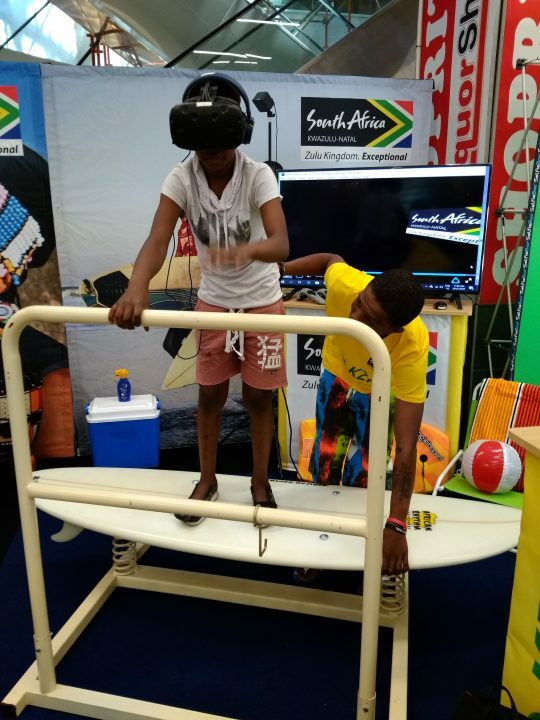 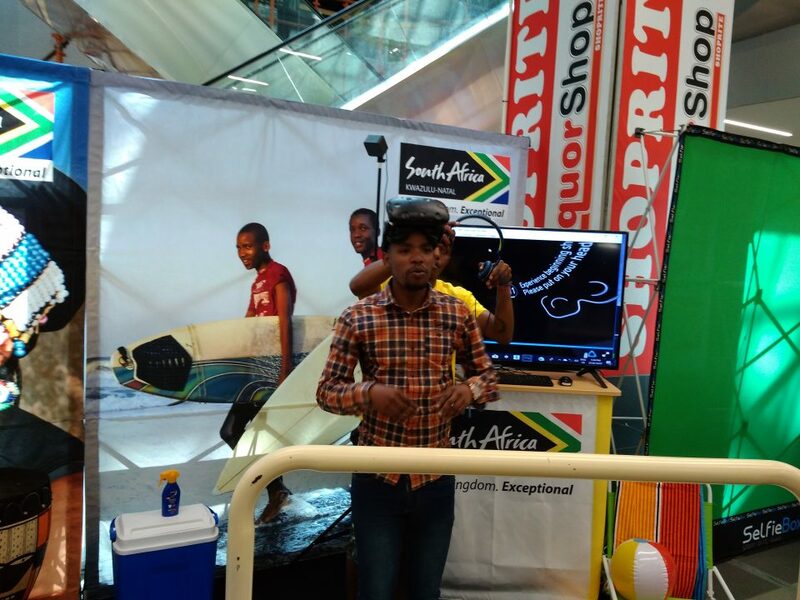 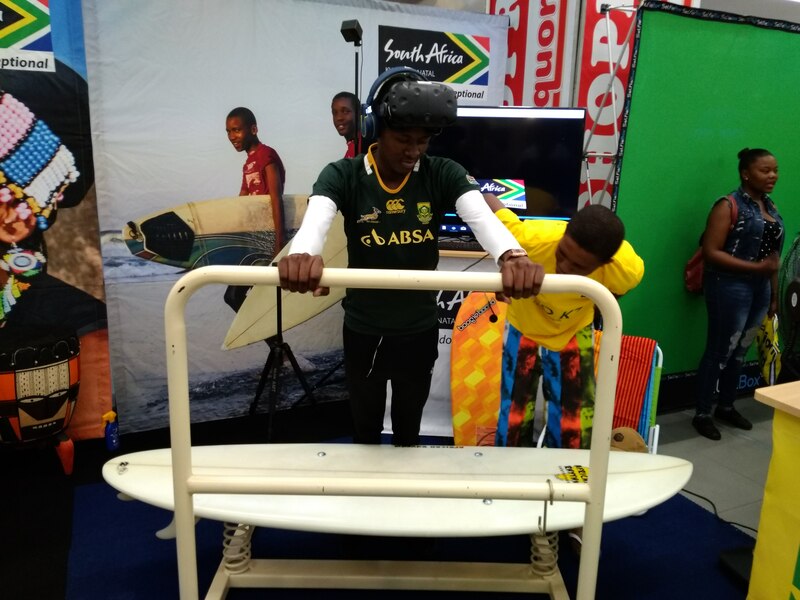 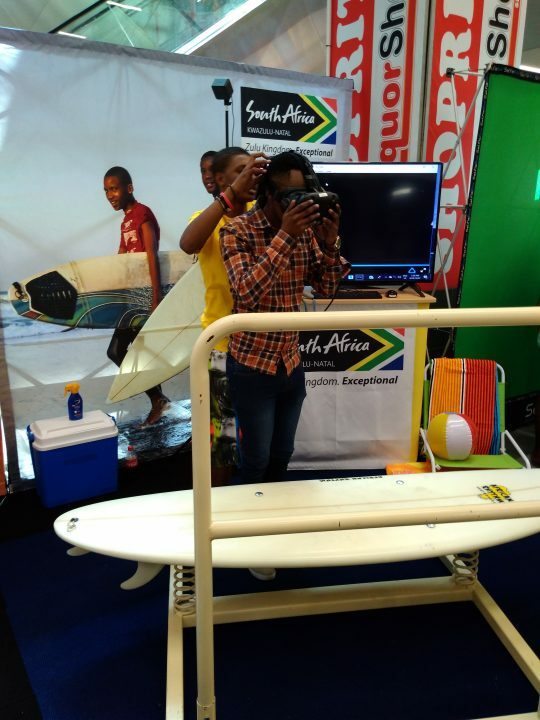 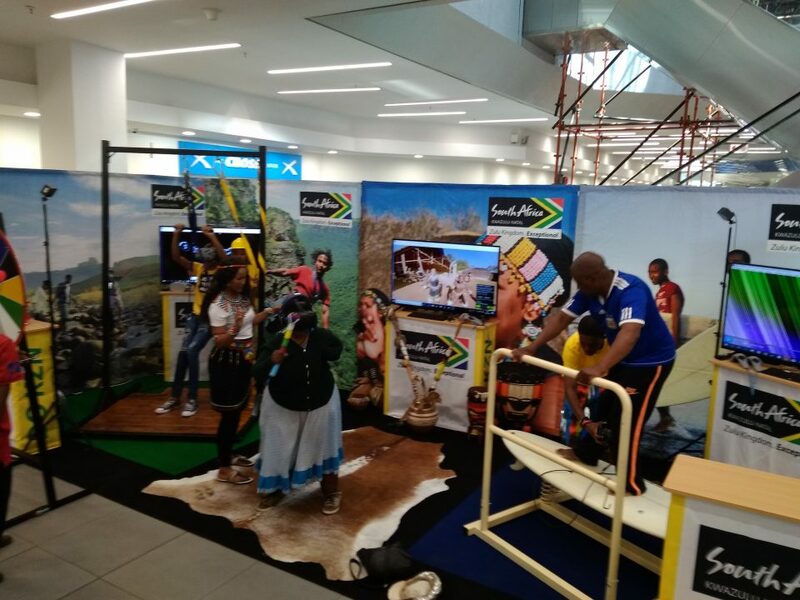 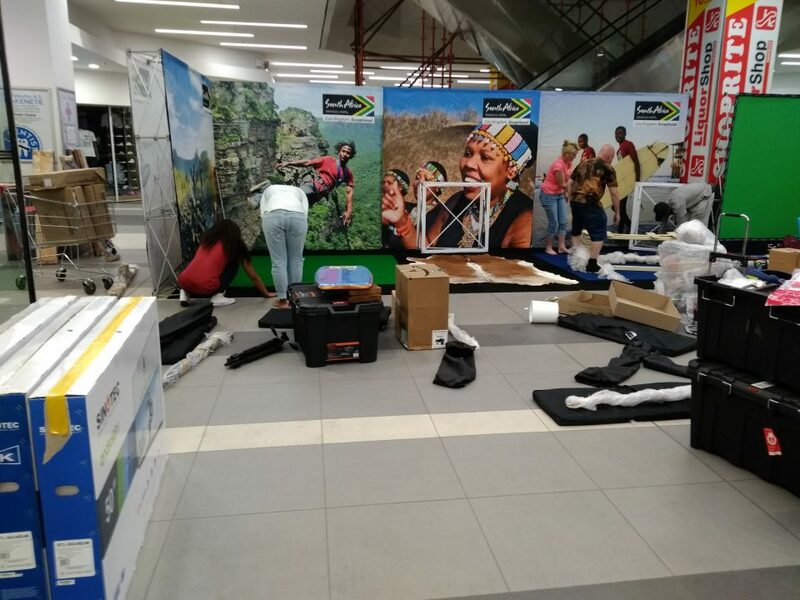 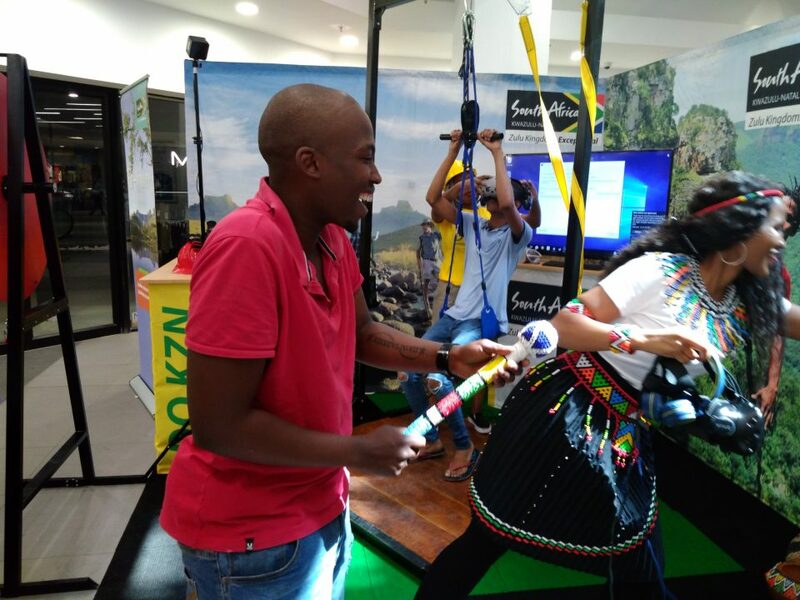 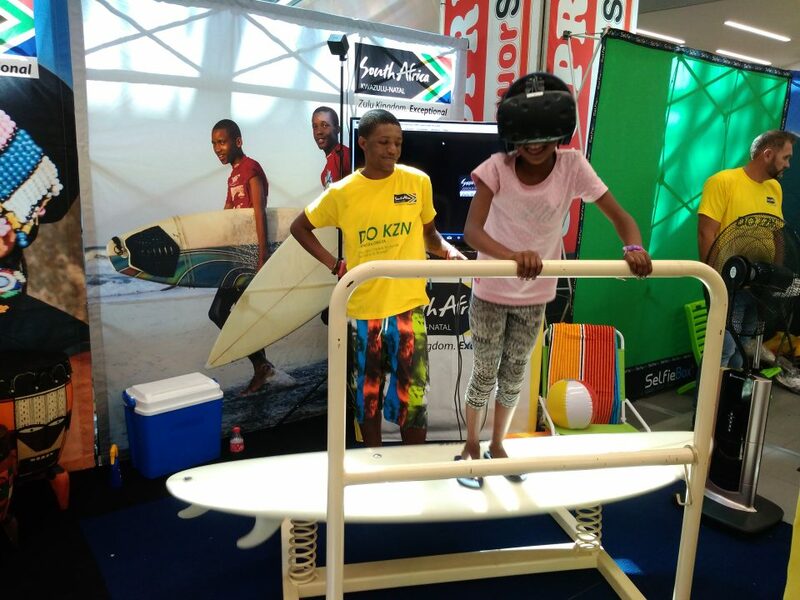 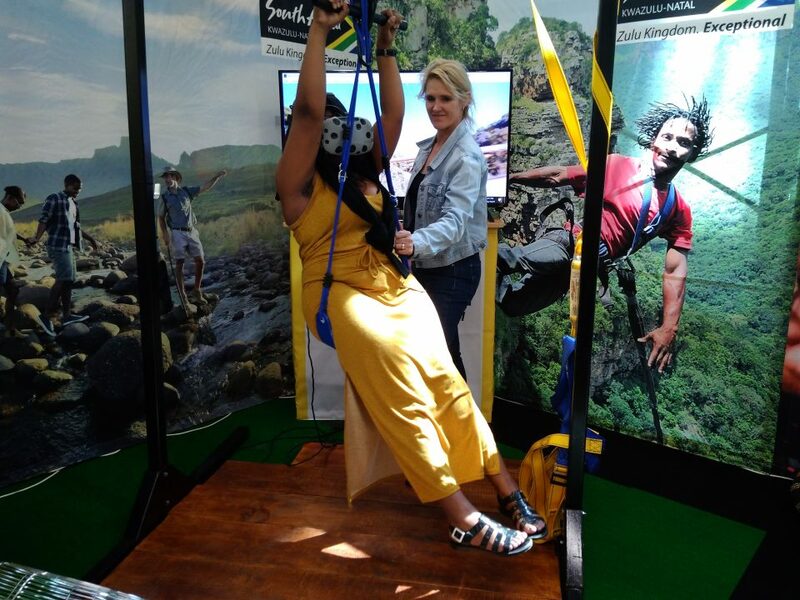 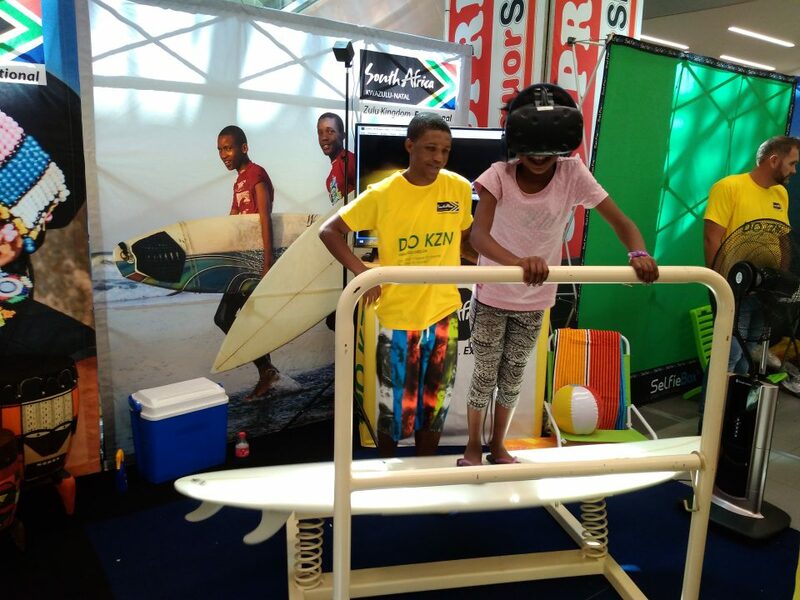 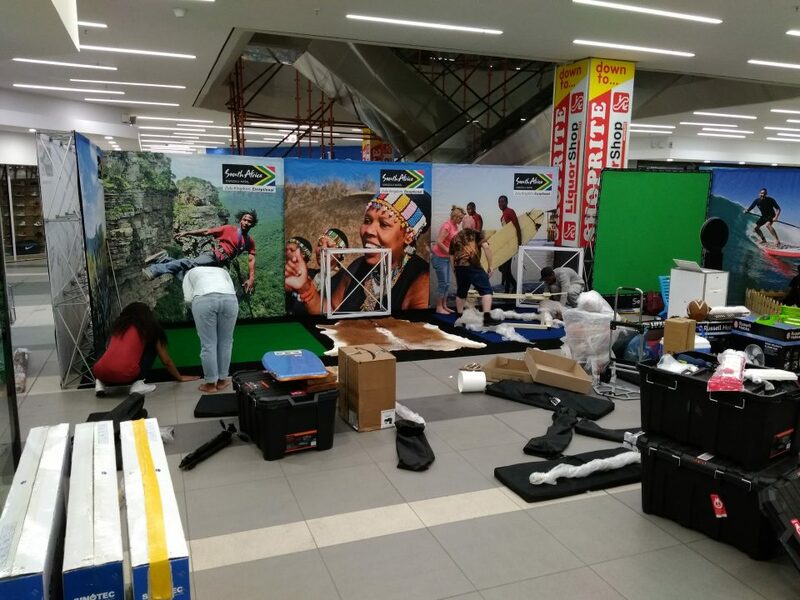 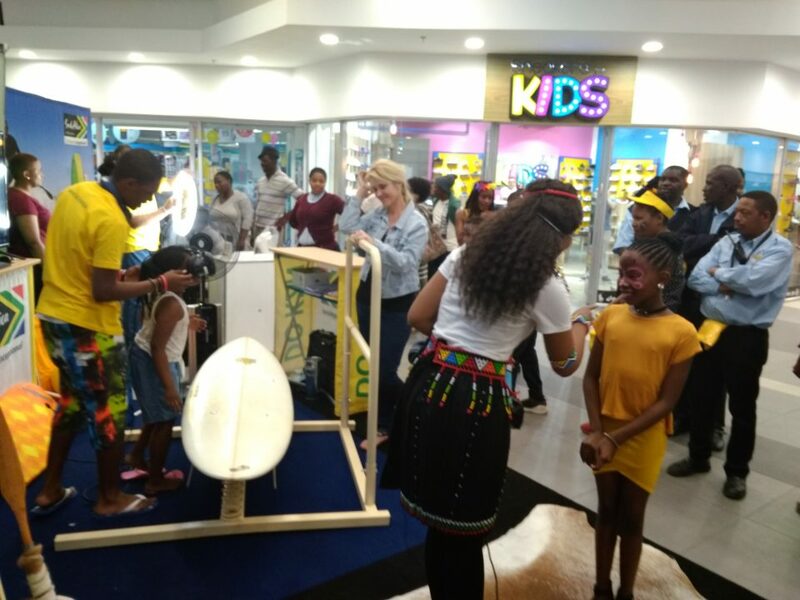 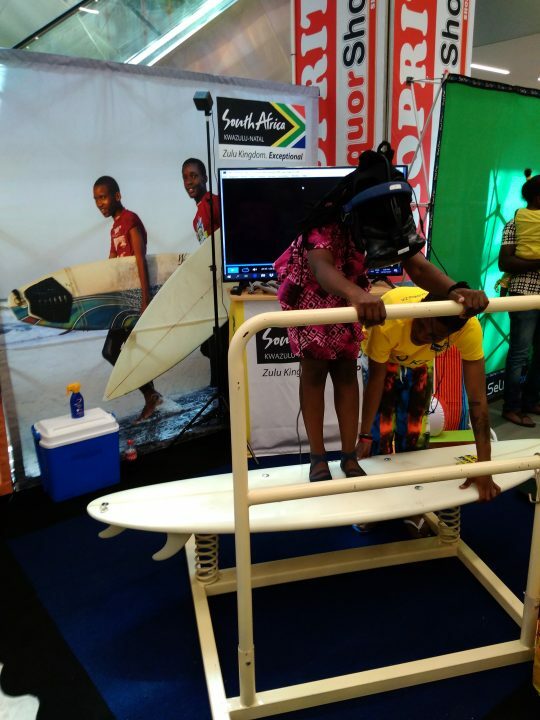 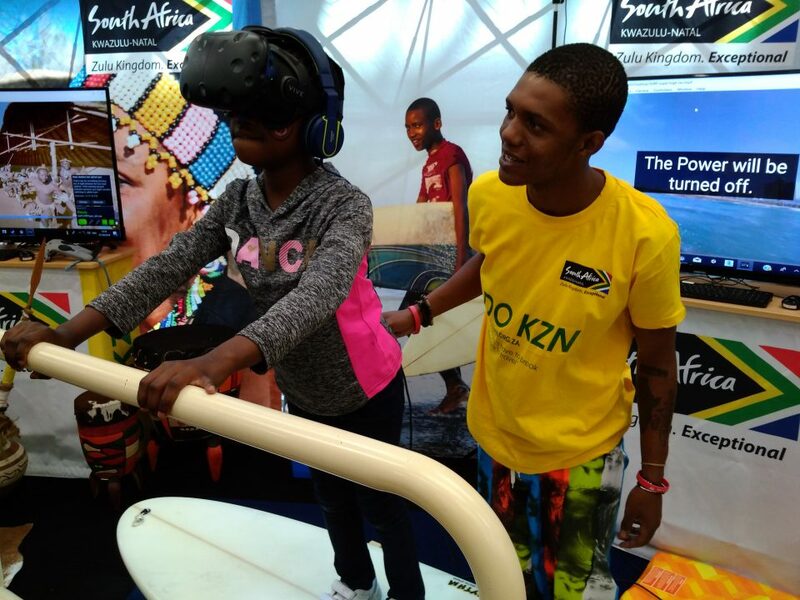 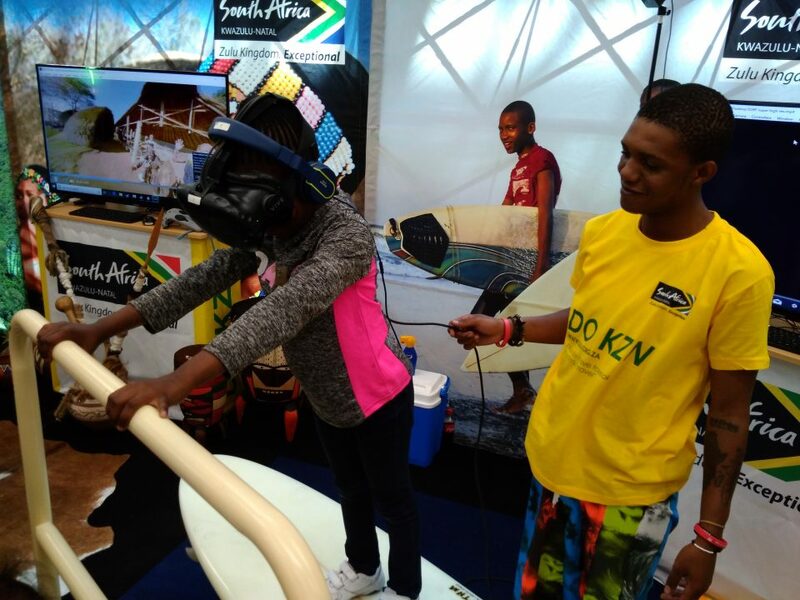 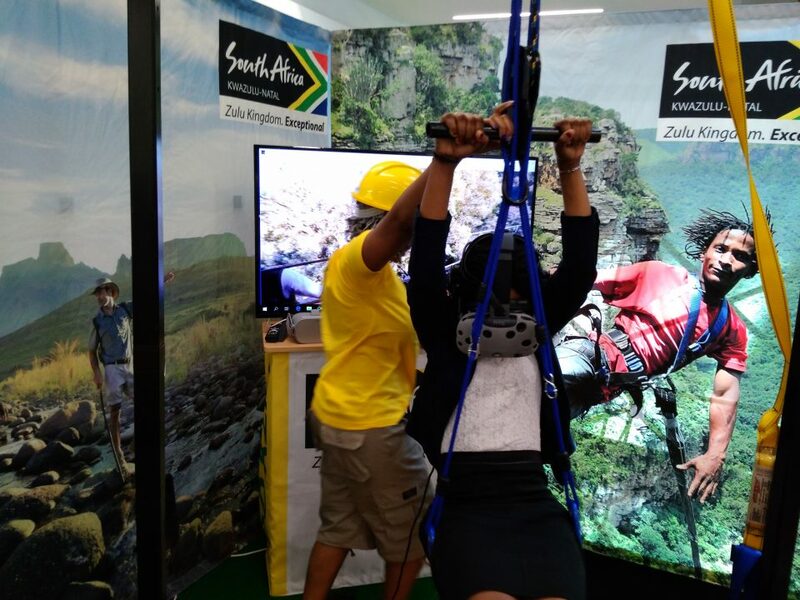 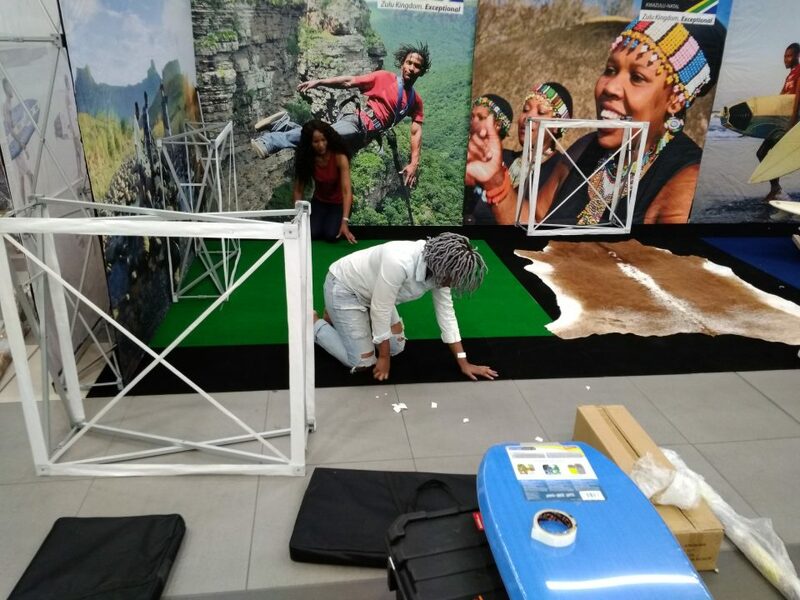 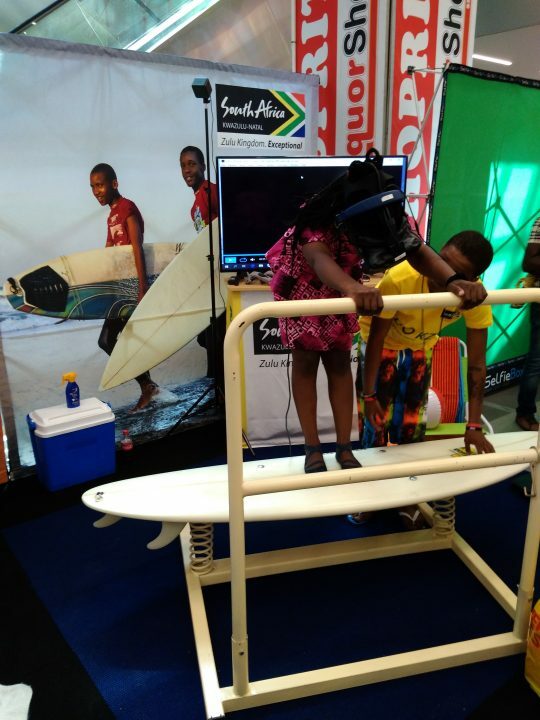 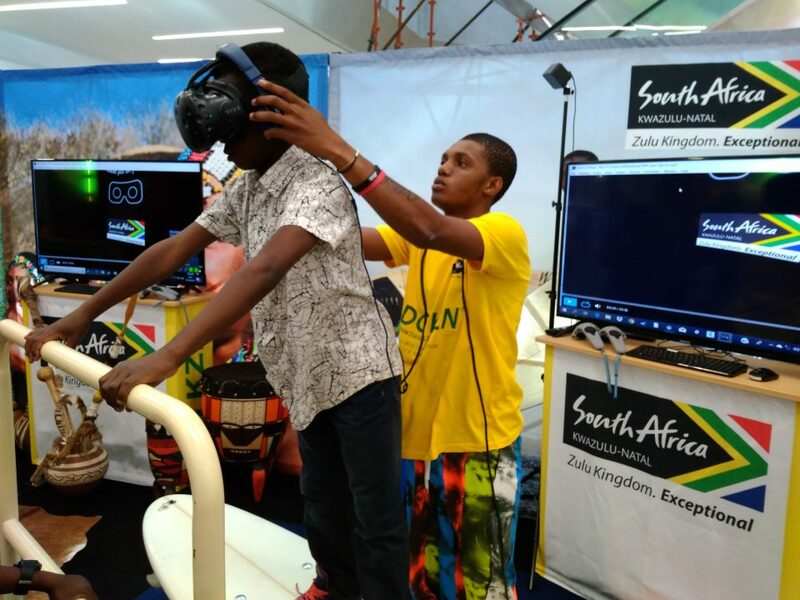 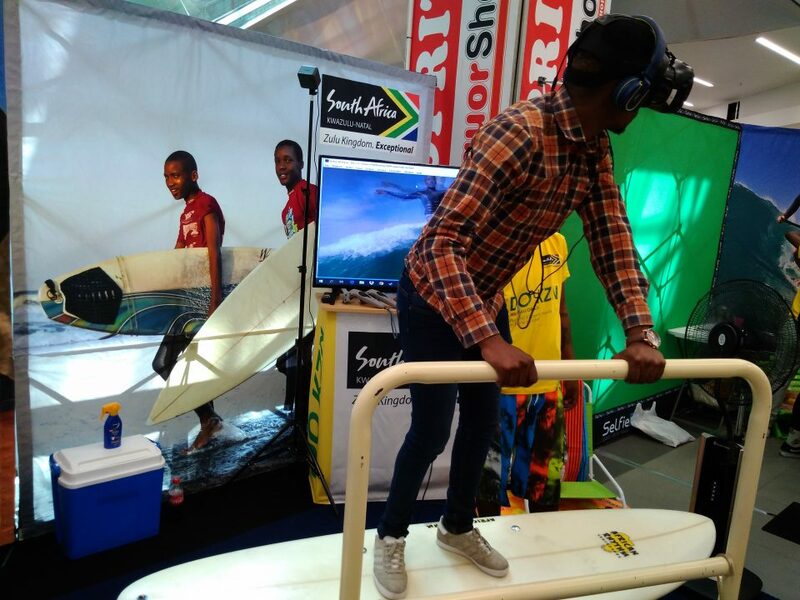 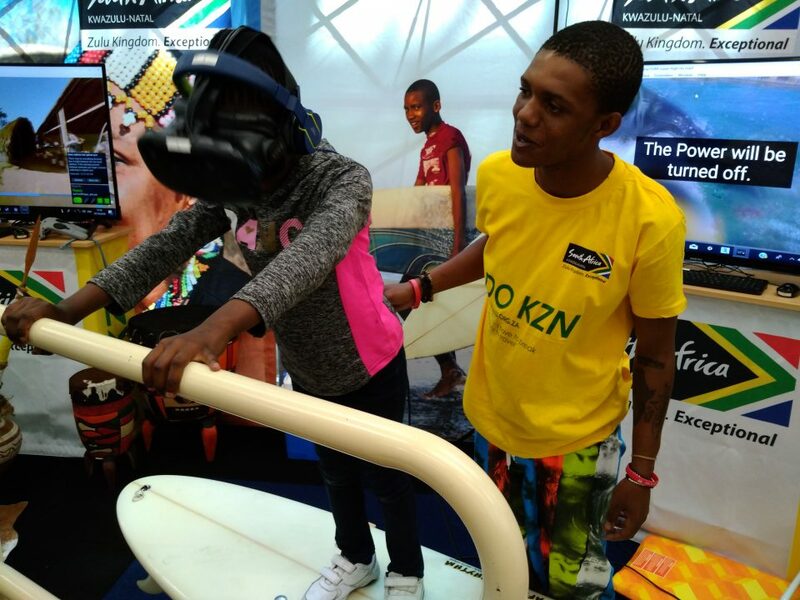 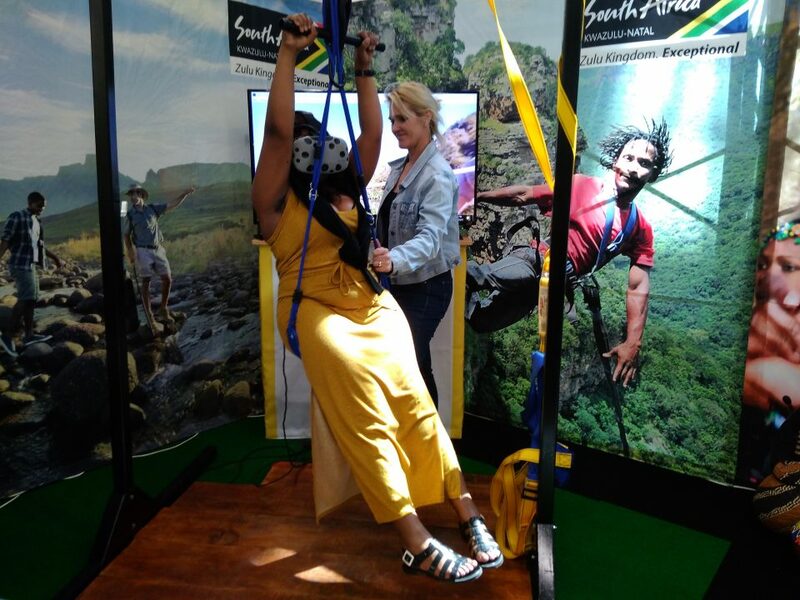 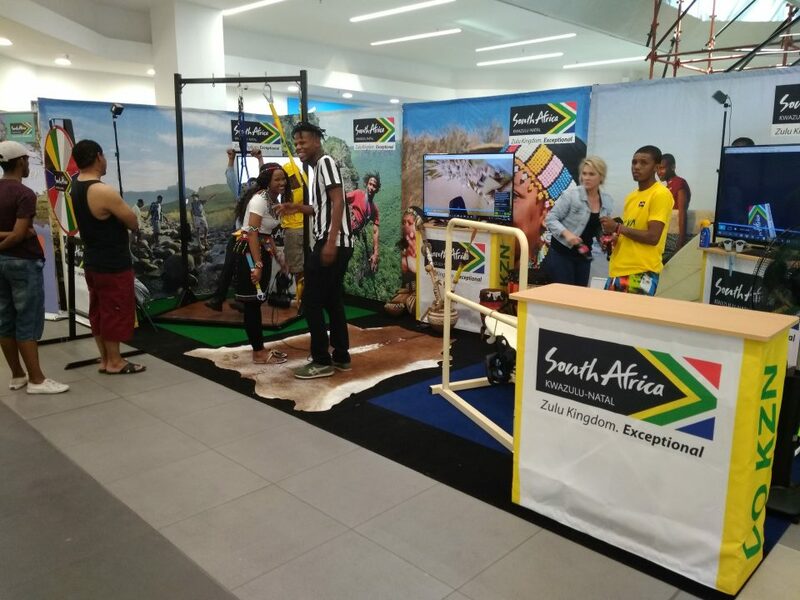 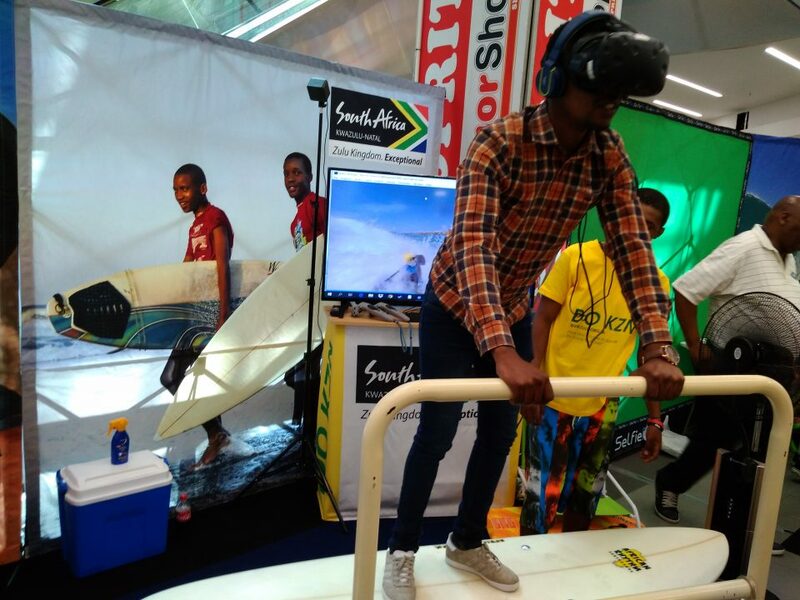 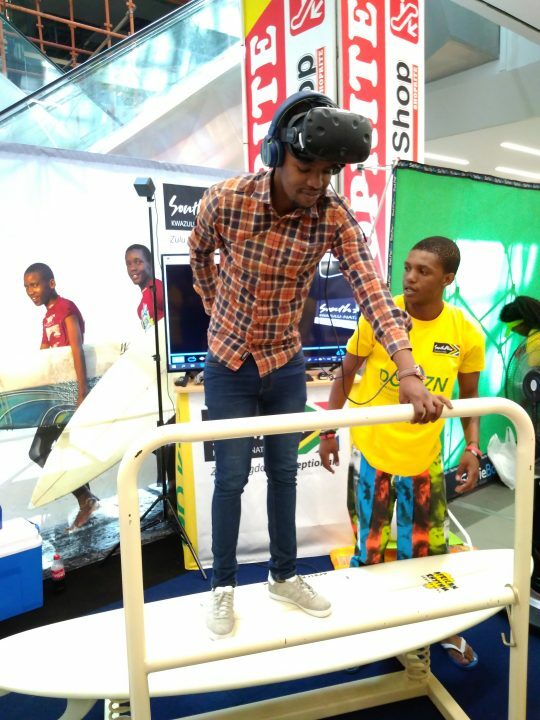 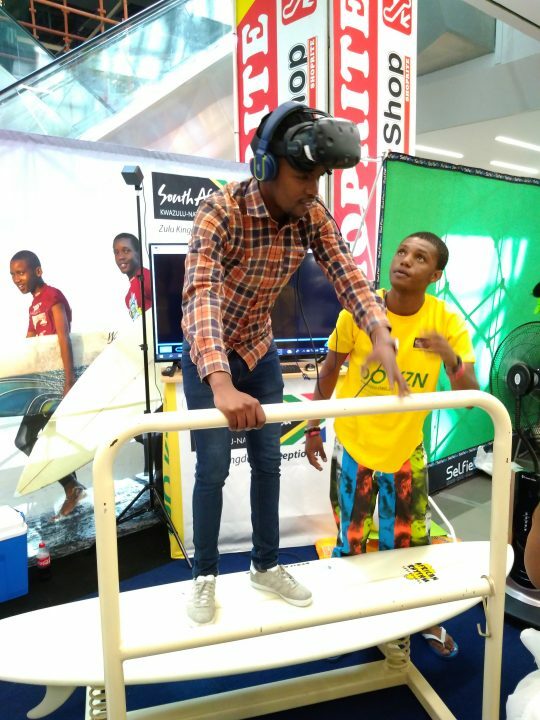 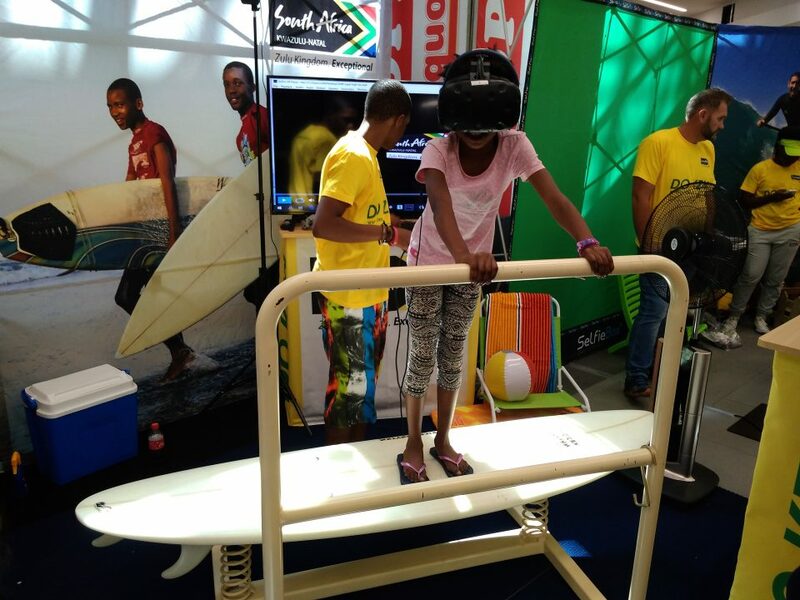 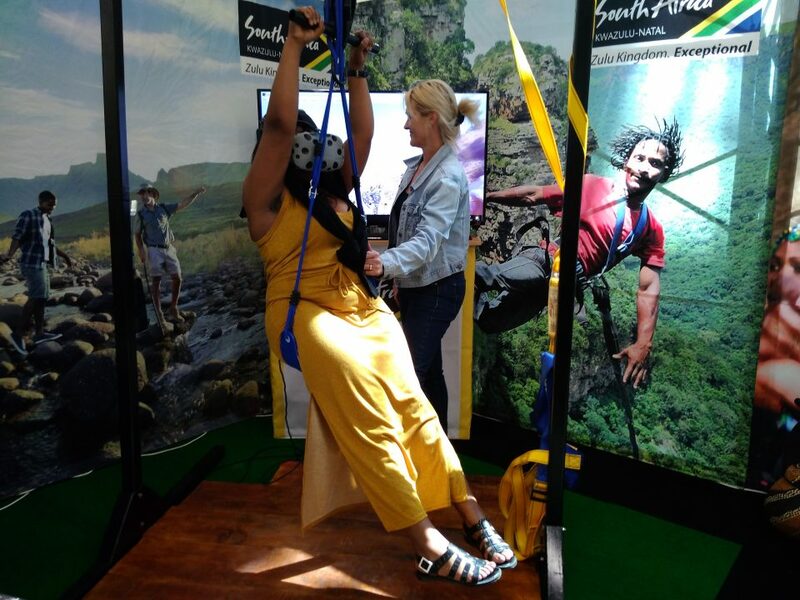 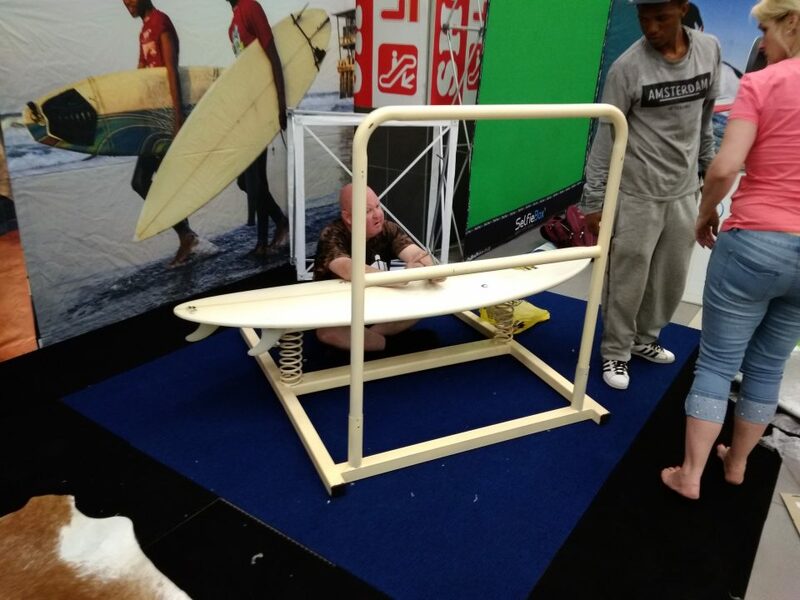 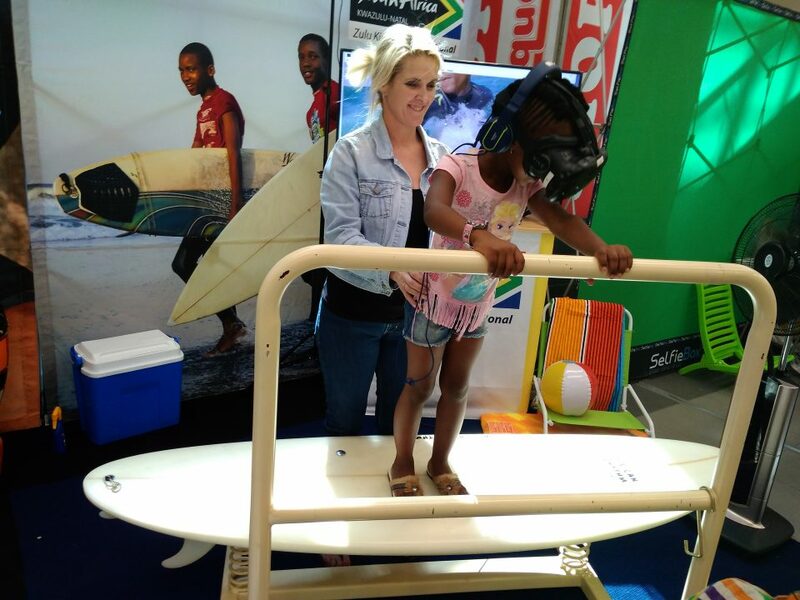 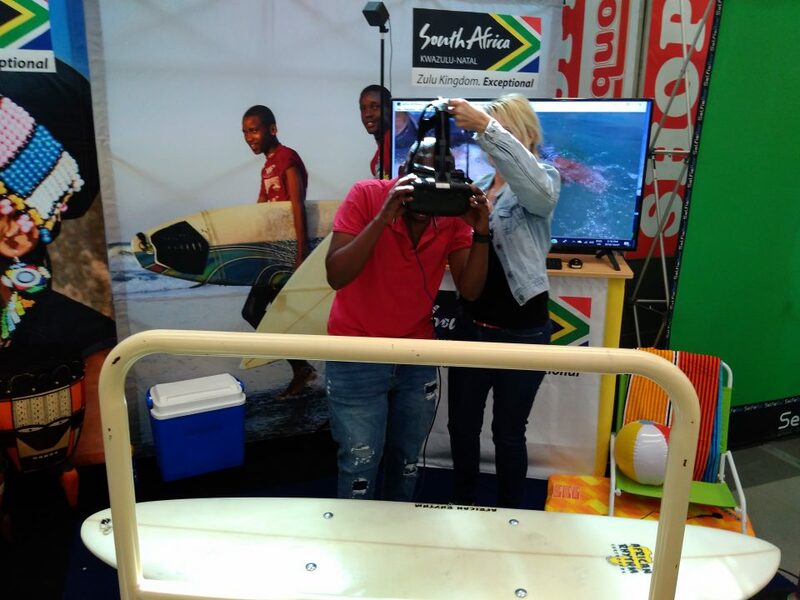 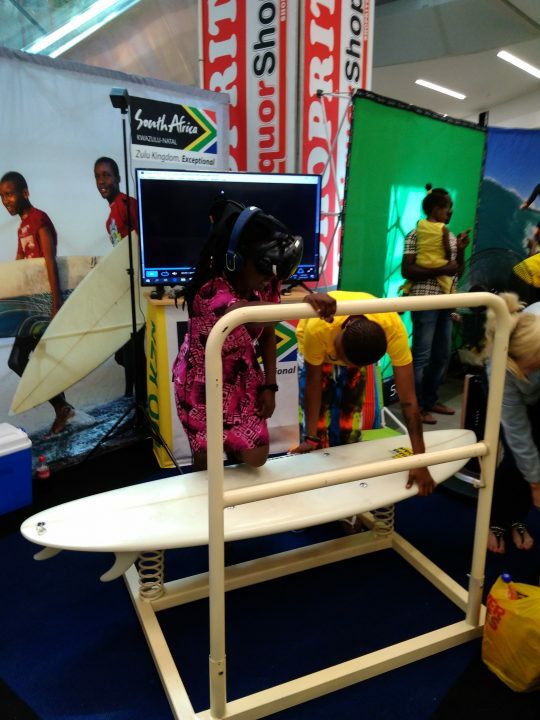 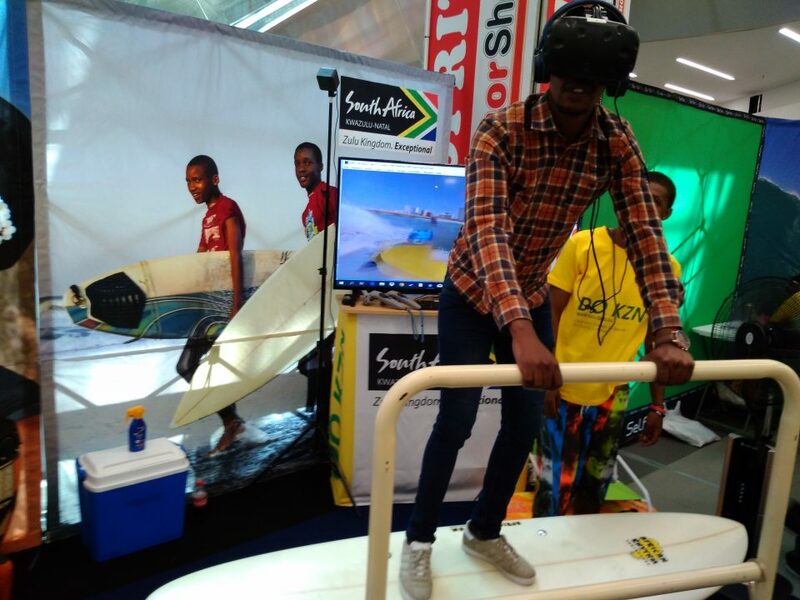 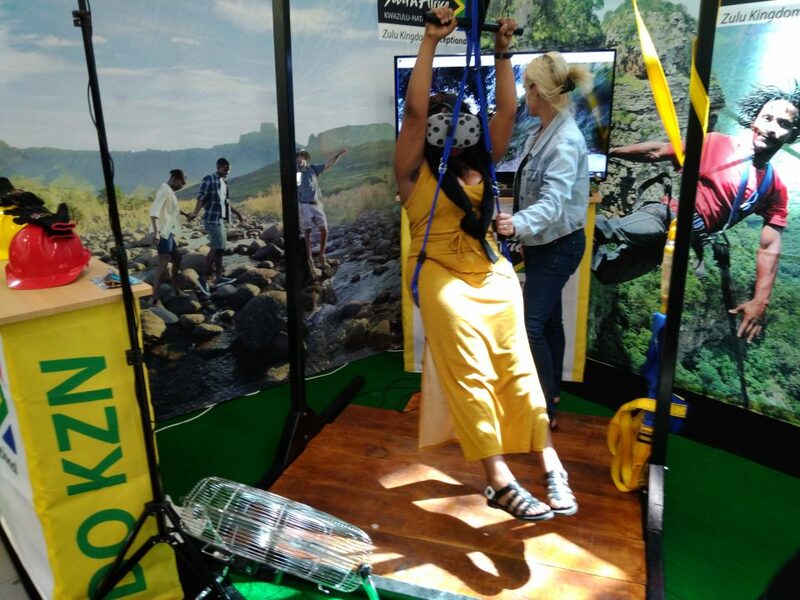 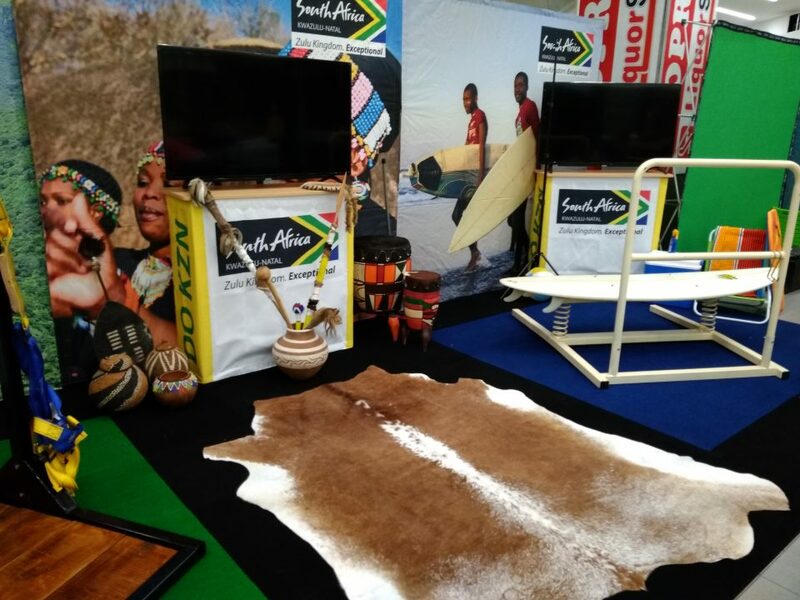 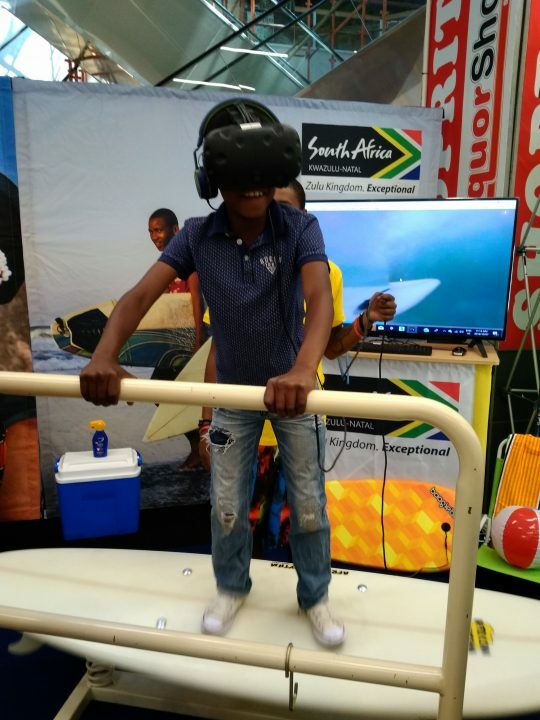 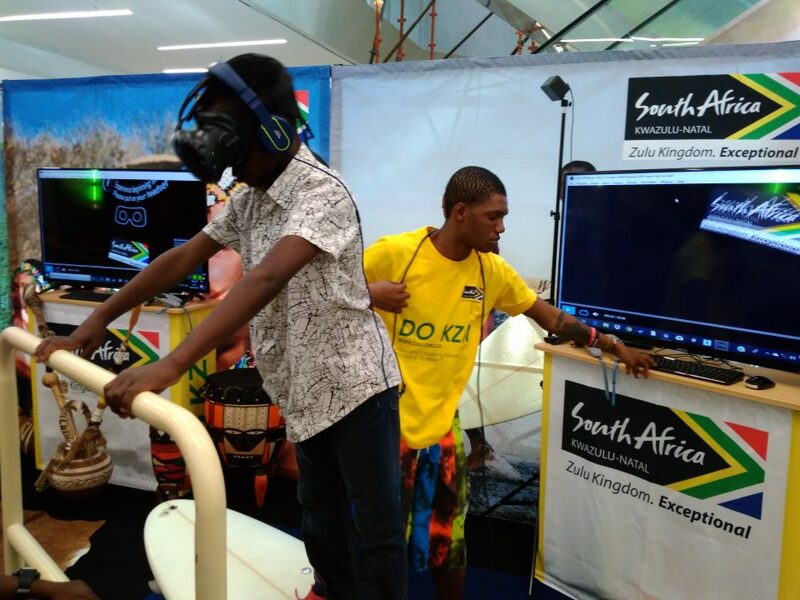 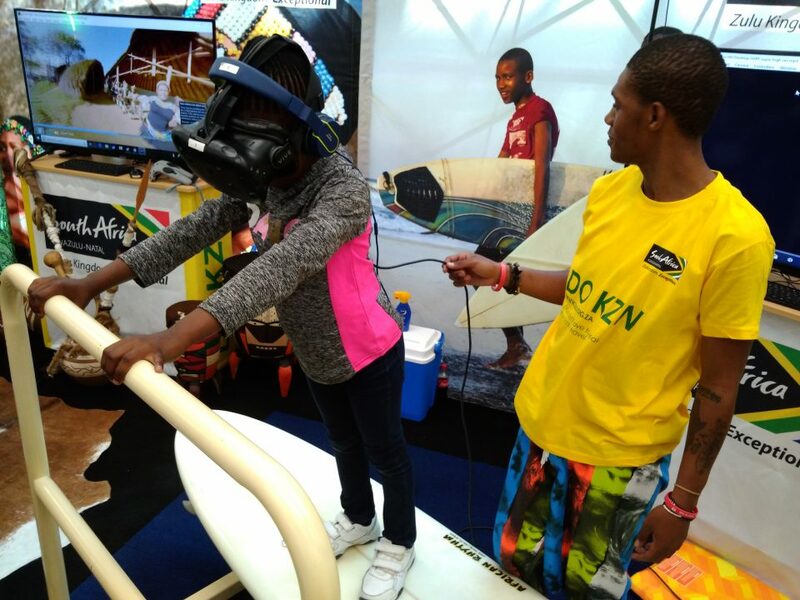 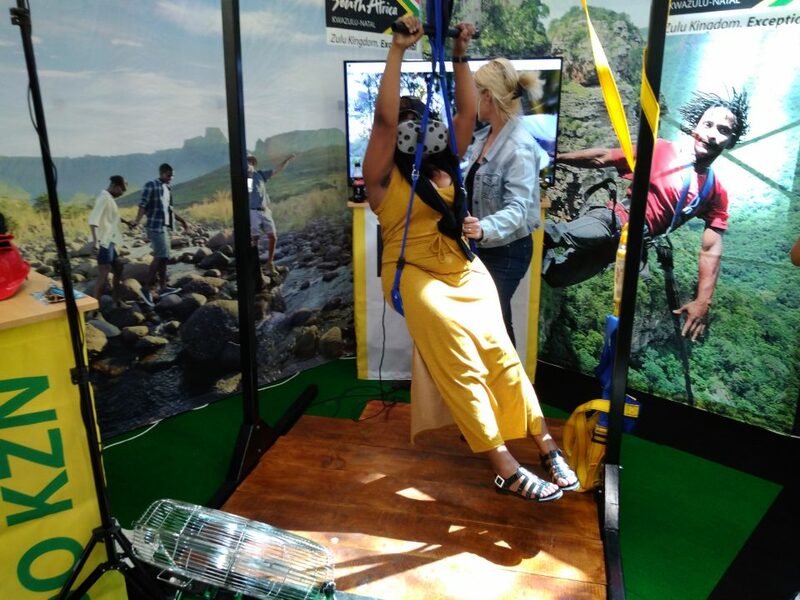 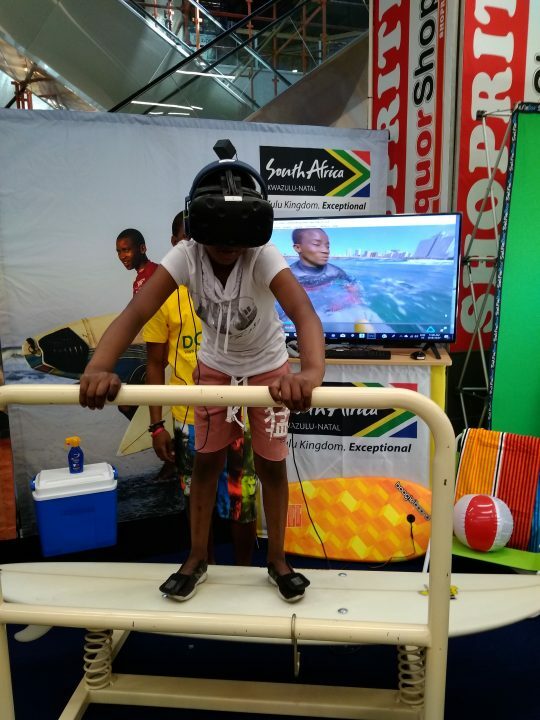 This was the favorite experience at the Macufe KwaZulu-Natal tourism activation and people could not stop talking about how exciting it was to stand in the mall and be transported to Durban and to experience surfing. 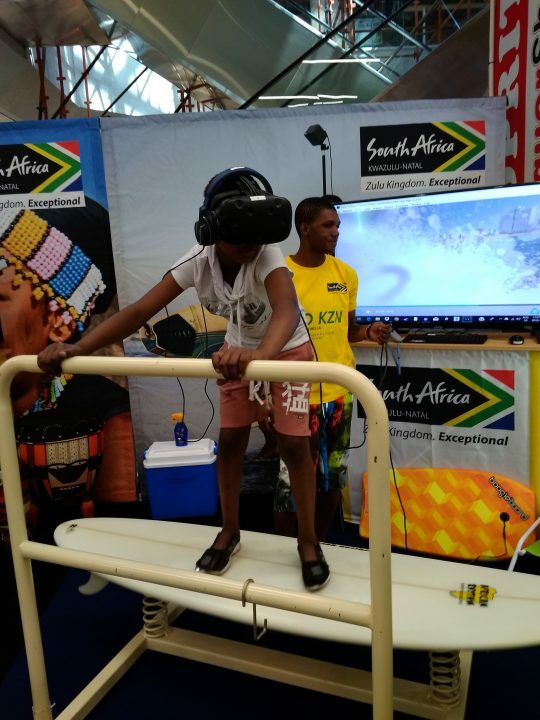 With this virtual reality activation, it was clear again that virtual reality is one of the best tools that we currently have allowing people to experience spaces anywhere. 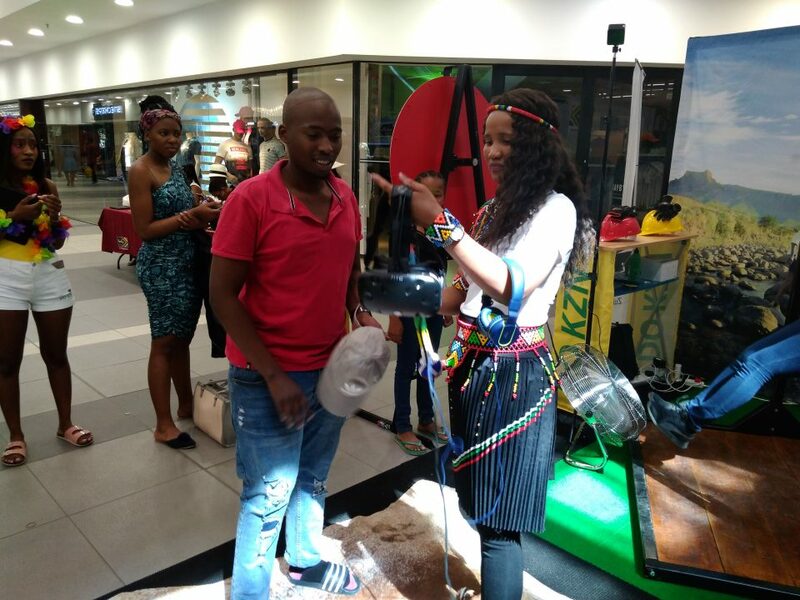 We literally had people experience 3 of the best tourism activities in KwaZulu Natal right there in Bloemfontein without them leaving the mall. 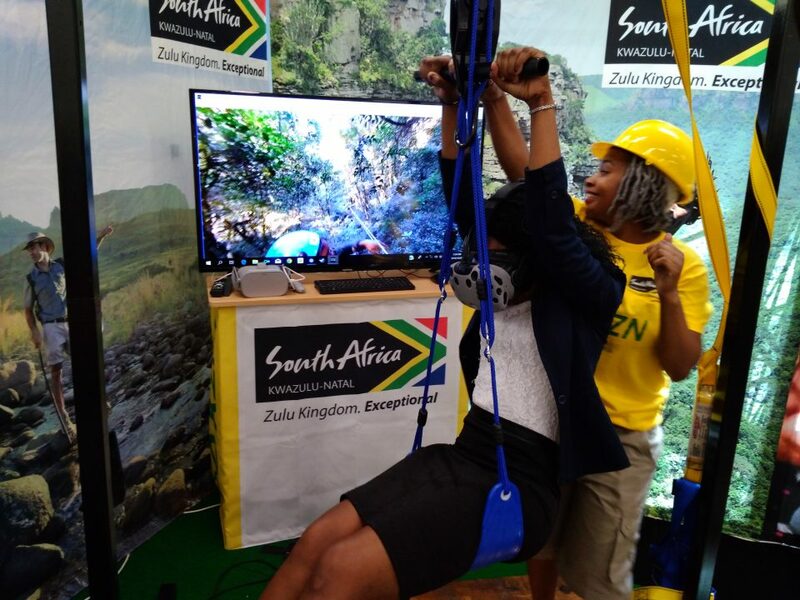 The TKZN Acting chief executive officer, Phindile Makwakwa, explained that “Do KZN” aimed at encouraging people to explore and travel to KZN and with some 180 000 people expected to attend the Macufe, it was the perfect opportunity to expand the campaign. 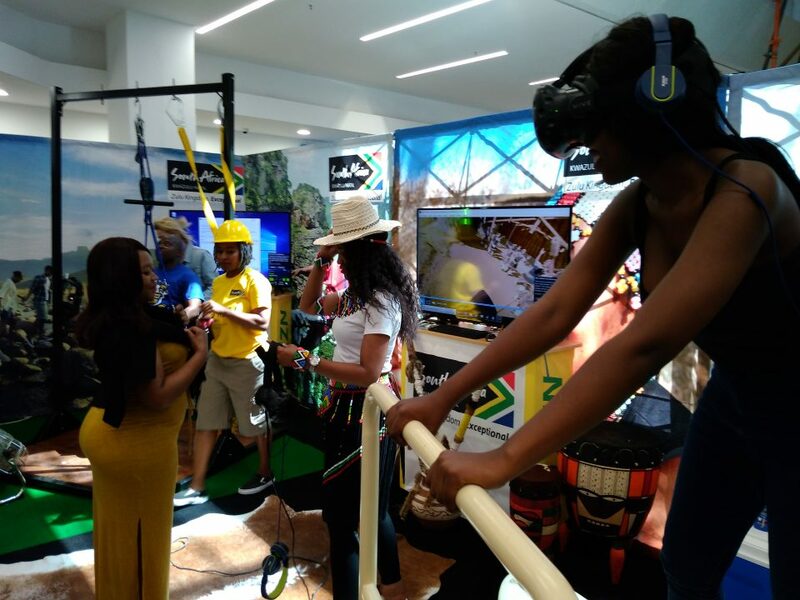 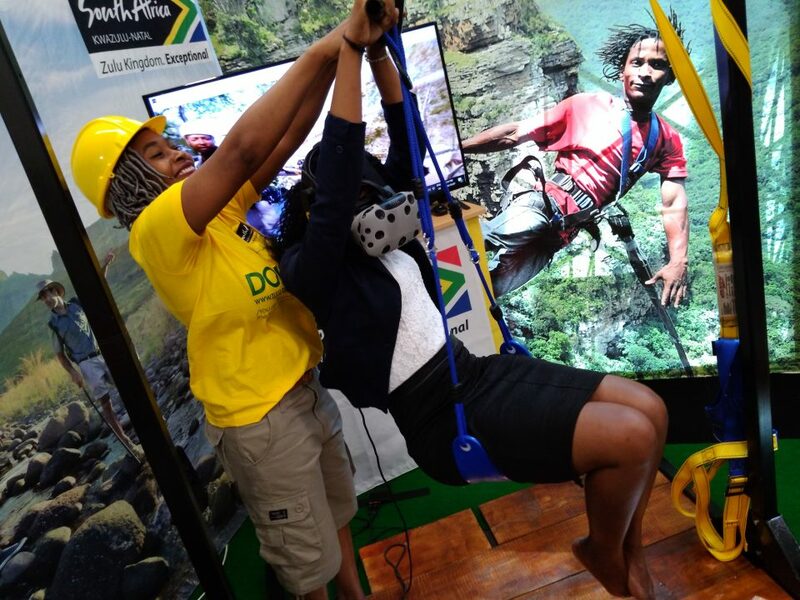 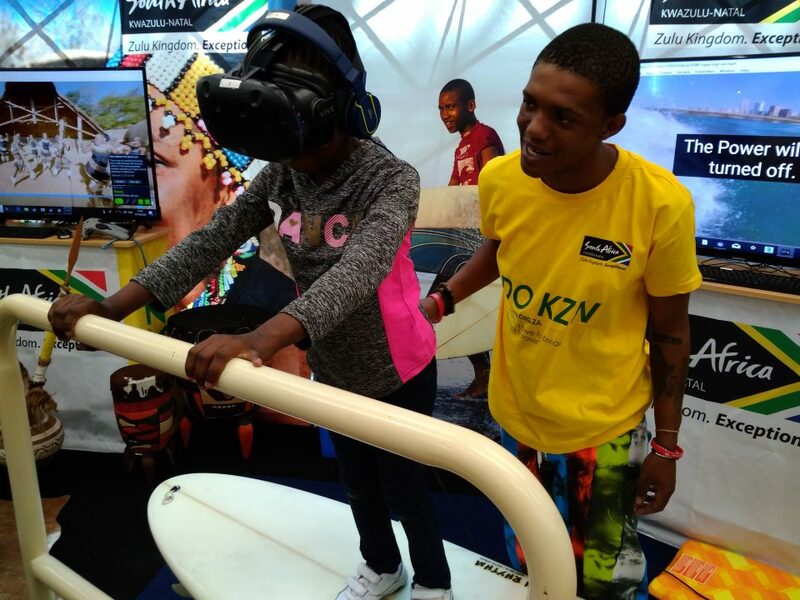 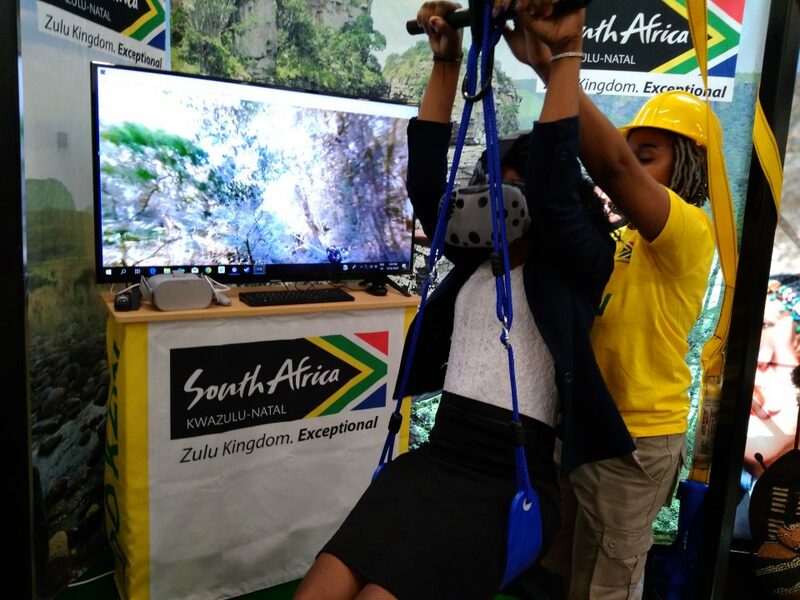 “Our virtual reality experience is the future of tourism promotion and TKZN is taking the lead by allowing potential visitors a glimpse of what we have to offer and what it means to ‘Do KZN’,” Makwakwa said. 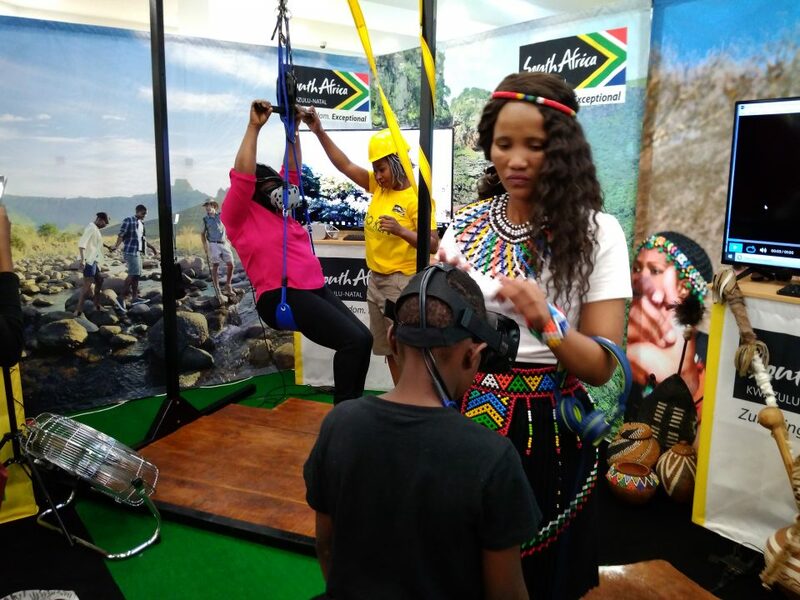 Having just emerged from a “very successful” Tourism Month, TKZN is now busy promoting the region as a destination of choice for the coming festive season. 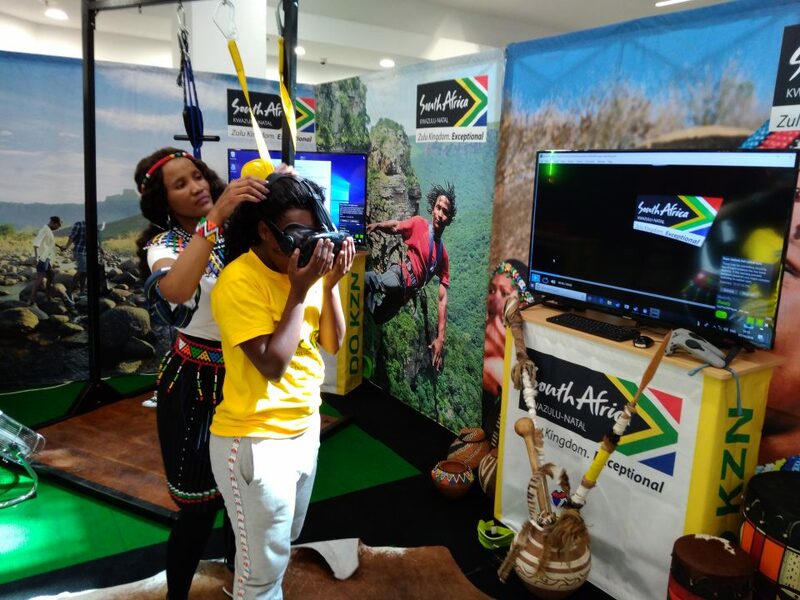 We believe this campaign will push potential travelers to finalize their festive season plans, she said. 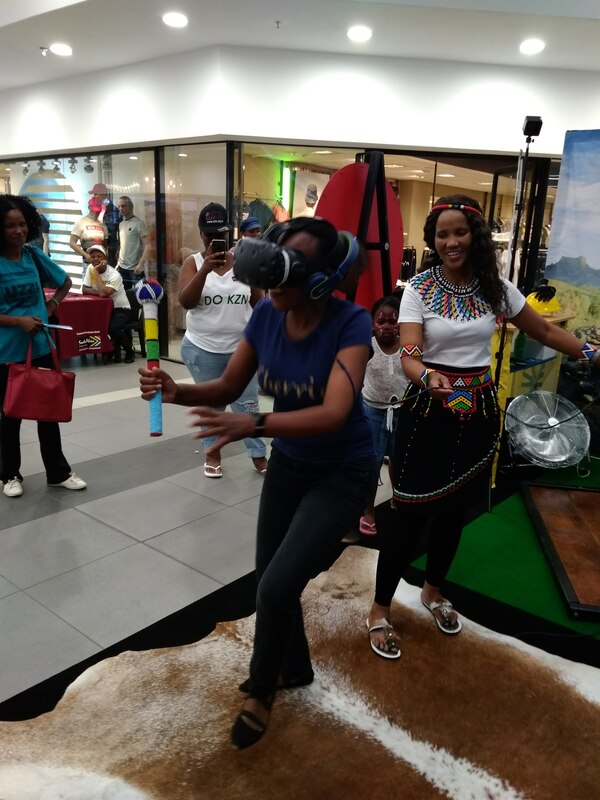 Here is some images that we took during the first day of the Virtual Reality activation in Bloemfontein South Africa. 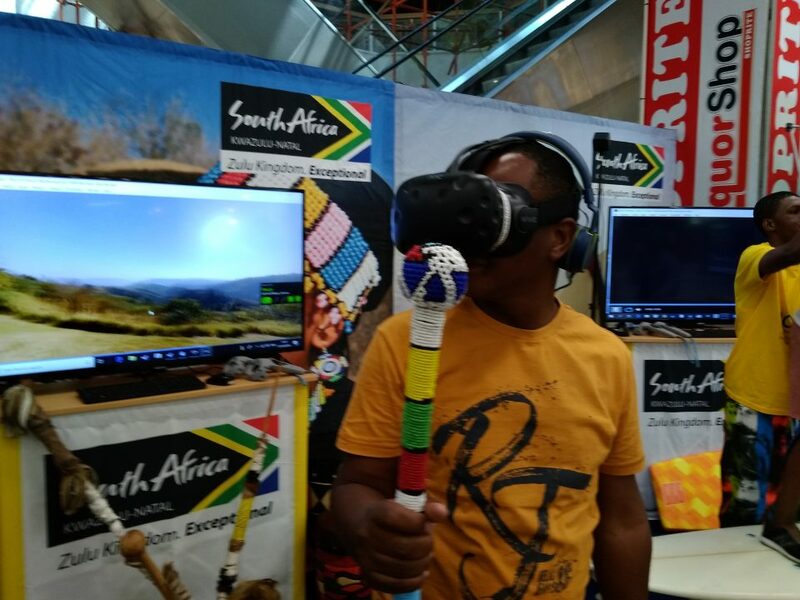 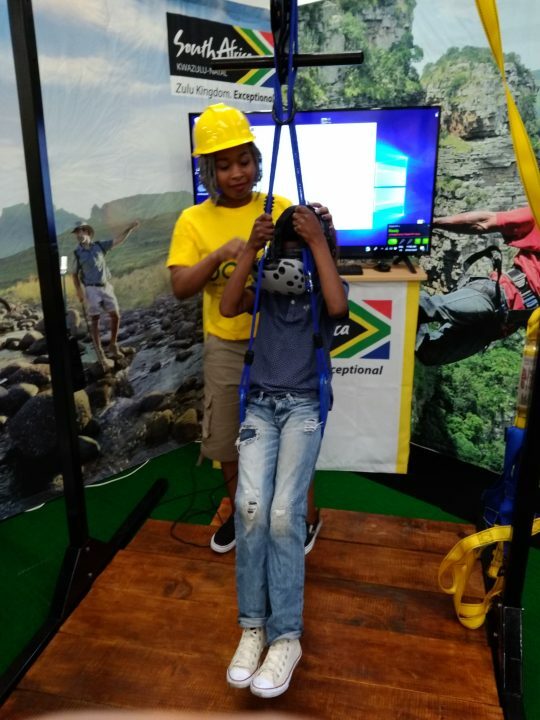 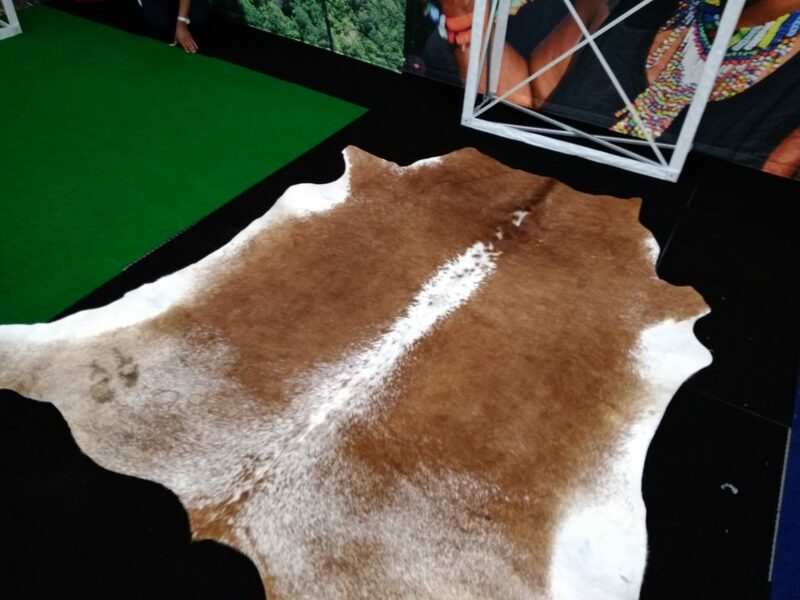 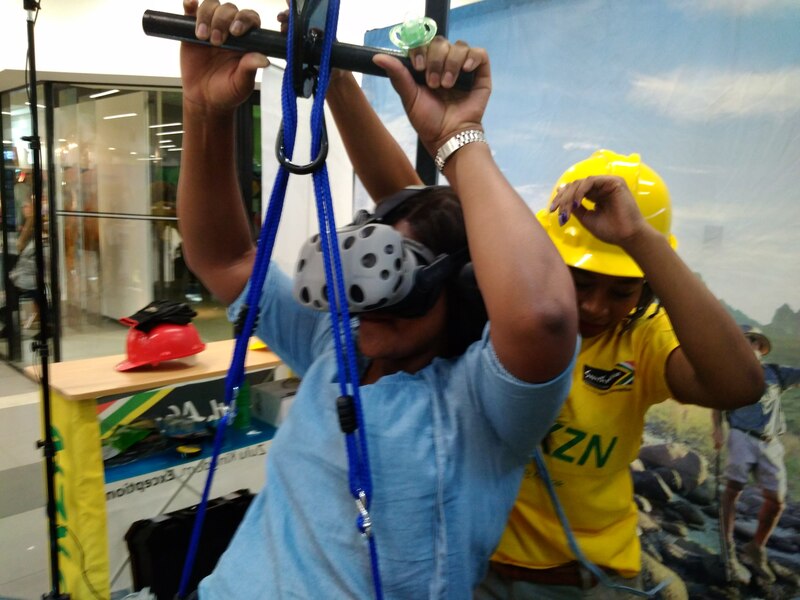 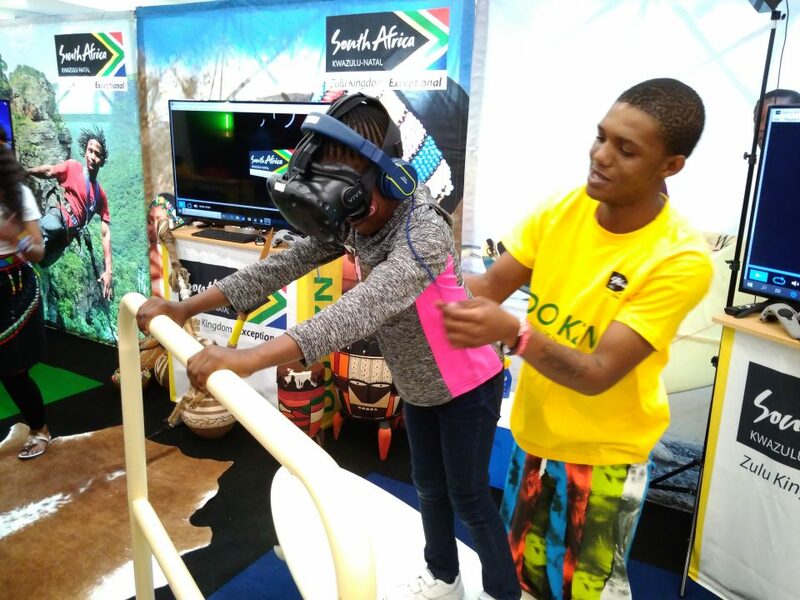 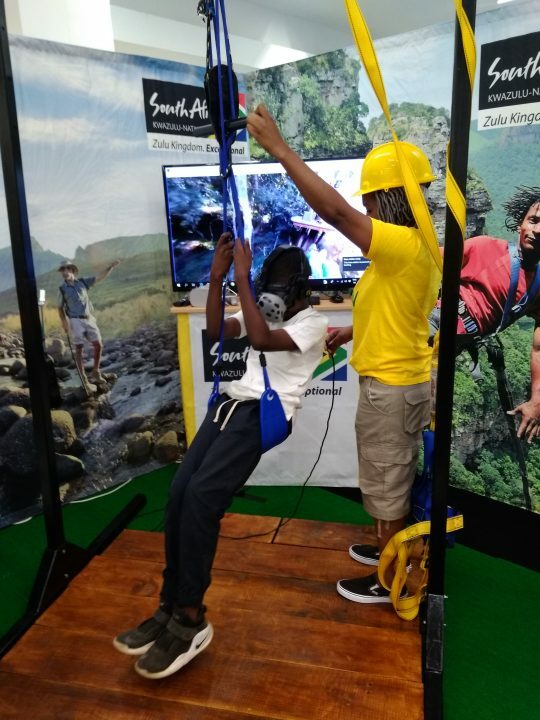 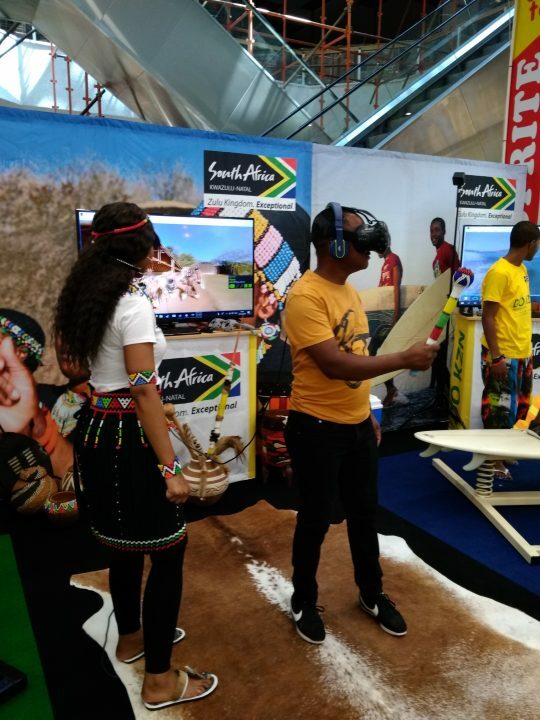 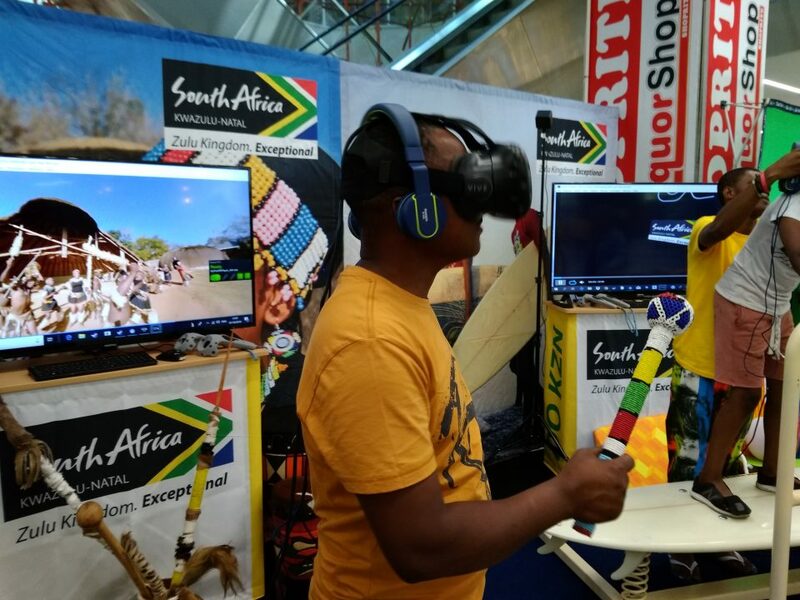 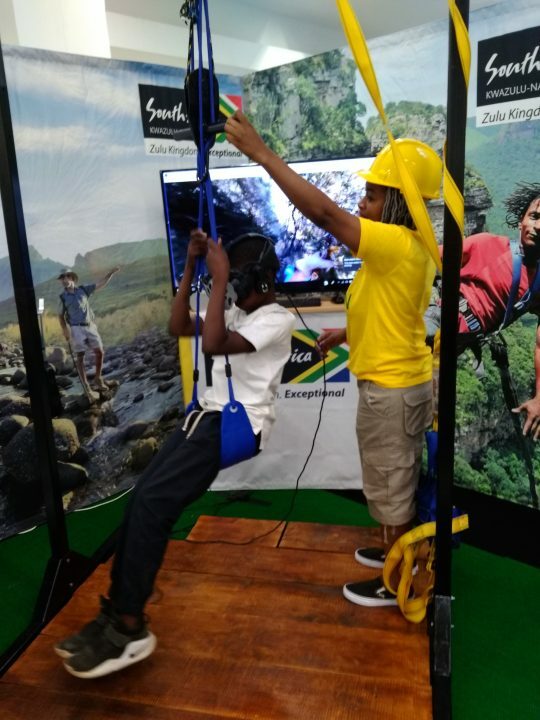 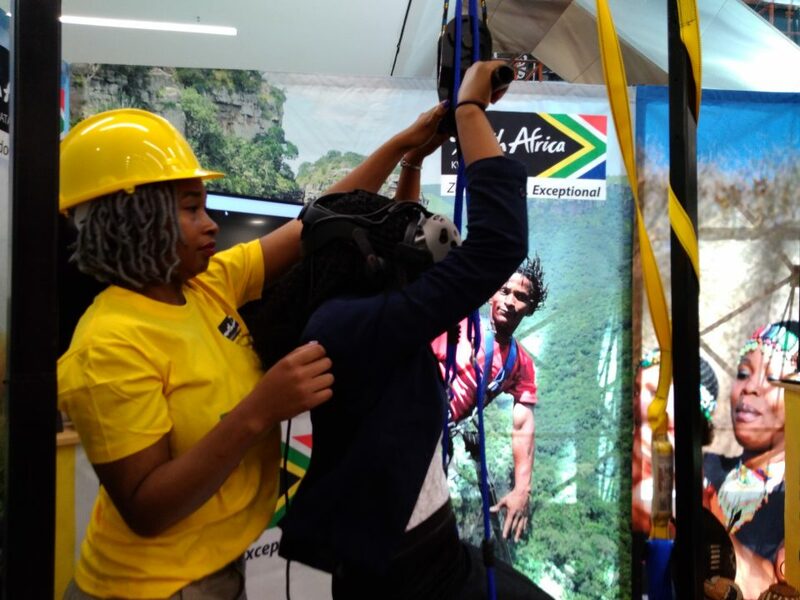 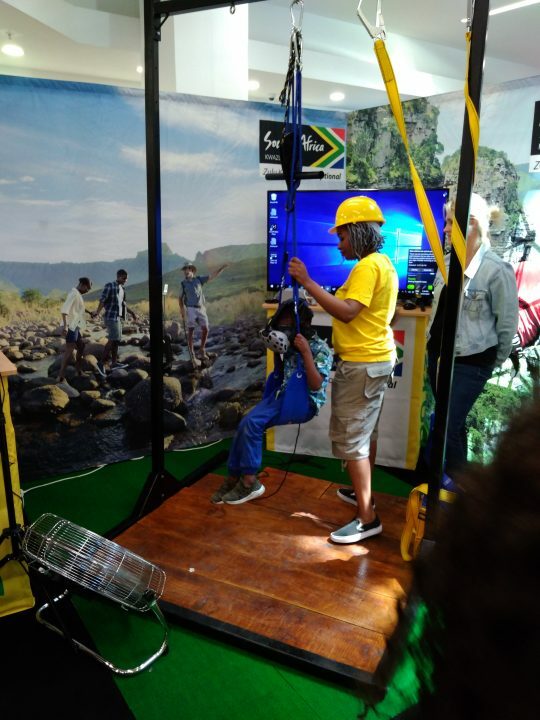 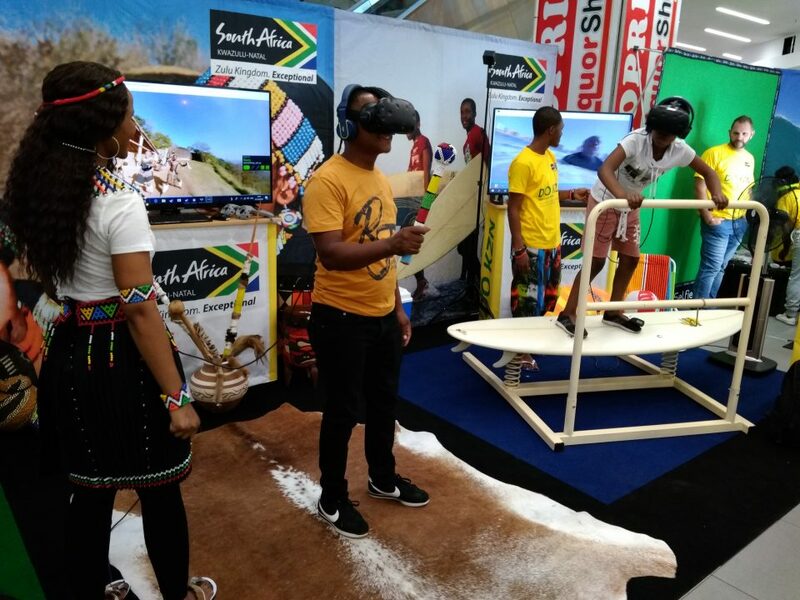 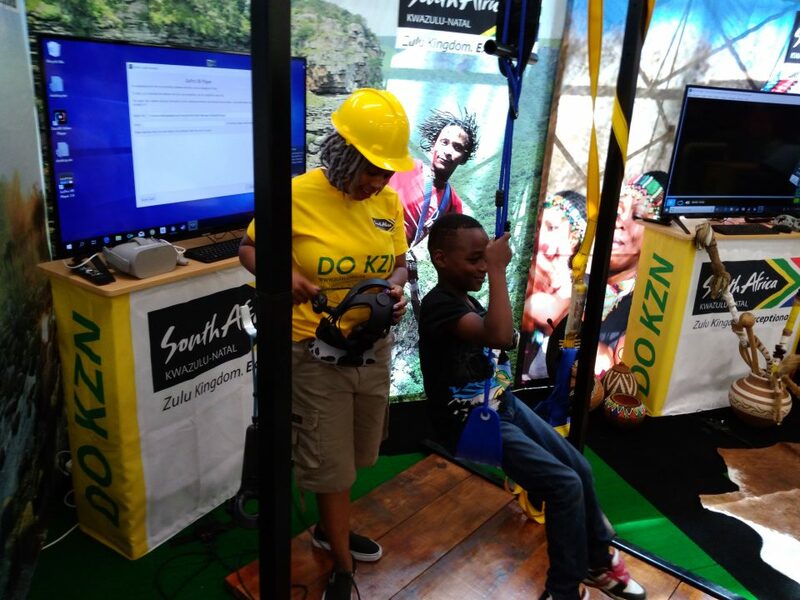 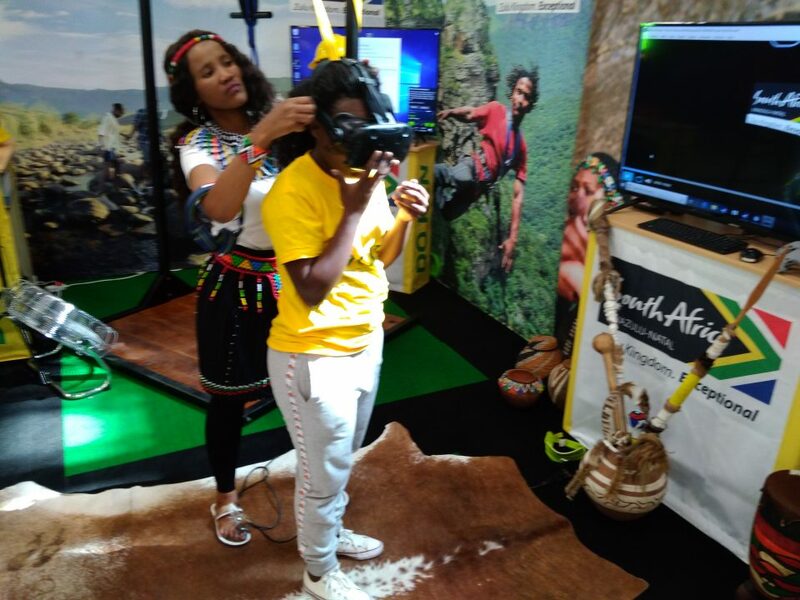 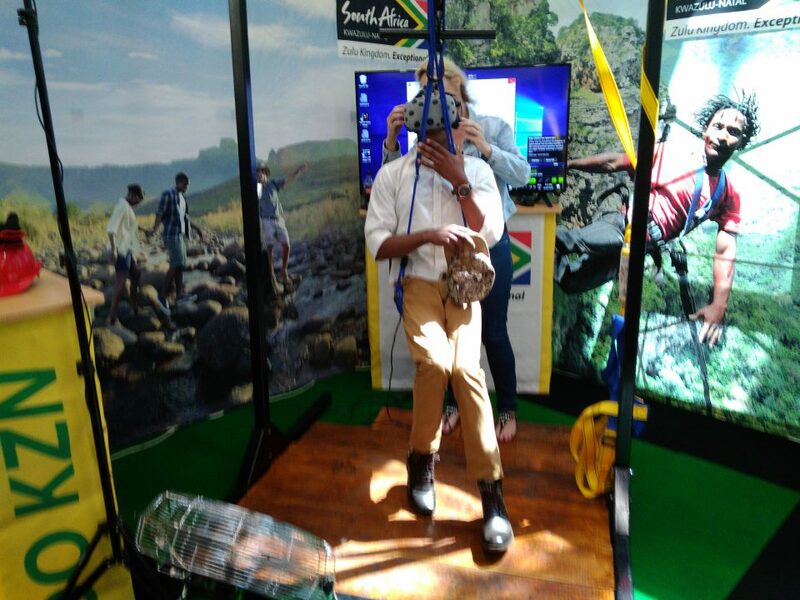 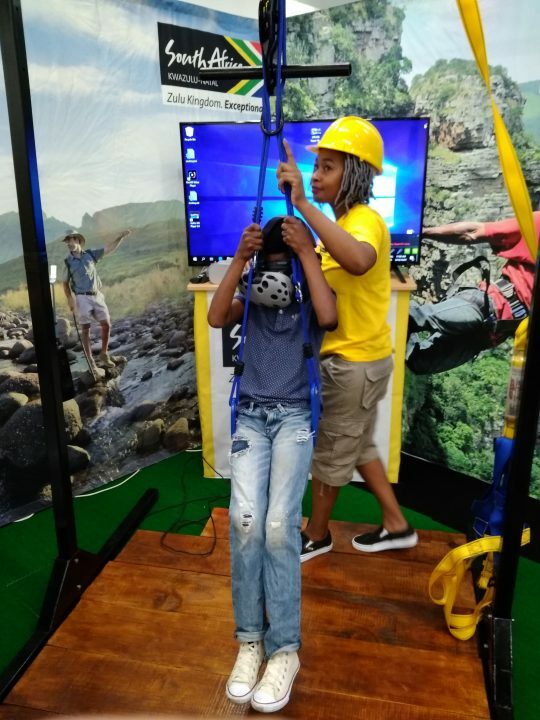 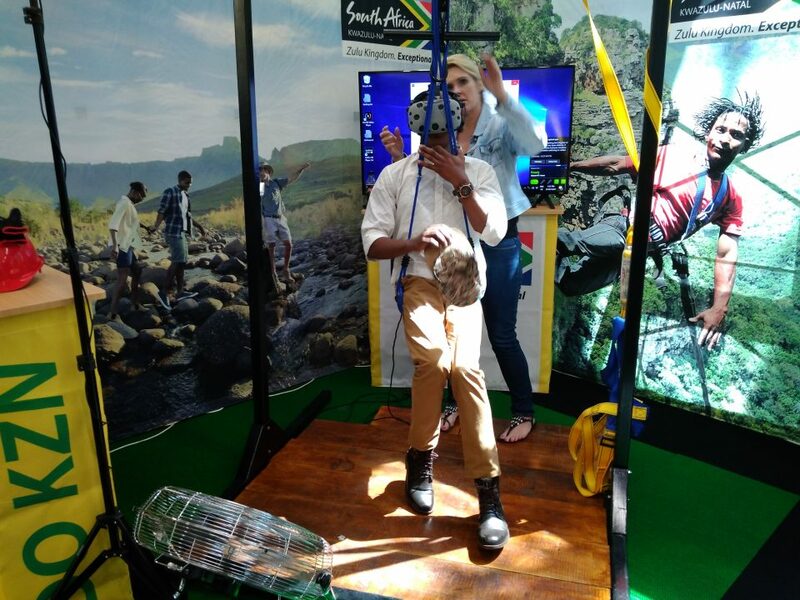 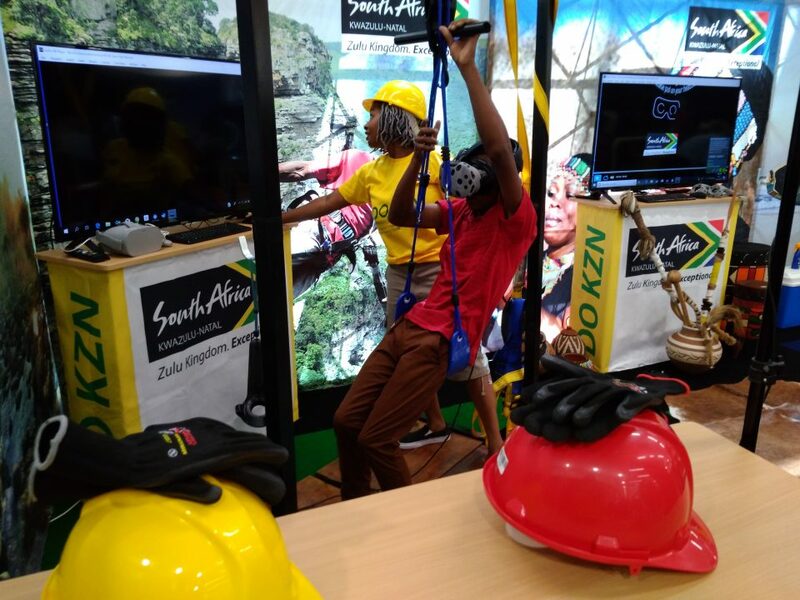 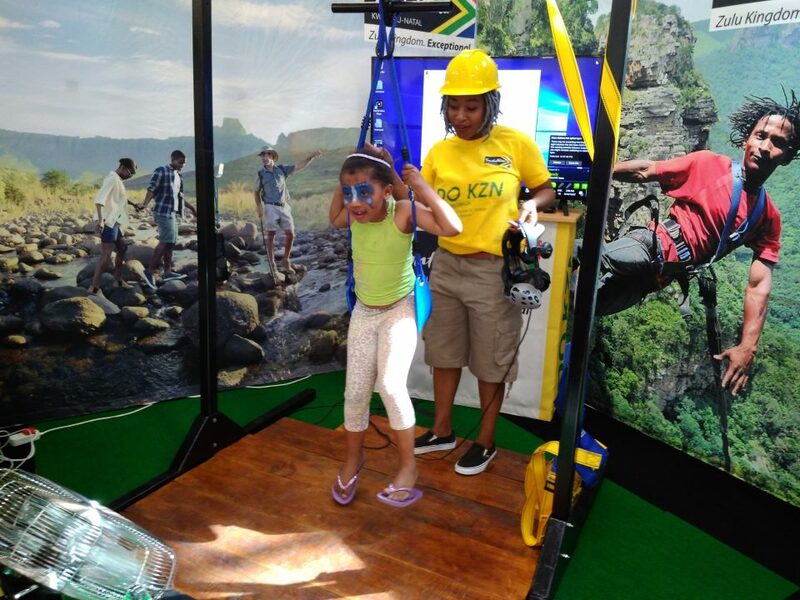 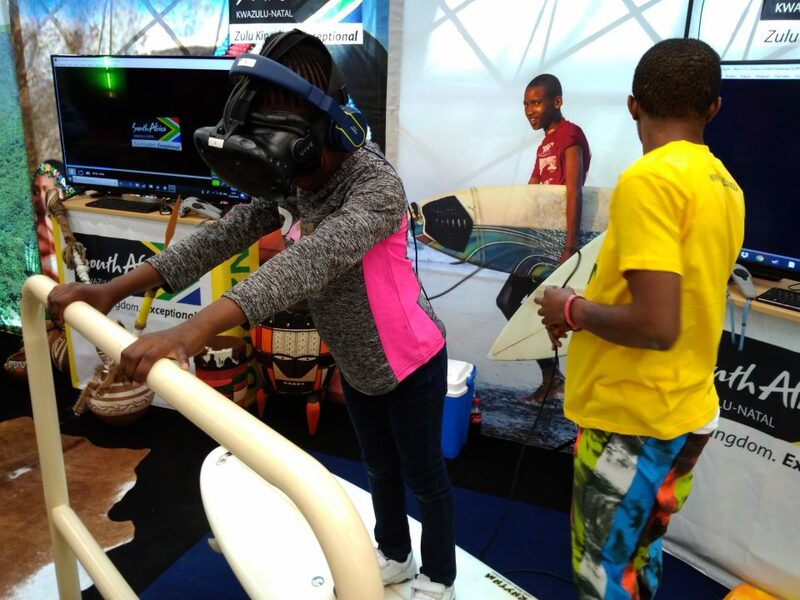 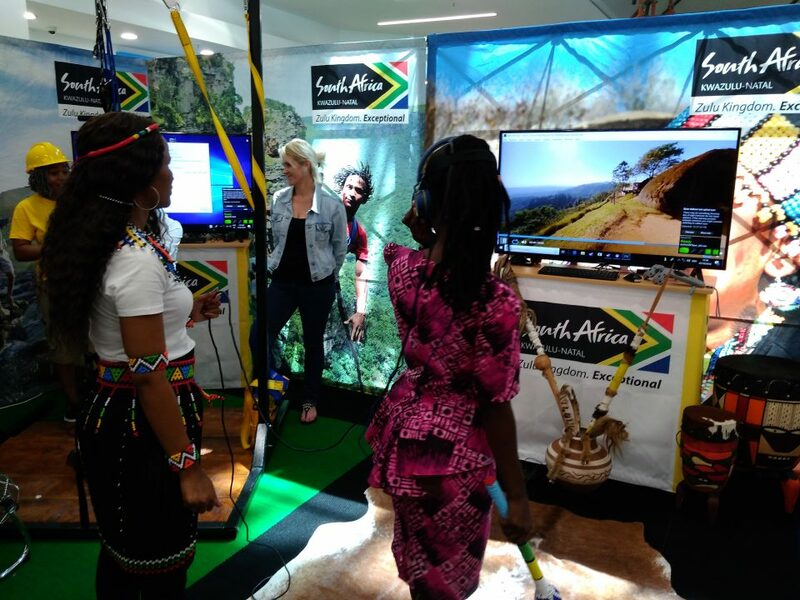 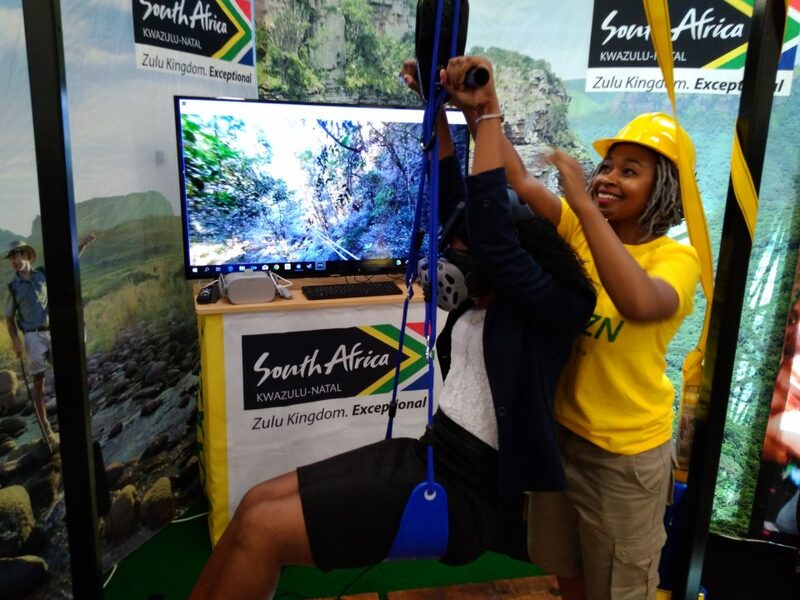 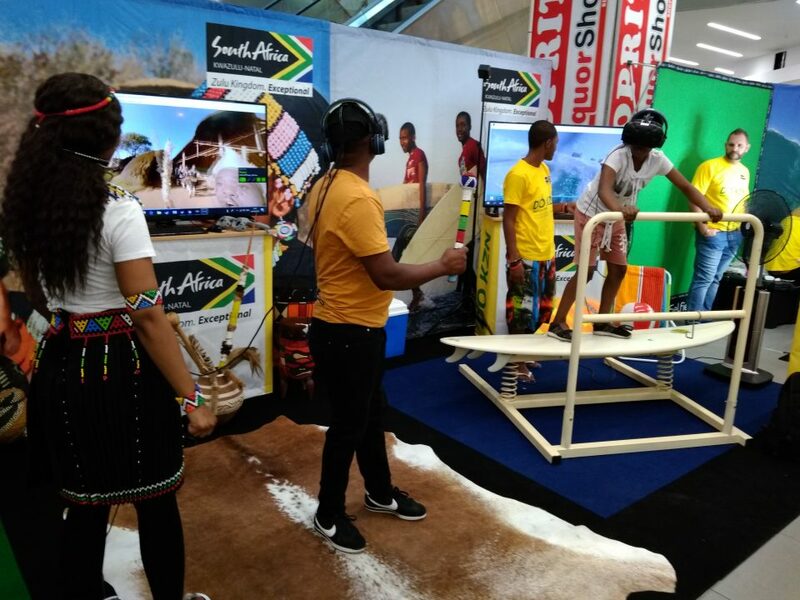 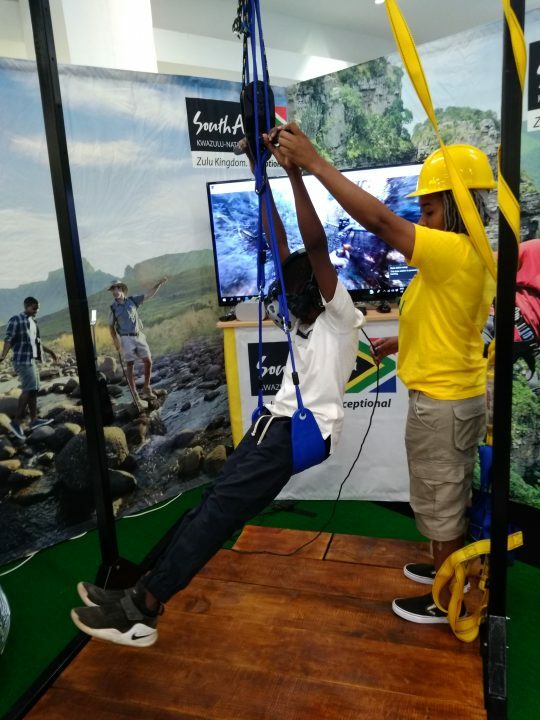 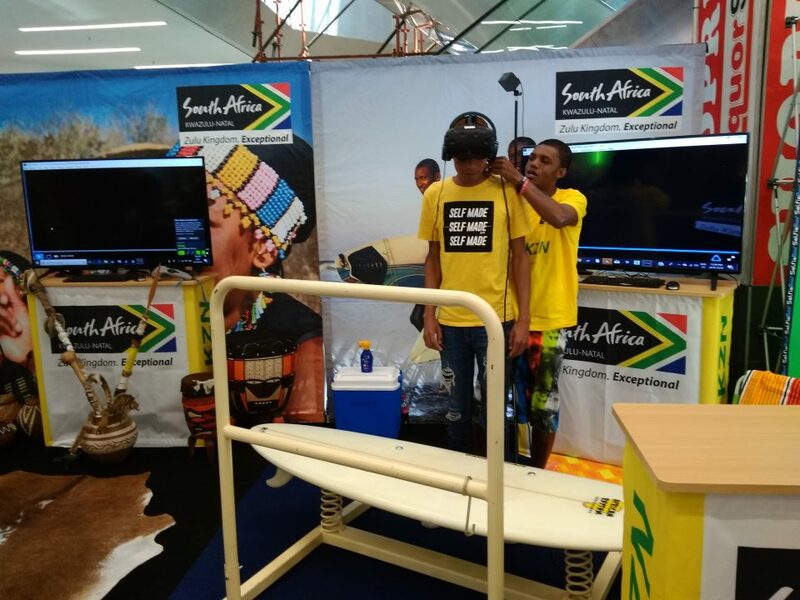 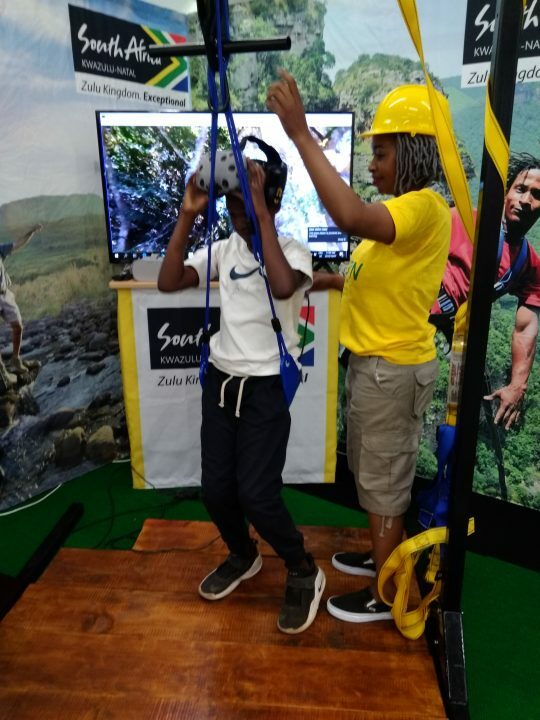 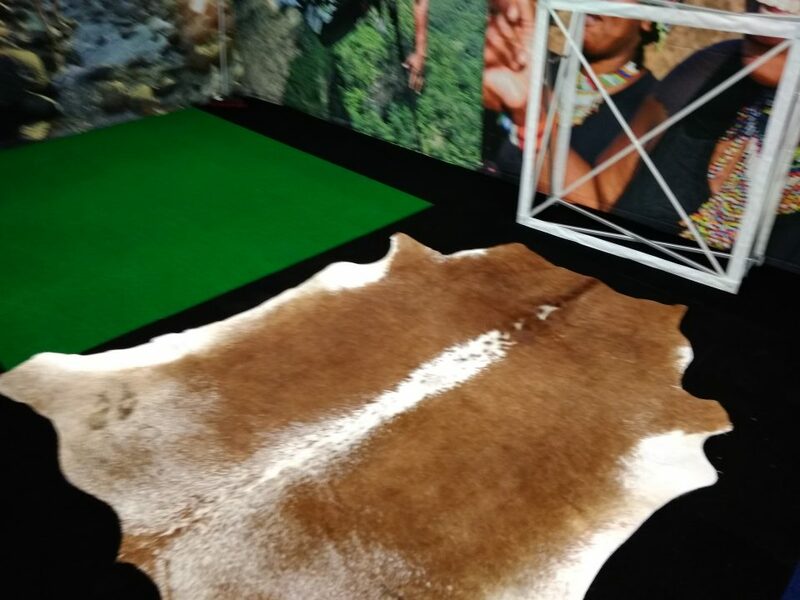 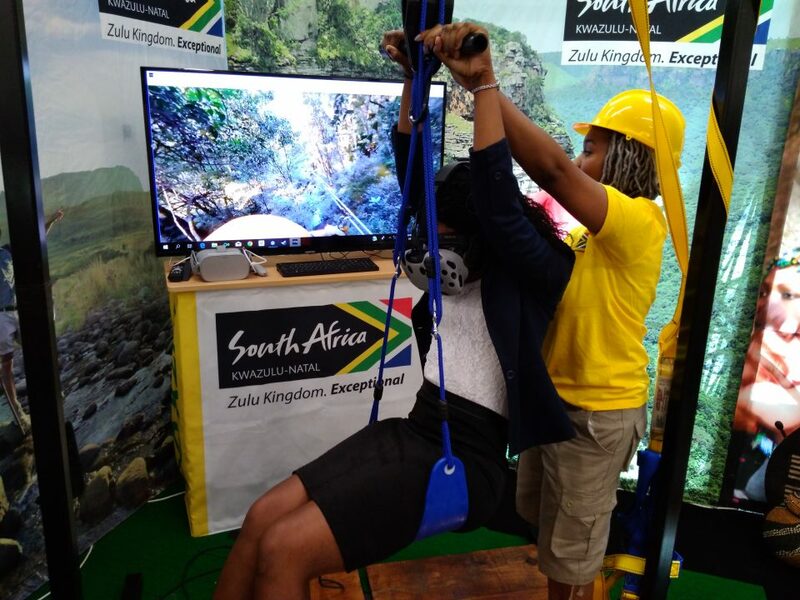 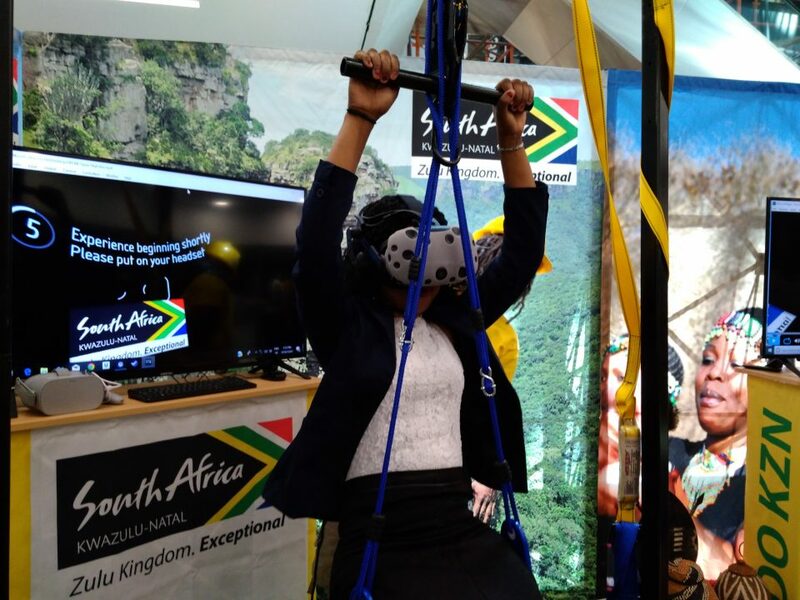 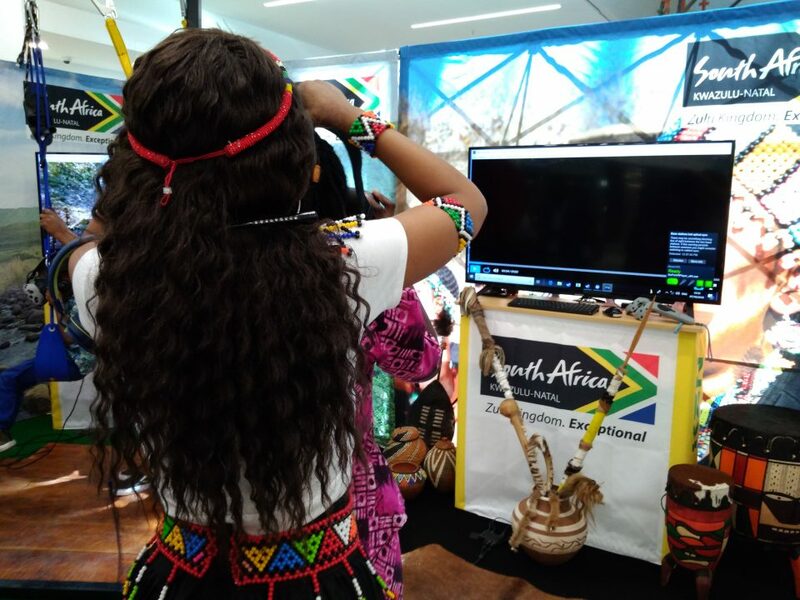 People loved the experience and many people confirmed that after experiencing the activities in virtual reality they are going to visit Kwazulu-Natal to experience these activities for real!